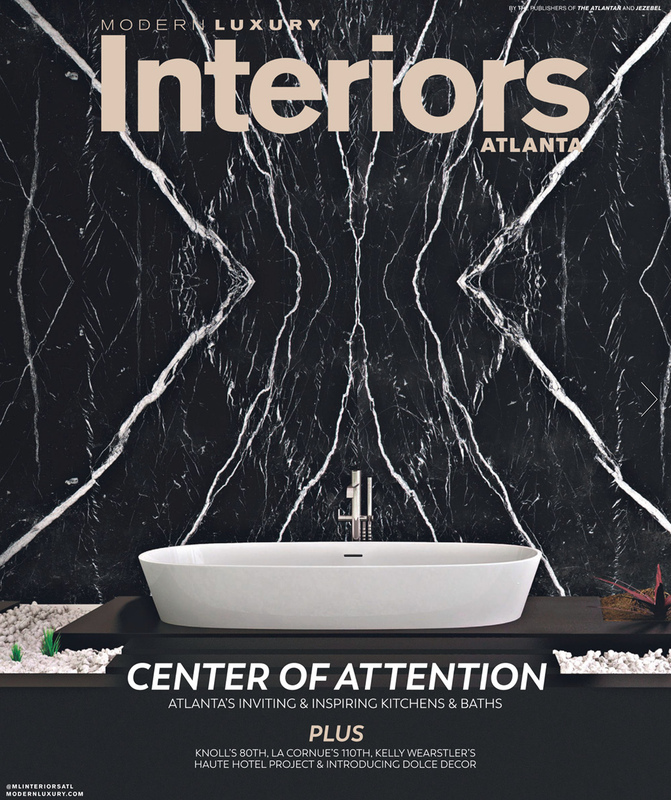 Modern Luxury Atlanta feature article is on the news stand! 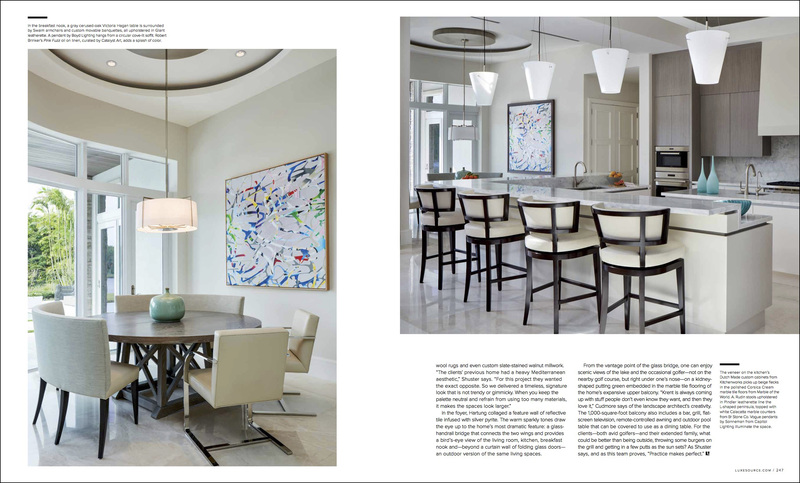 So excited to see this project published in Modern Luxury Interiors Magazine Atlanta Edition. 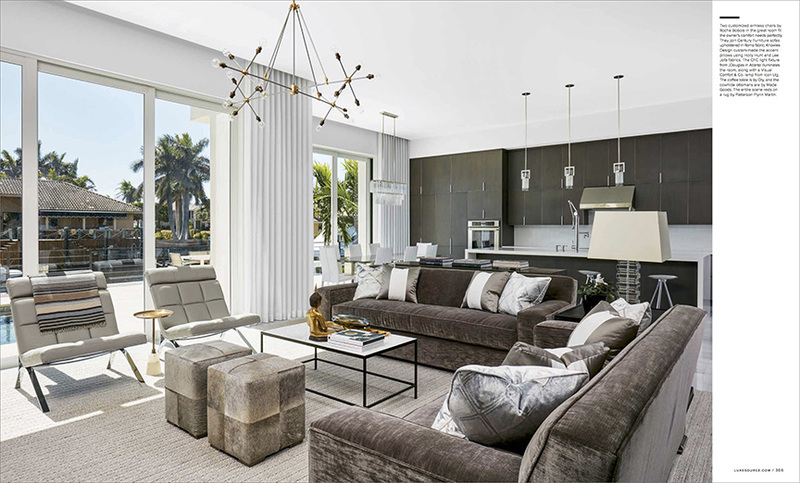 We worked with a fabulous creative team including Joel Kelly Design, Atlanta, Randall Stofft Architects, Delray Beach and On Shore Building, Jupiter, FL. The home is located on the Jupiter Inlet and sits directly across from the historic Jupiter Lighthouse. The lot used for the new home once housed the home of singer Perry Como. 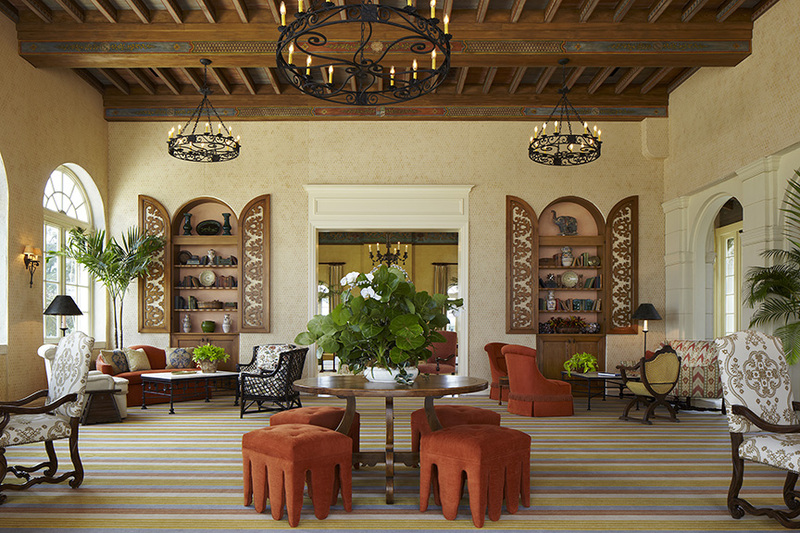 The project, with a budget of $4.5 million, received the ASID Georgia Chapter Gold Award along with the Best in Show Award. Thirteen-foot high ceilings make the kitchen a unique and photogenic space. 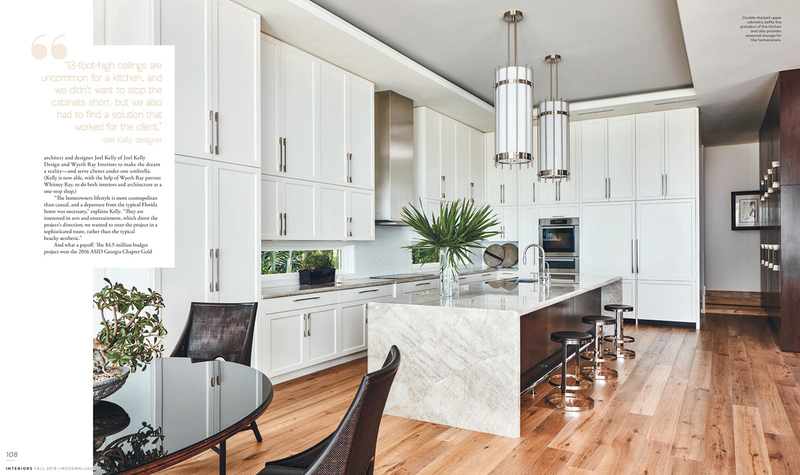 The double stacked upper kitchen cabinetry sets the grandeur of the space as well as provides for seasonal storage for the homeowners. 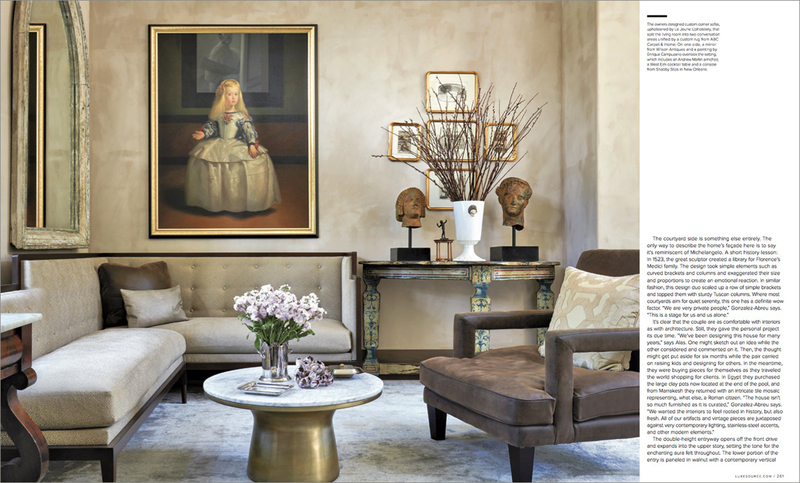 A neutral color palette is used throughout the home by interior designer Wyeth Ray, who worked closely with interior architect Joel Kelly. We spent the day photographing several interiors including the living room, dining room, kitchen, foyer and master bedroom suite. The day ended with two cameras set up on dusk shots of the amazing rear exterior elevation, which included a beautiful pool, patio and fire pit. 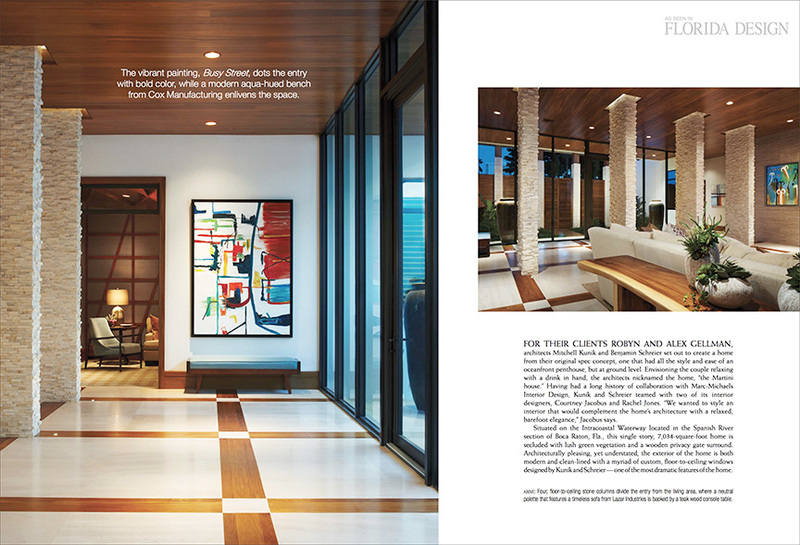 Enjoyed working on a recent Dwell Magazine photography feature which highlighted the home of esteemed landscape designer Fernando Wong and his partner Tim Johnson. 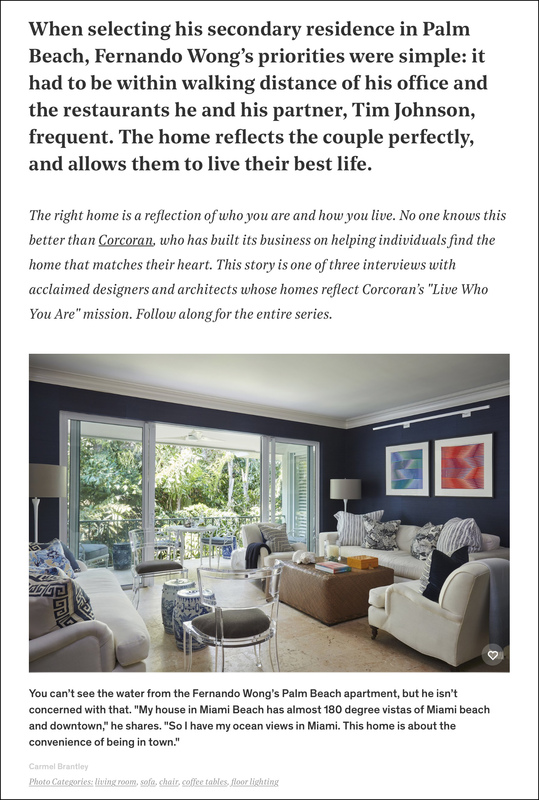 We spent the day photographing interiors and lifestyle images as part of the Corcoran Real Estate “Live Who You Are” campaign designed by Dwell. 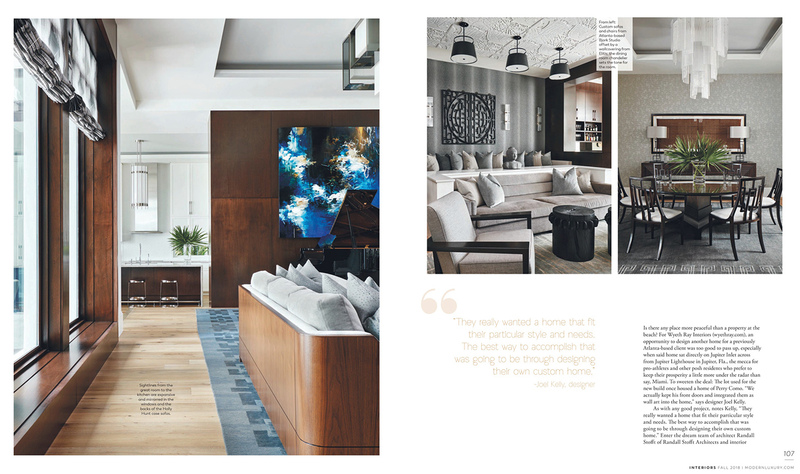 Corcoran selected the apartment, not only for its stunning design, but also because it is the epitome of Corcoran’s #livewhoyouare mission statement. 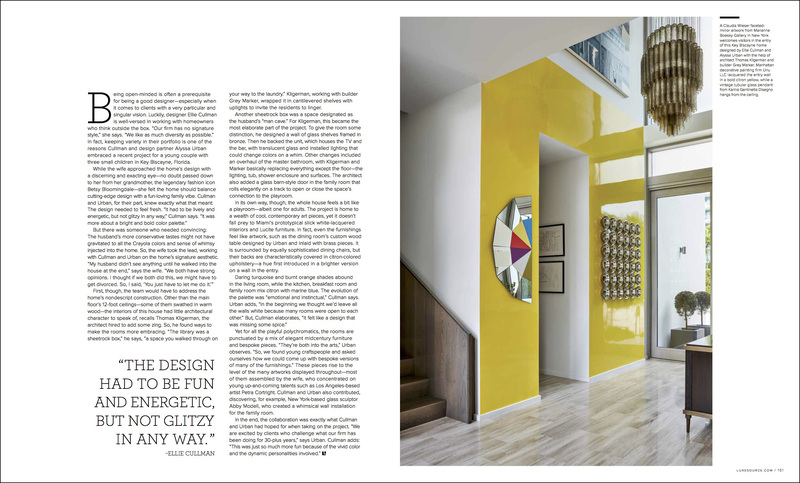 The team at Dwell handled the art direction and layout. Always a pleasure working with Fernando and Tim who were more than patient as we set up the shots. Not always easy incorporating models into the interior photos. Our goal was to get a natural feel in both the lighting and the models. Add in dark blue walls and light furniture you have quite a challenge on your hands! Thank you to everyone involved in making this story a reality. Hope your home lets you live who you are! Our home does!! 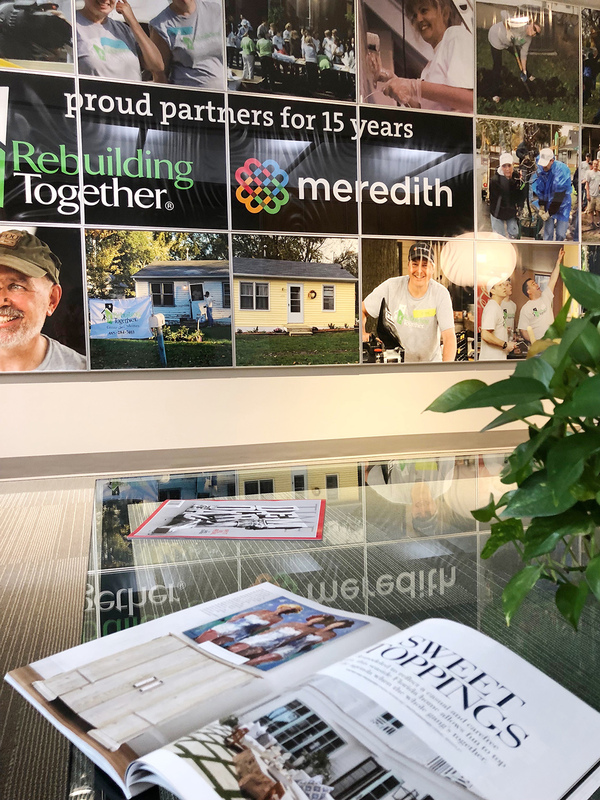 Enjoyed a wonderful tour of Meredith Publishing Headquarters recently. Toured their fabulous photo studios, prop storage rooms, and test kitchens. Sampled a delicious shrimp stir fry recipe which will be featured in the December issue of Better Homes and Gardens Magazine! 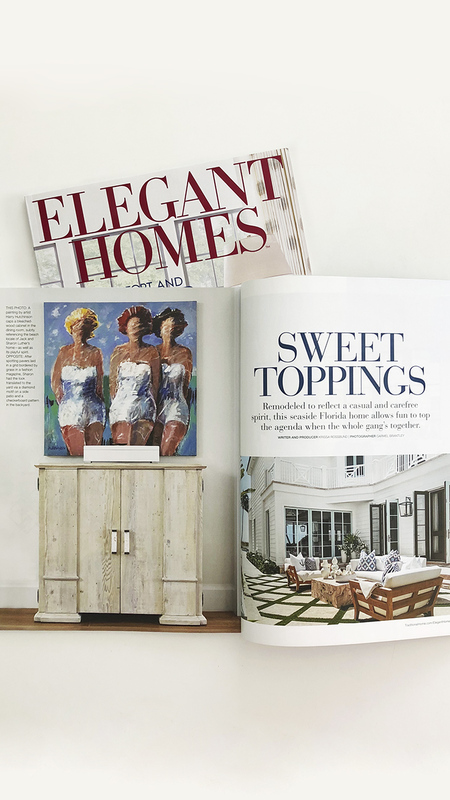 While I was waiting in the lobby, I picked up a copy of the Fall/Winter Issue of Elegant Homes Magazine and much to my surprise and joy was a project by Brantley Photography! 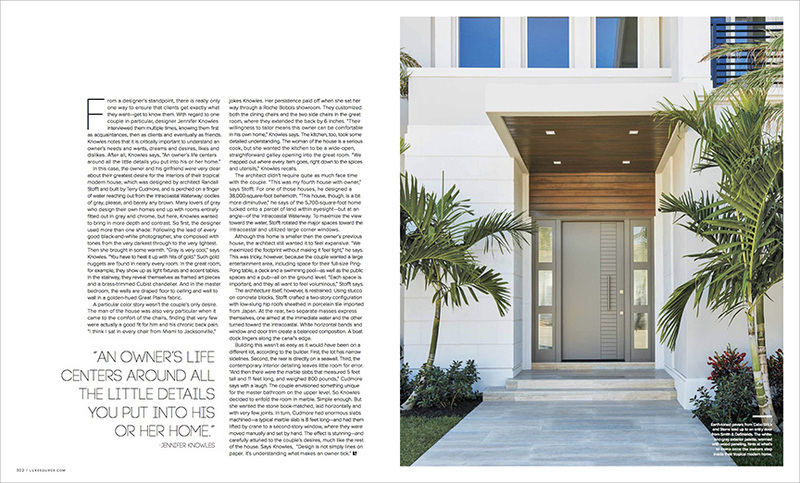 The 10-page spread featured a beautiful ocean front home in Juno Beach, Florida. 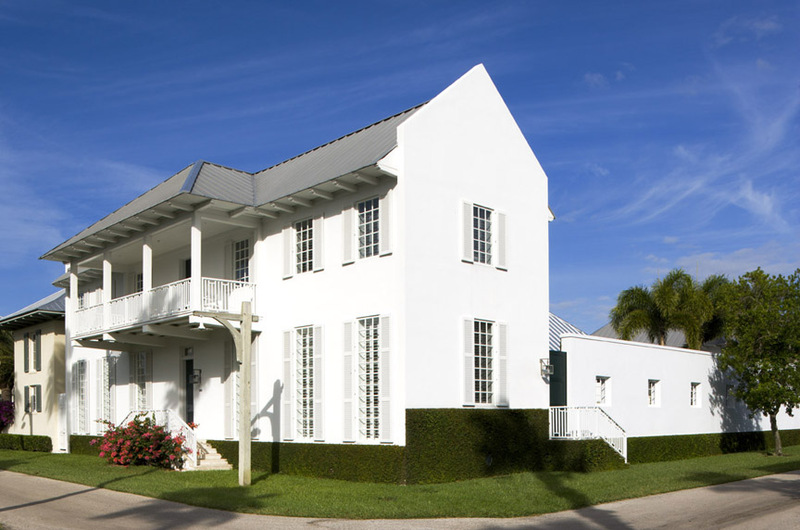 The house was designed by Pineapples, Palms, Etc in Jupiter, Florida. 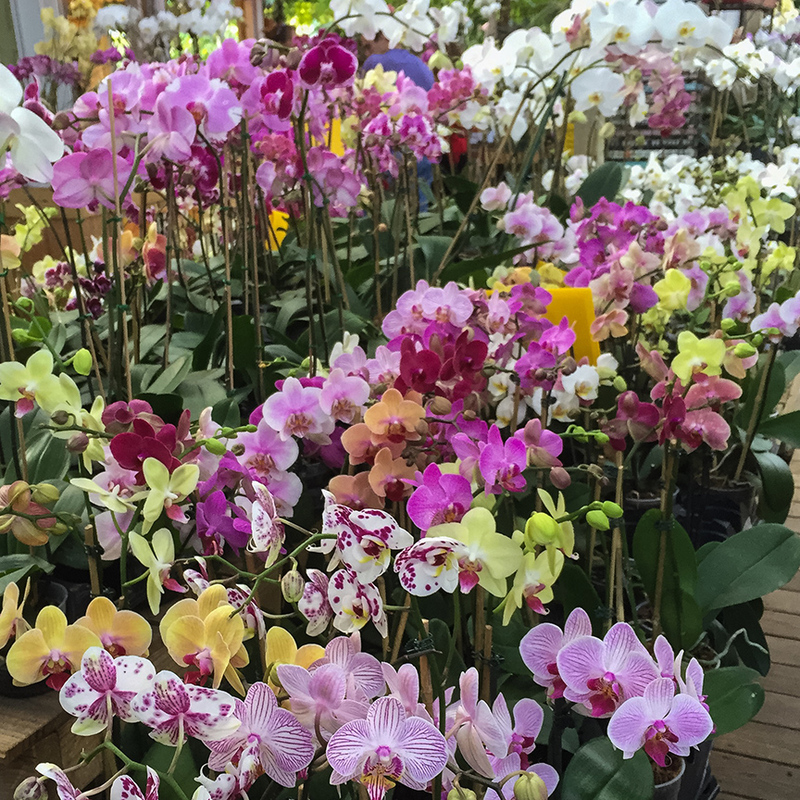 I love surprises – don’t you?!! 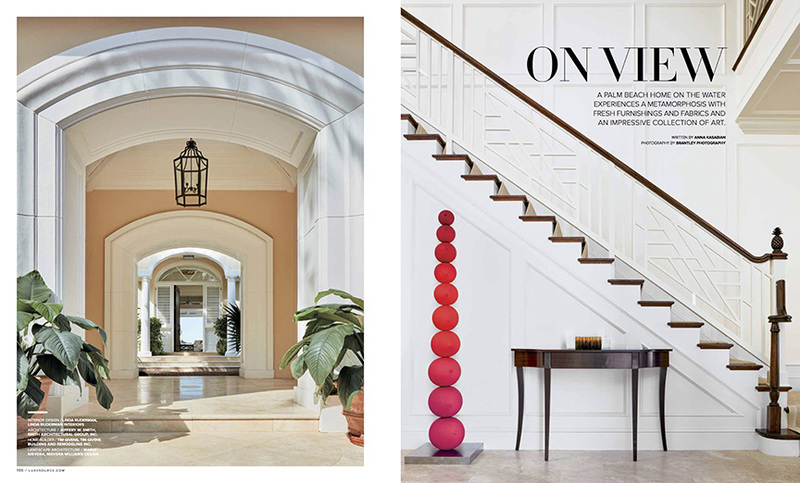 A beautiful Argentinian influenced home we had the pleasure of photographing is featured in the July/August 2018 issue of Luxe Magazine, Palm Beach Edition. 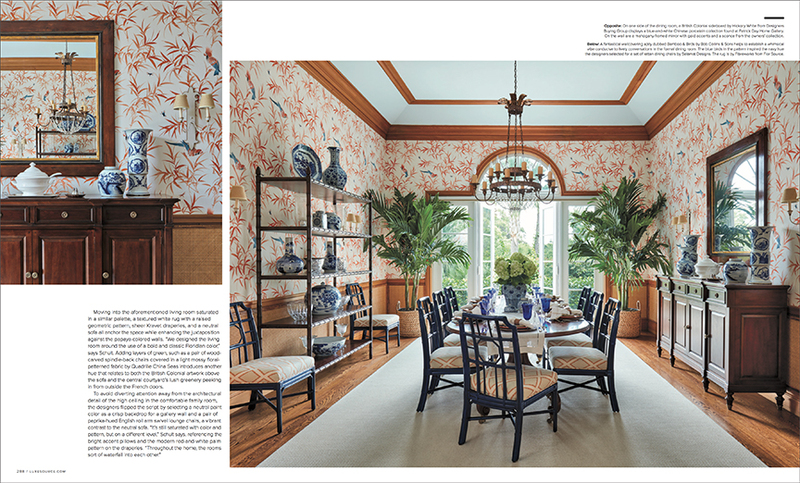 The 10-page spread showcases the courtyard home designed by Janis Evans, Janis Evans Interior Design, New York. 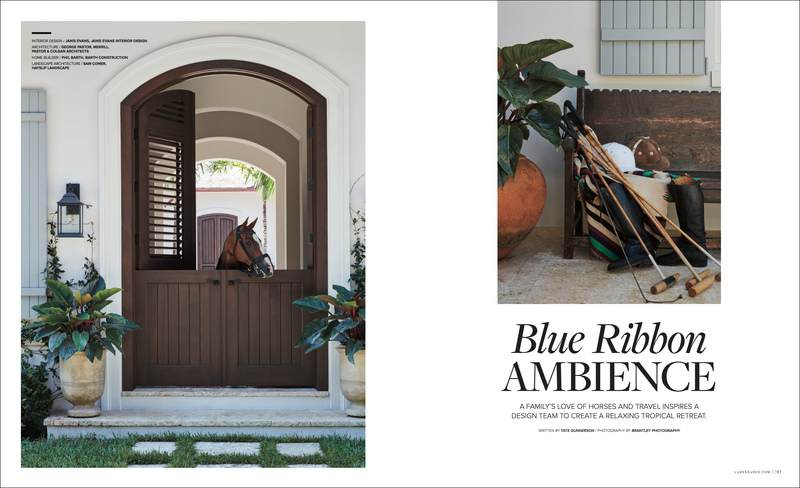 Travel inspired the homeowner, a polo player, with a love of horses to create a fabulous retreat on a scenic lot overlooking a barn and paddocks in a posh Vero Beach development. The Argentinian influence is carried throughout the house with exposed wood beams to highlight the lofted ceilings. For the photo shoot, the homeowner brought in one of polo ponies to model. Not everyday do we get a horse to model for us! 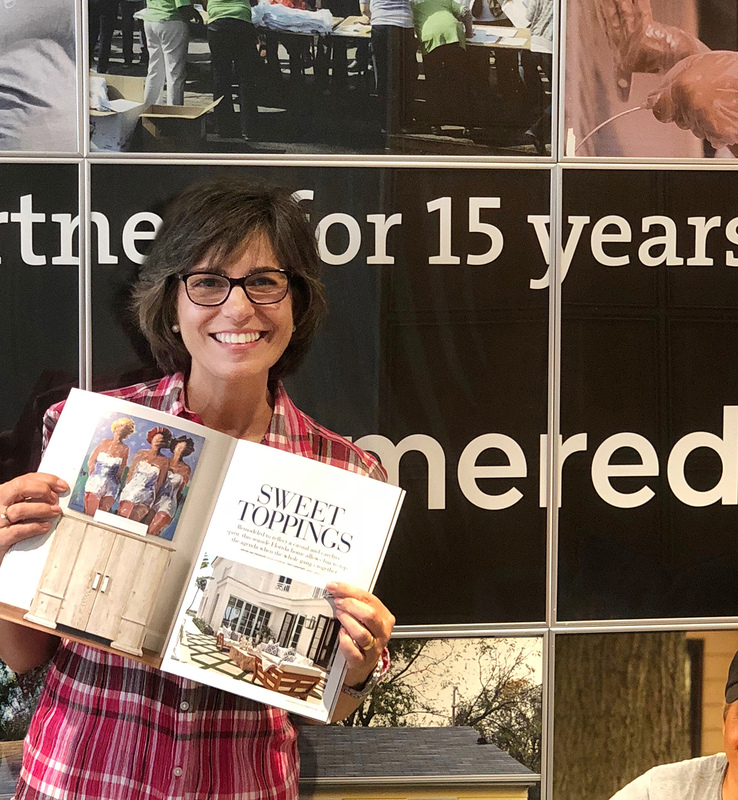 Thrilled to be on the cover of the July/August 2018 issue of Southern Home Magazine! 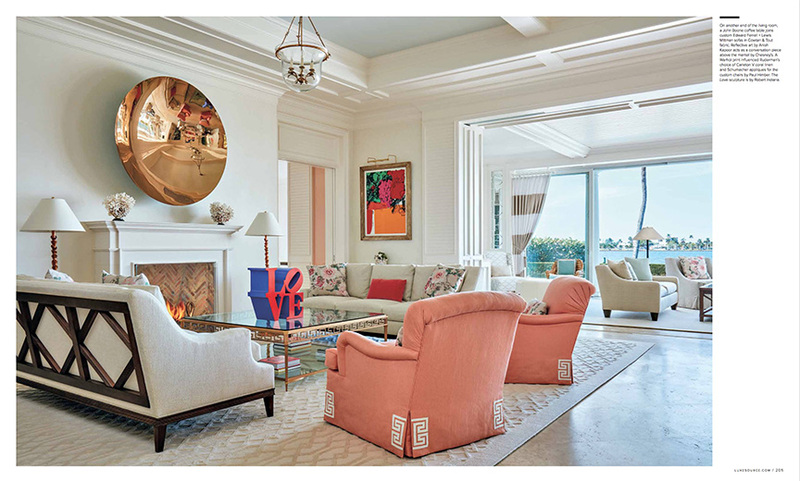 Fabulous project by the talented designer, Ellen Kavanaugh of Ellen Kavanaugh Interior Design, Palm Beach. 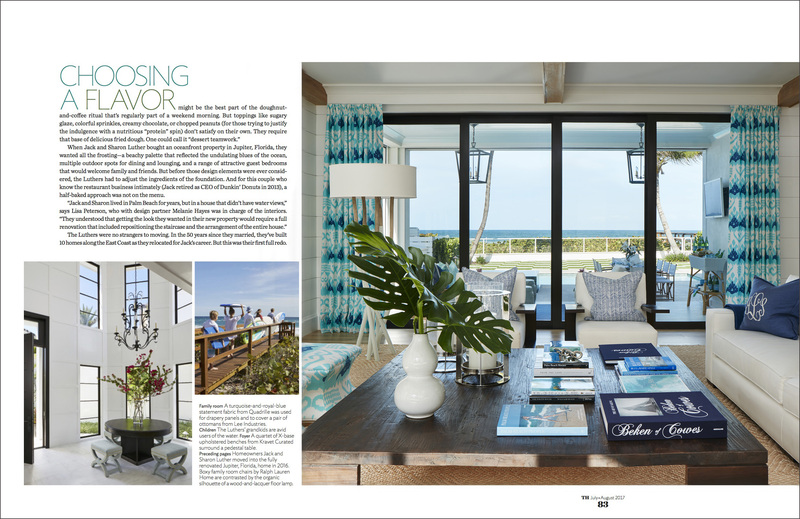 Ellen, along with architect Mark Marsh were hired to revamp an ocean front, one story patio home overlooking the Atlantic. 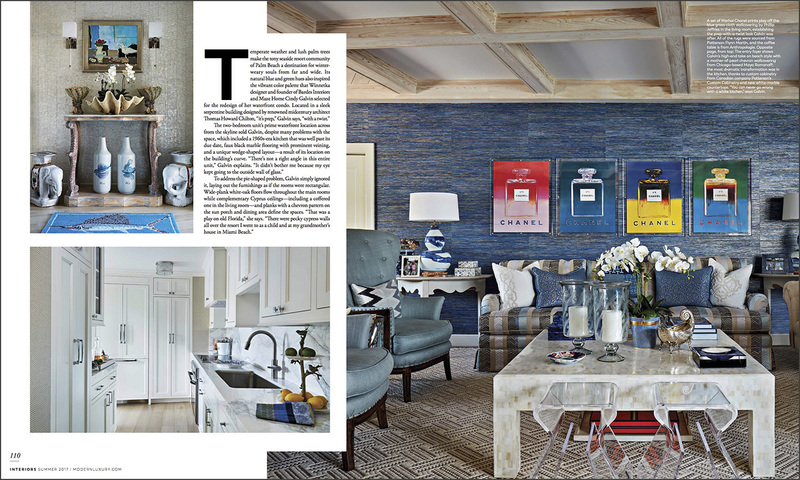 Shades of blue and periwinkle are found throughout the 2500-square-foot home. 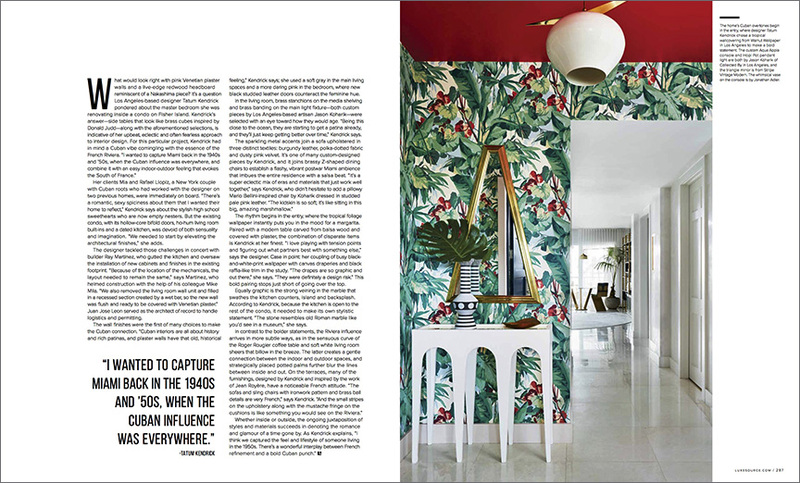 We spent two days photographing the house working along side Ellen and her mother, who did an amazing job with styling. 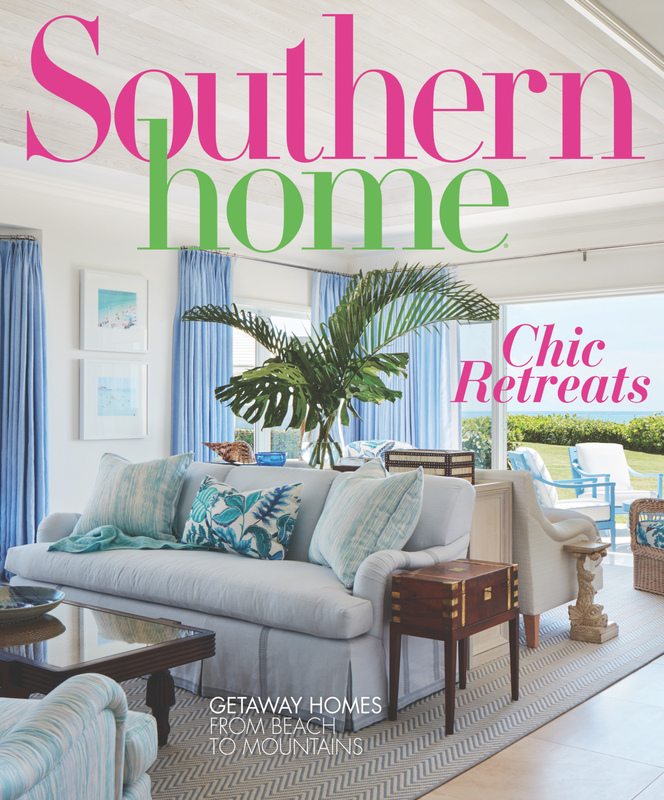 So fortunate to have the creative team at Southern Home turn this project into a wonderful 10 page cover article. Thank you to everyone involved at Southern Home. 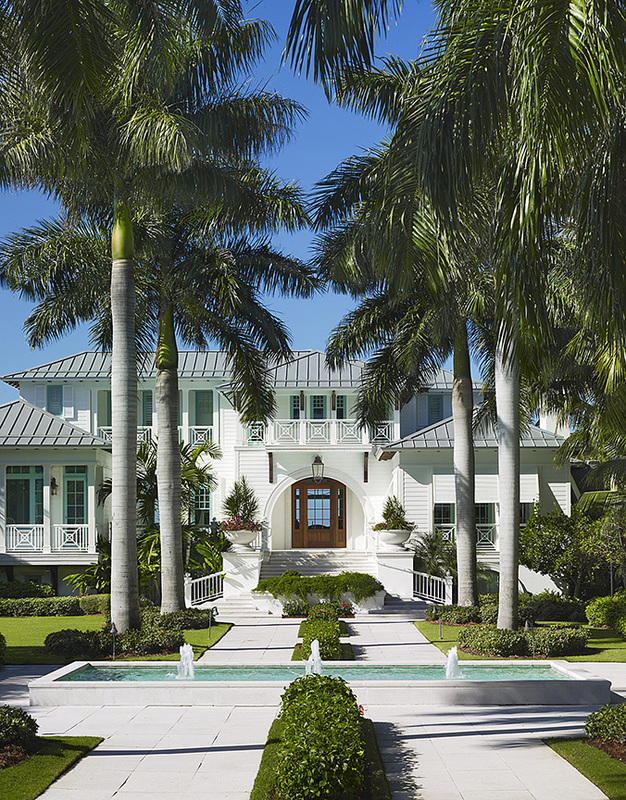 This seaside retreat truly is a jewel box! 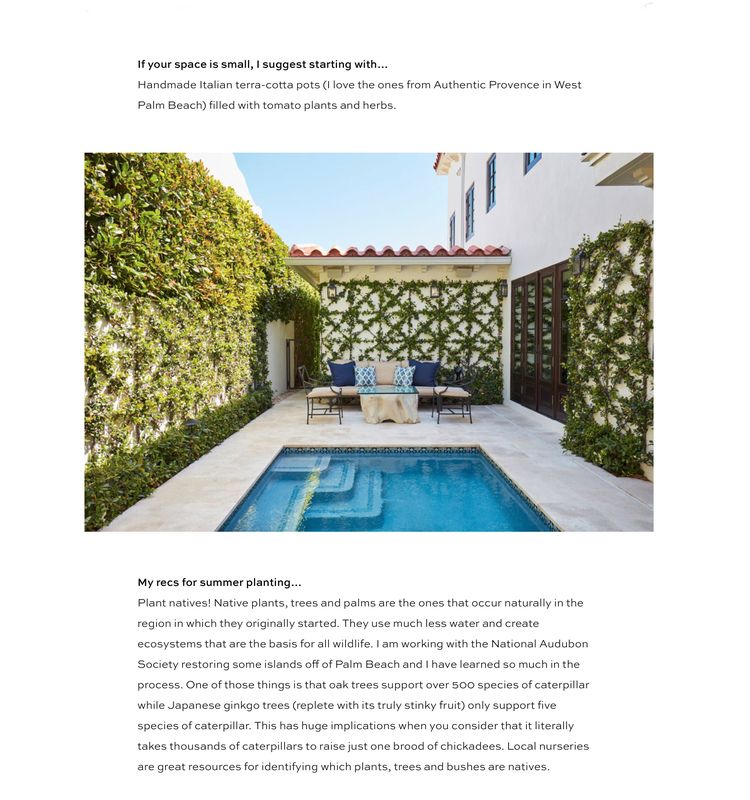 Enjoyed seeing the Tory Burch Blog featuring our photos of a Palm Beach Project by the landscape design firm of Fernando Wong Outdoor Living. 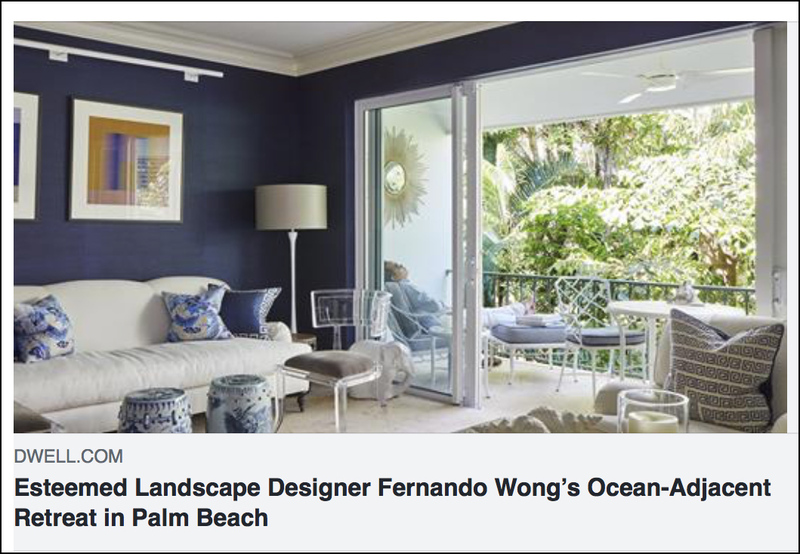 A fabulous in town garden surrounding a historic home was the mastermind of the very talented Fernando Wong. Spent the day photographing various landscape features around the property. 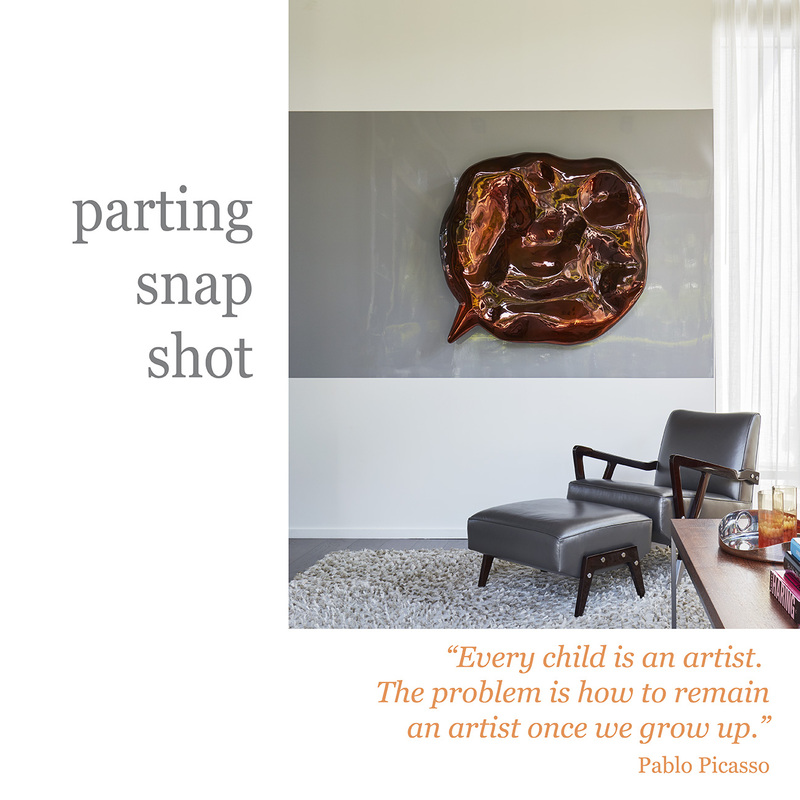 We loved photographing Fernando’s portrait at his condo in Palm Beach. 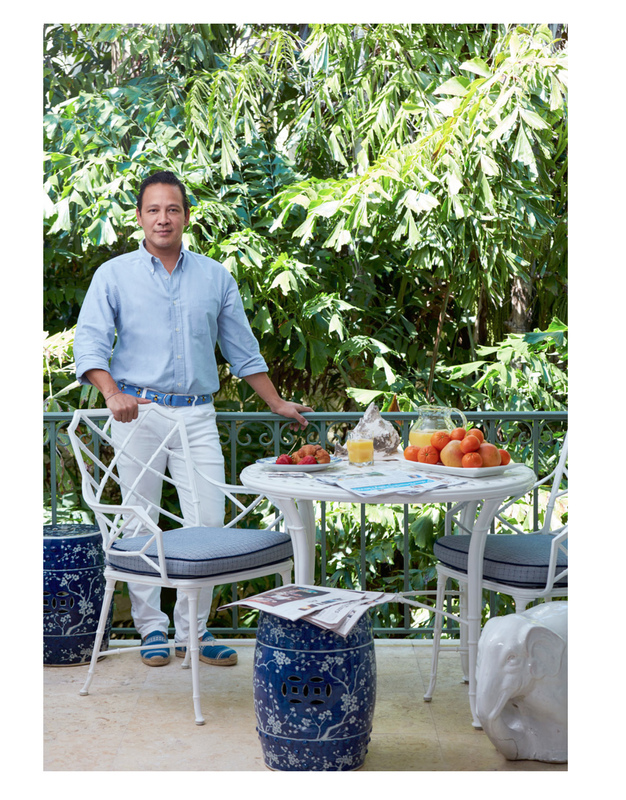 He has a wonderful outdoor terrace that provided the perfect setting for his portrait. Always a pleasure to work the Fernando and his partner, Tim Johnson! 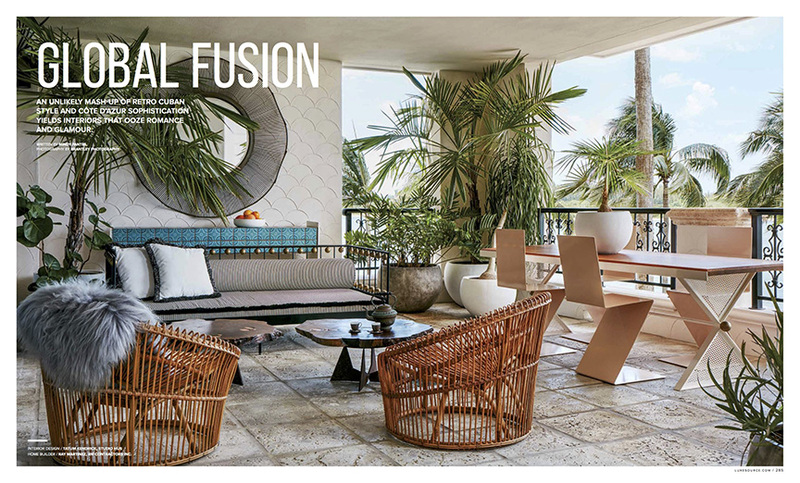 The article also includes an image from our photo shoot at the Four Seasons Miami, another exciting project by the Fernando Wong Team. Thank you to Tory Daily for the feature! 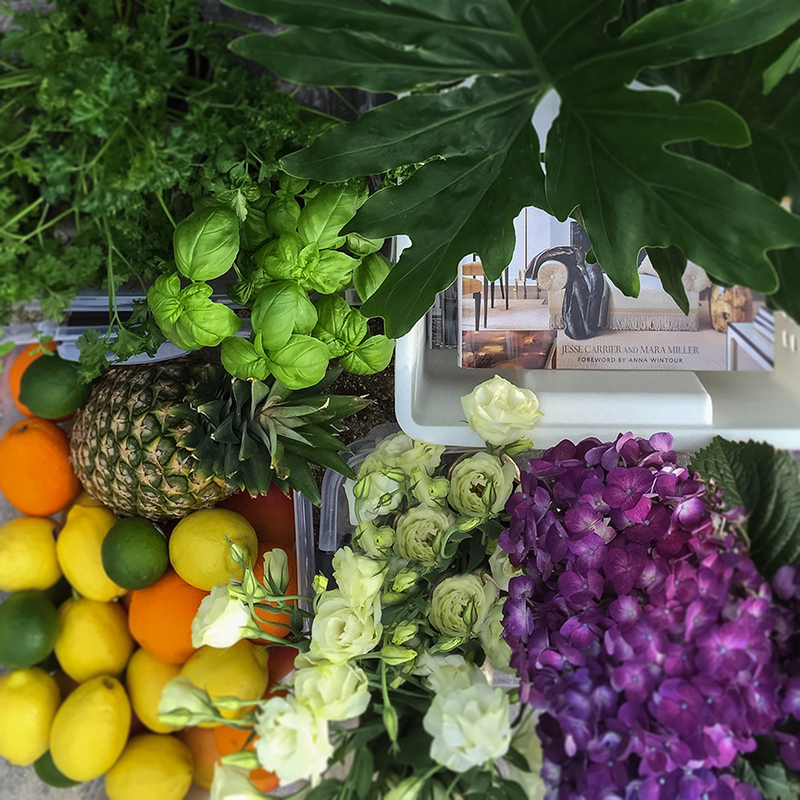 The CasaCor Miami Design experience proved to be exciting, colorful and inspirational! 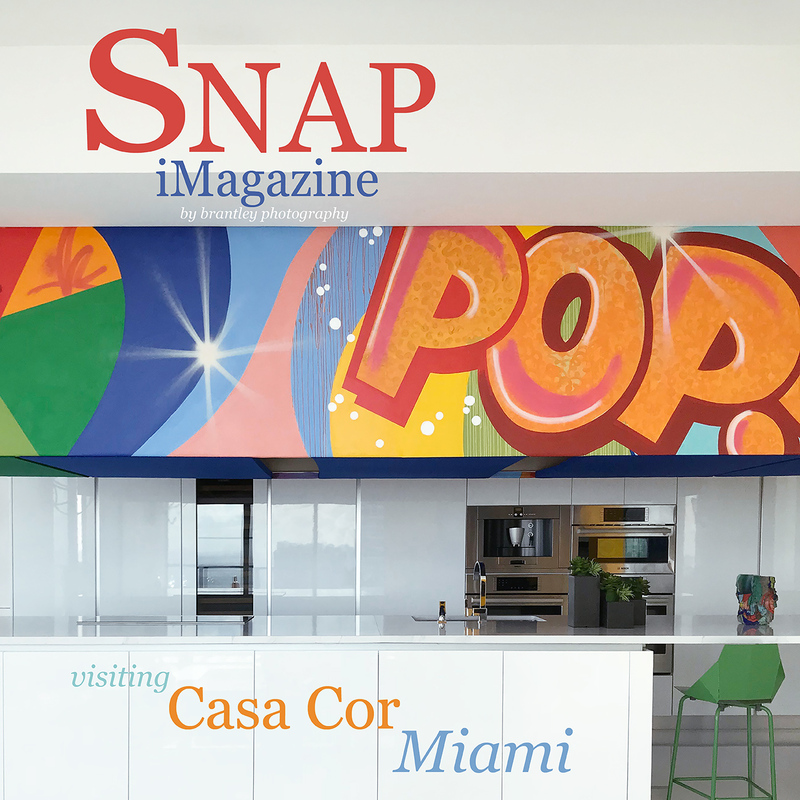 Check out this issue of SNAP iMagazine to experience the new CasaCor Miami Urban Living. 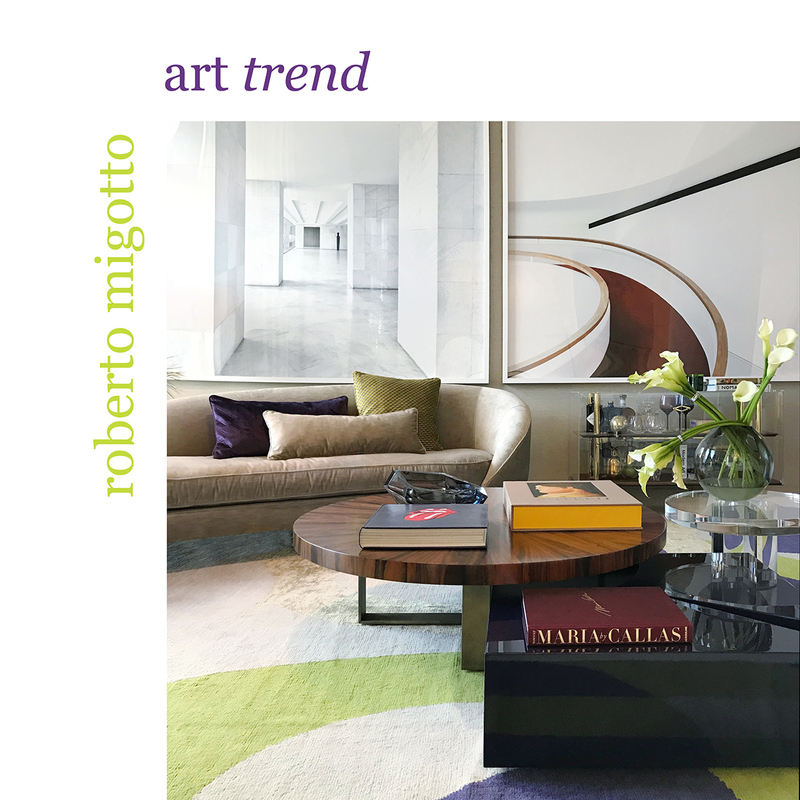 A showcase of carefully curated residential interiors, design, architecture, landscape, art, technology and global culture. The event took place in RISE at Brickell City Center in downtown Miami. 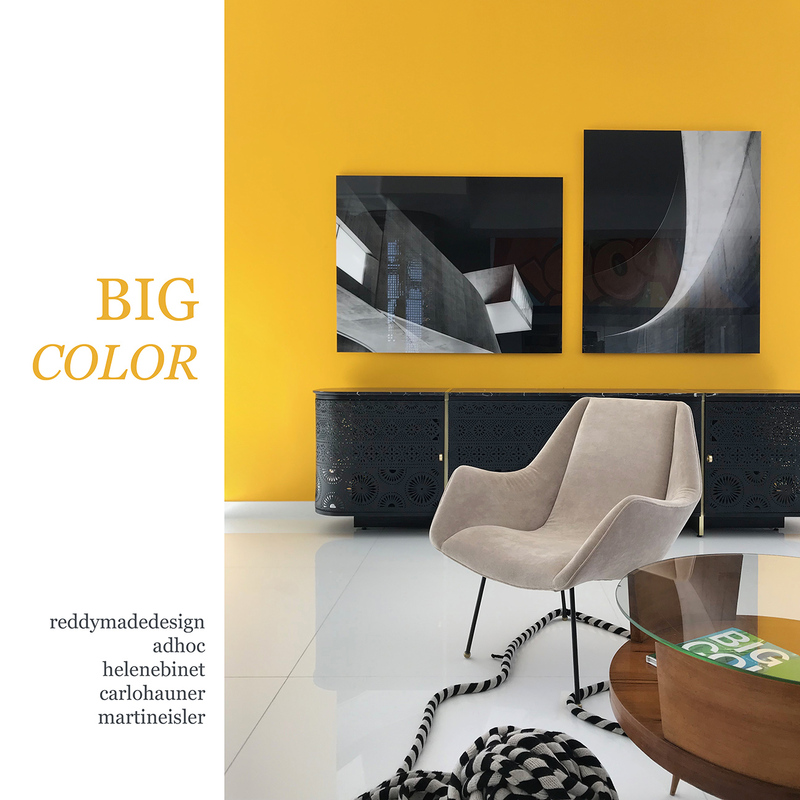 Signature styles from more than 20 world-renowned and emerging design professionals were on display, along with the latest in interior furnishings, color trends, lighting, and accessories. 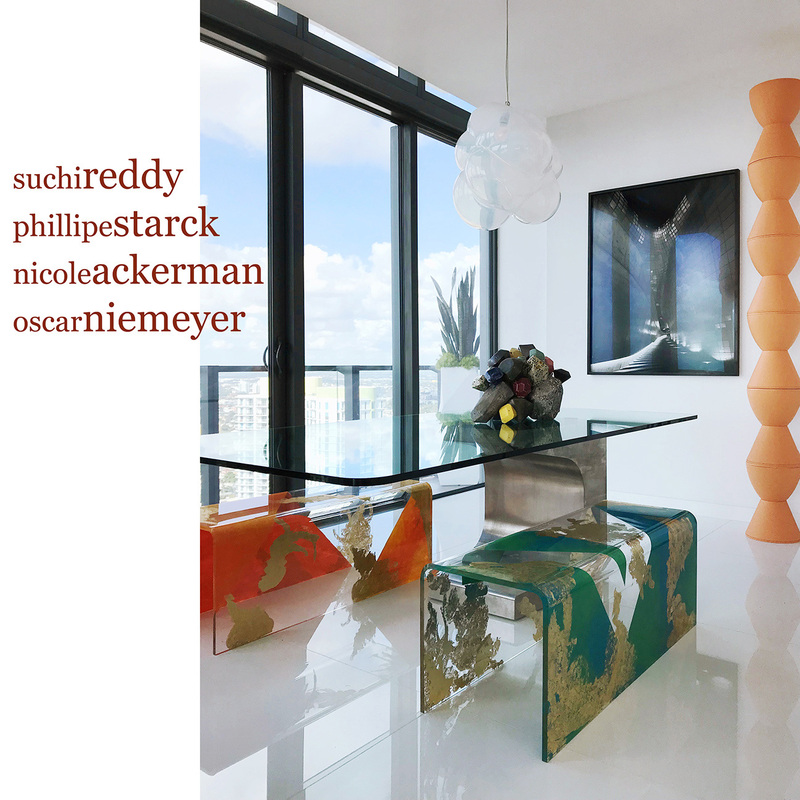 CasaCor celebrates its 30th anniversary with 26 exhibitions in six Latin American countries and its inaugural North American exhibition in Miami. Enjoy! 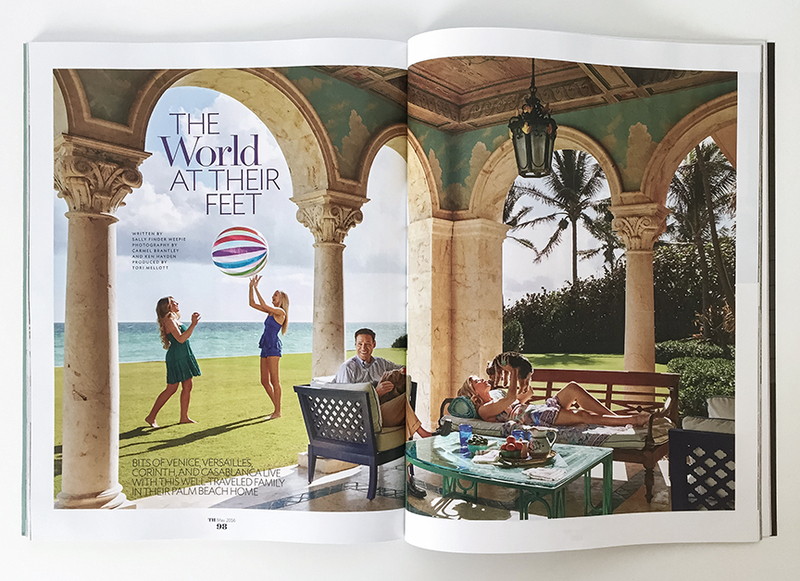 We are so excited to kick off 2018 with this Palm Beach Photography Magazine Cover of Luxe Magazine! 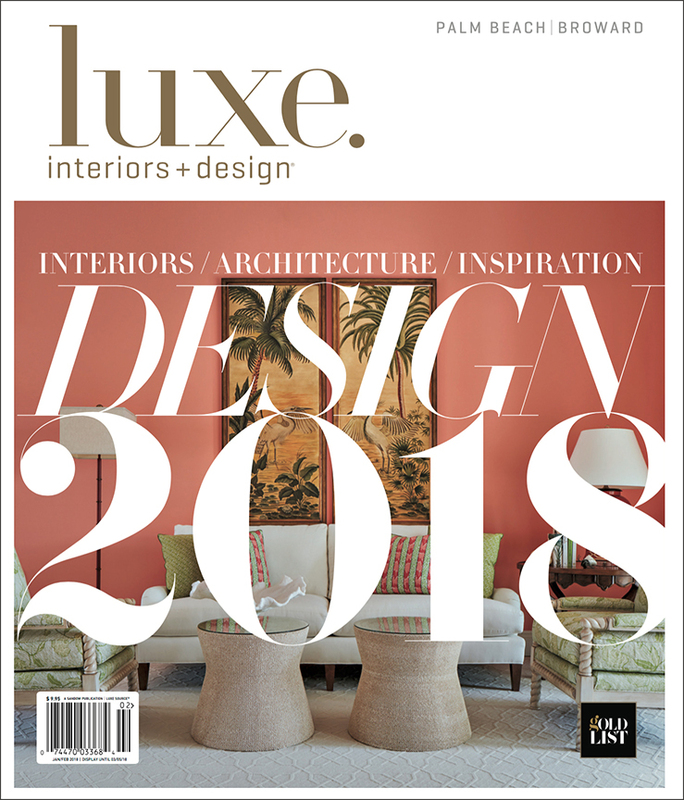 This is our second year in a row in which our interior design photography has made the cover of the annual Luxe Gold List issue. It is also the second year in a row that the project was designed by our client and good friend Jackie Armour of JMA Interior Design. 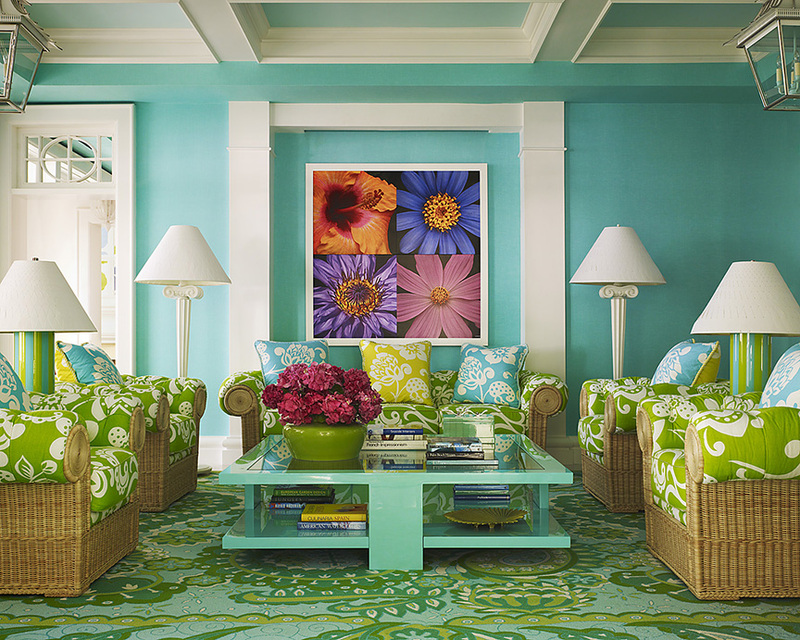 Jackie, working with designer Marcus Schult, created a colorful vacation retreat for their out-of-state clients. 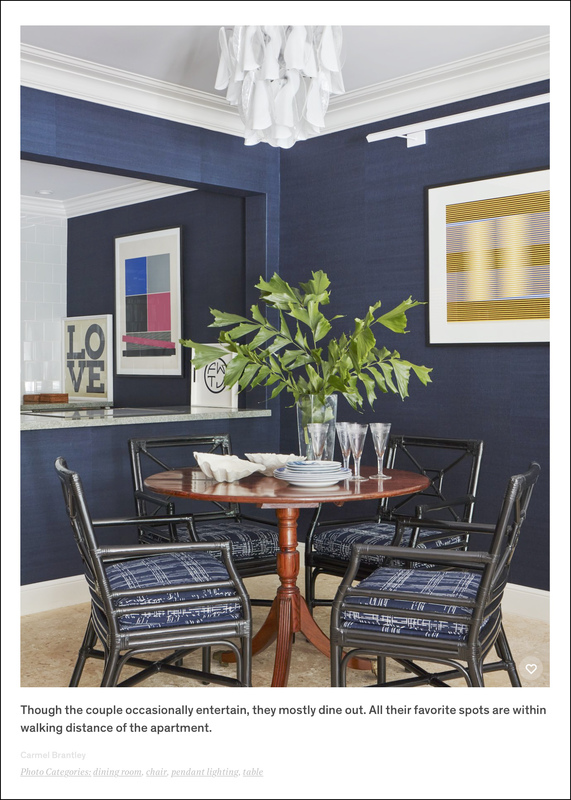 With a vibrant color scheme and boisterous patterns, the design duo created a warm and inviting home. The dining room is a personal favorite of mine as I fell in love with the gorgeous wall covering – Bamboo and Birds by Bob Collins & Sons. 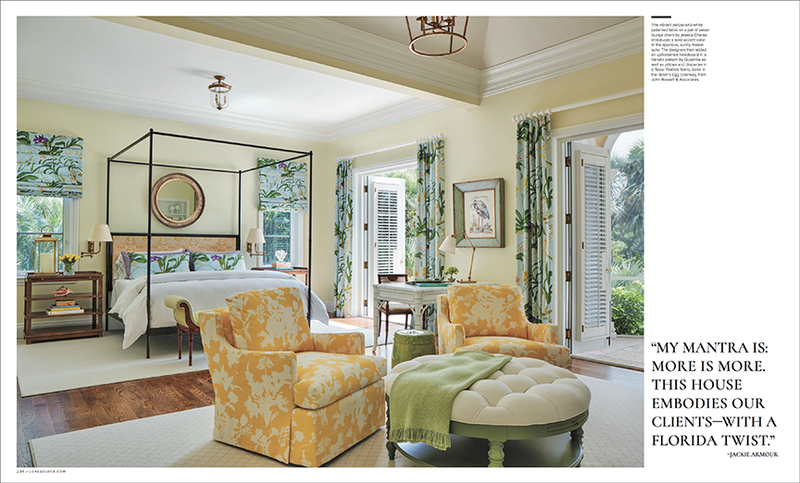 The master suite, also a favorite, is light and bright with a sunny yellow palate. 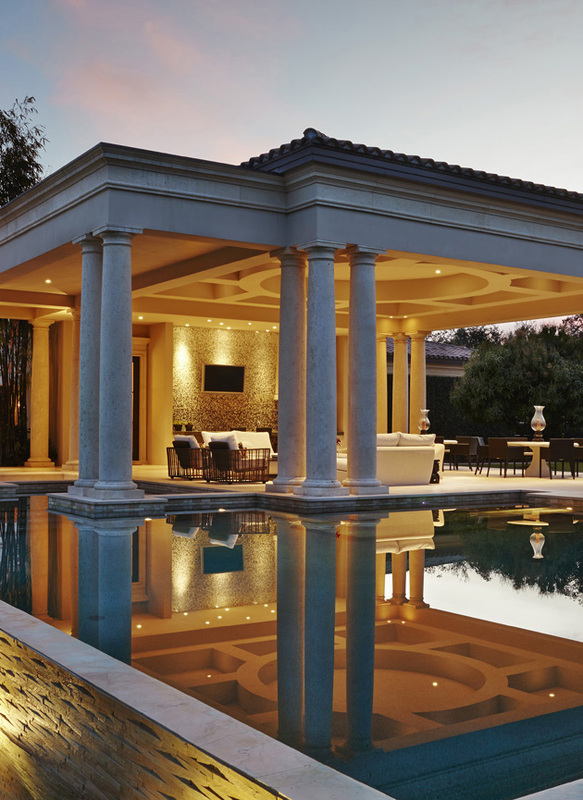 The outdoor patio and pool area is perfect for entertaining or just relaxing. Here’s to a colorful 2018! 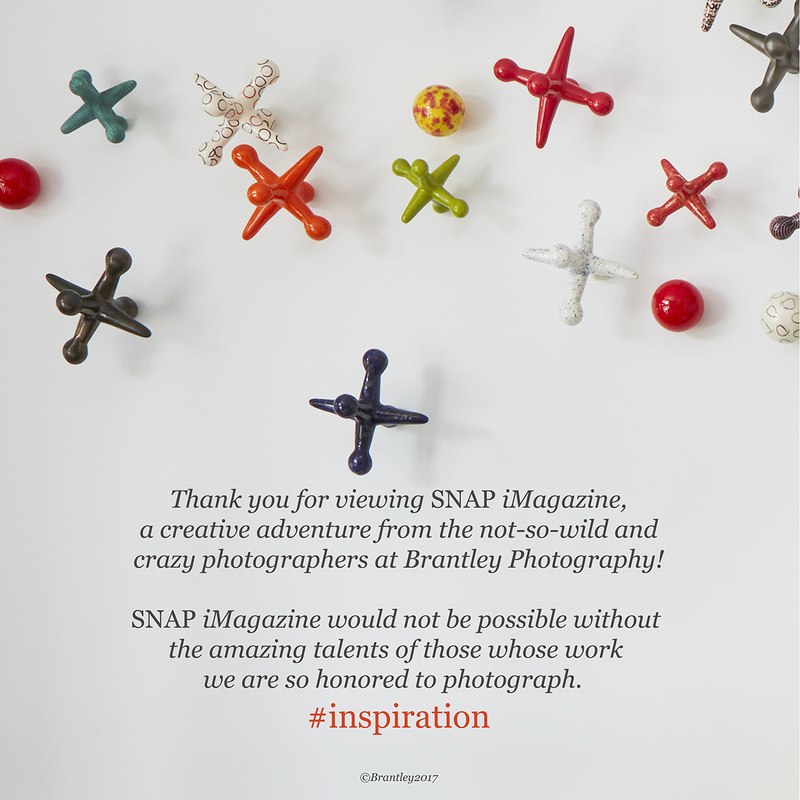 SNAP iMagazine, an Instagram Design Magazine by Brantley Photography, is up and running! 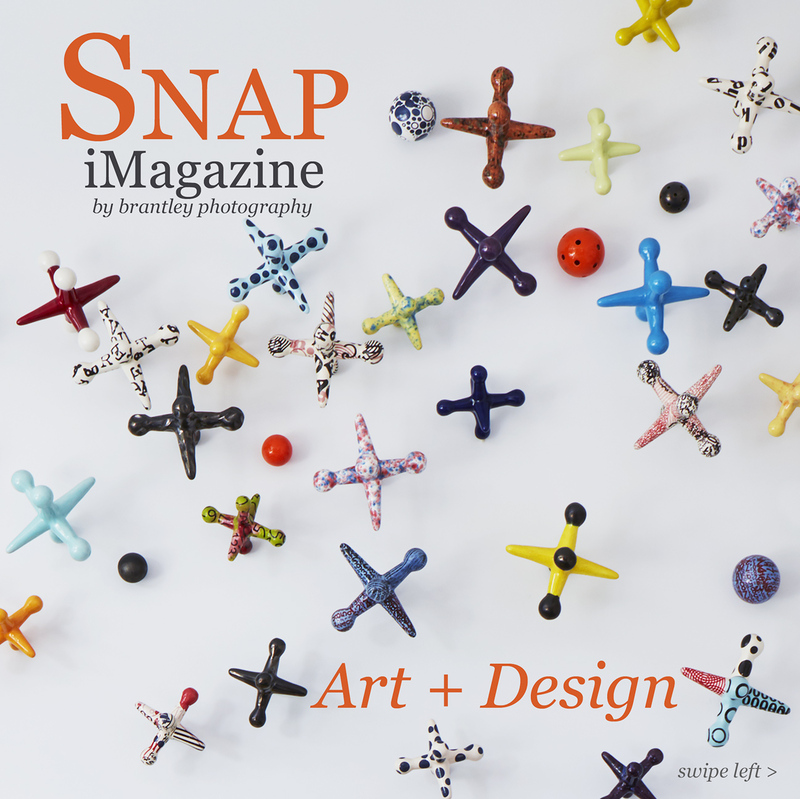 SNAP is devoted to the worlds of photography, art, architecture and interior design. We love the inspiration we get from Instagram – so many beautiful and amazing photos! 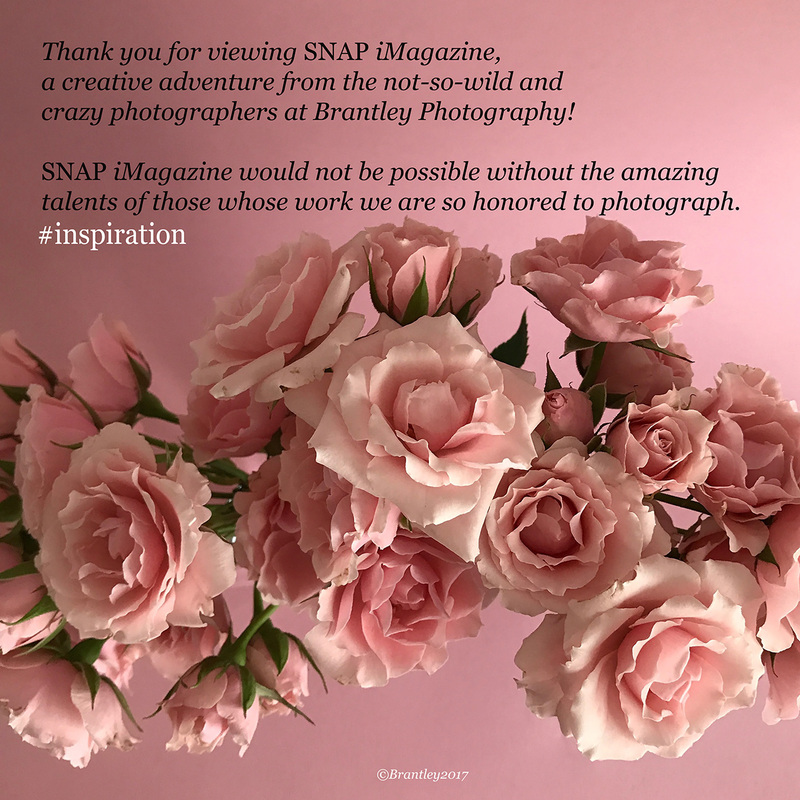 In addition to our Brantley Photography Instagram page, we wanted to add SNAP iMagazine as a way to share even more of our images and push the boundaries a bit. 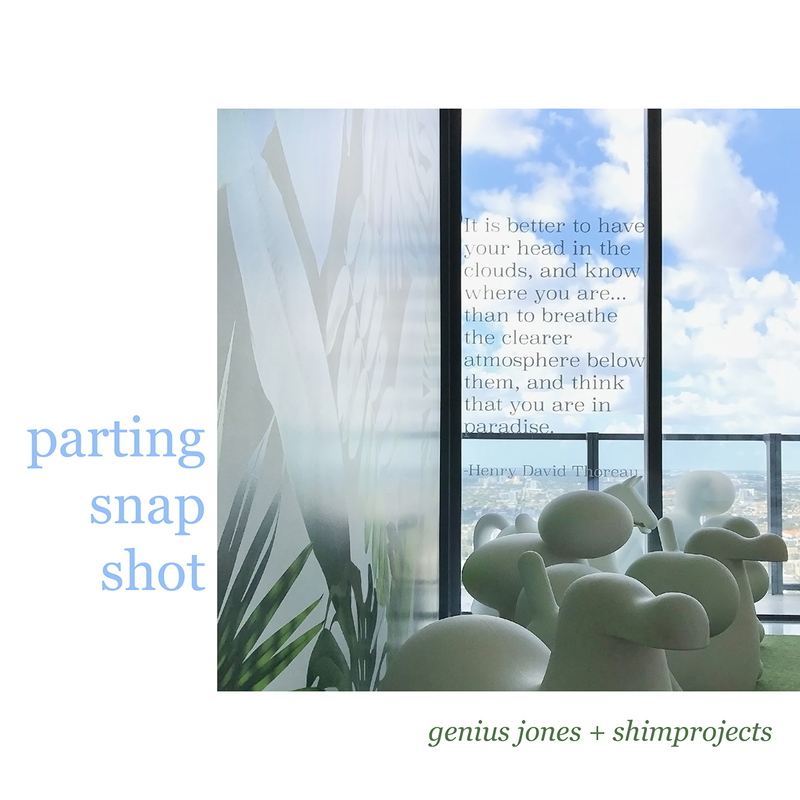 SNAP gives us the opportunity to showcase our personal photography projects, as well as those we photograph for our many talented architectural and interior design clients. 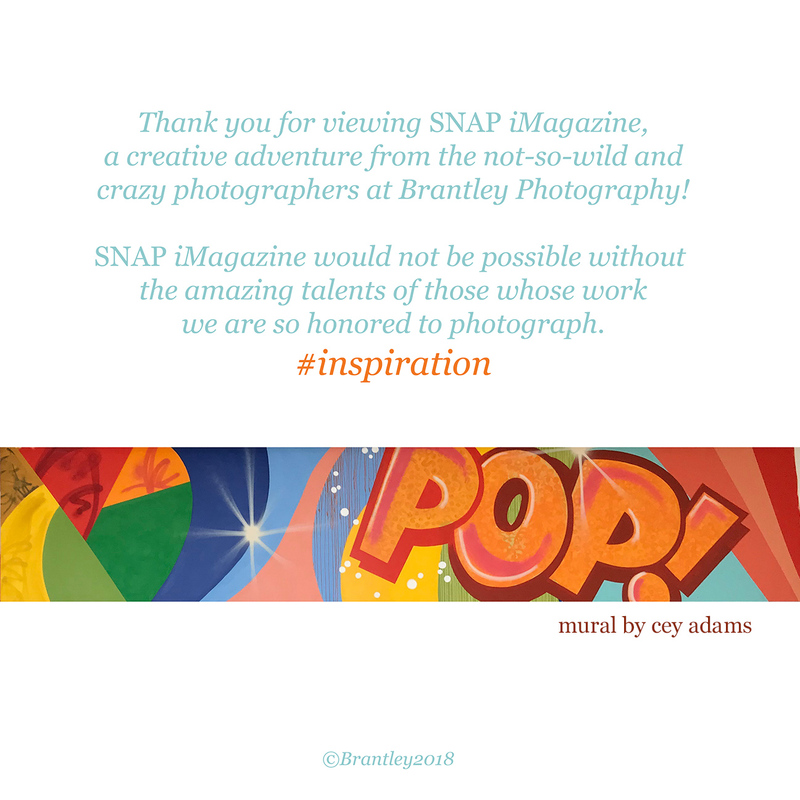 So we hope you will follow along on Instagram as we share our new creative adventure, SNAP iMagazine! 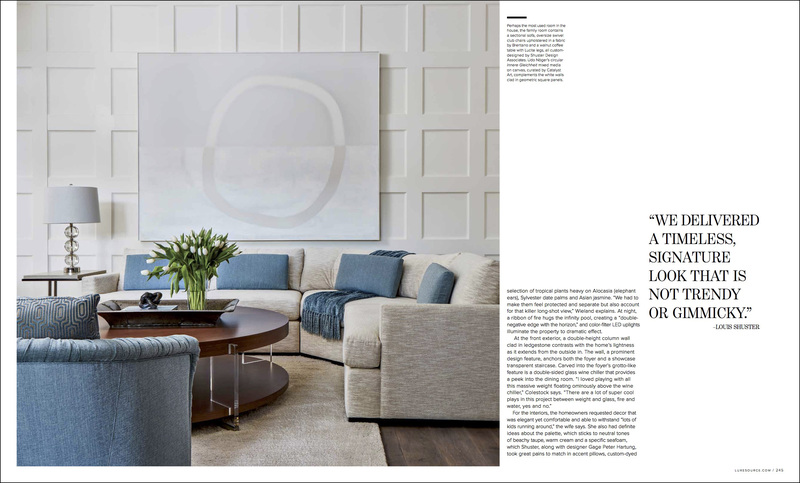 Excited to have our interior design photography featured in the current issue of Modern Luxury Interiors Chicago Magazine! 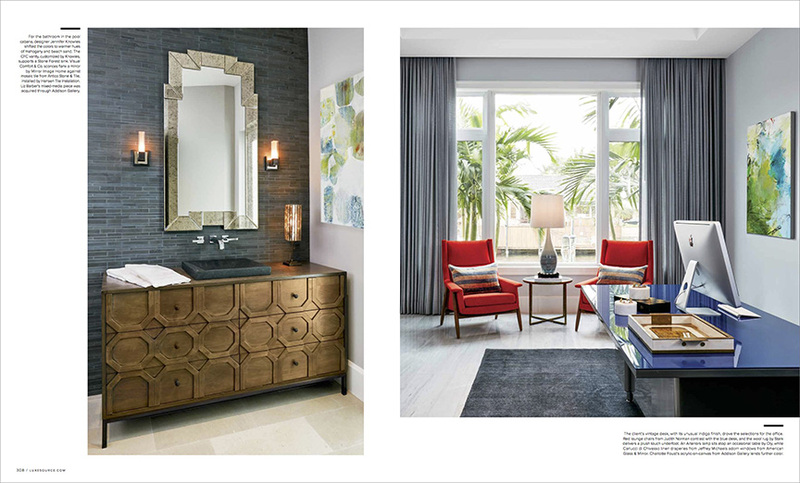 A wonderful Palm Beach apartment is the star of the show. 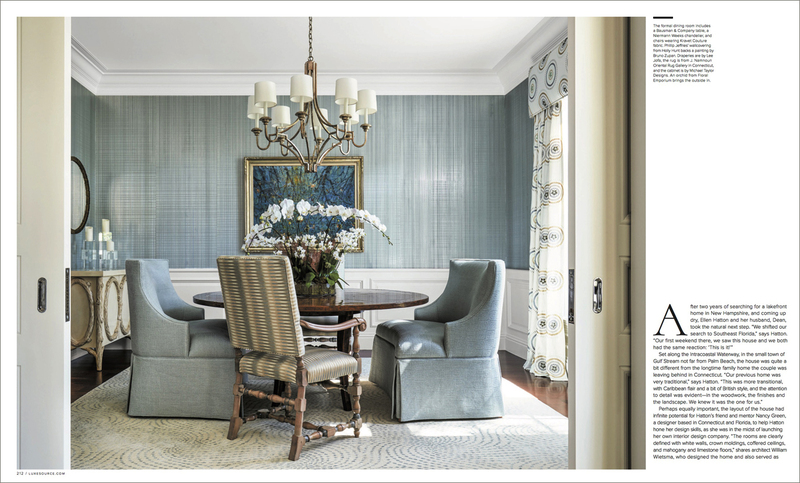 Designed by Chicago interior designer, Cindy Galvin of Bardes Interiors, the apartment features beautiful blue grasscloth wall coverings by Phillips Jeffries in the living room and dining room. 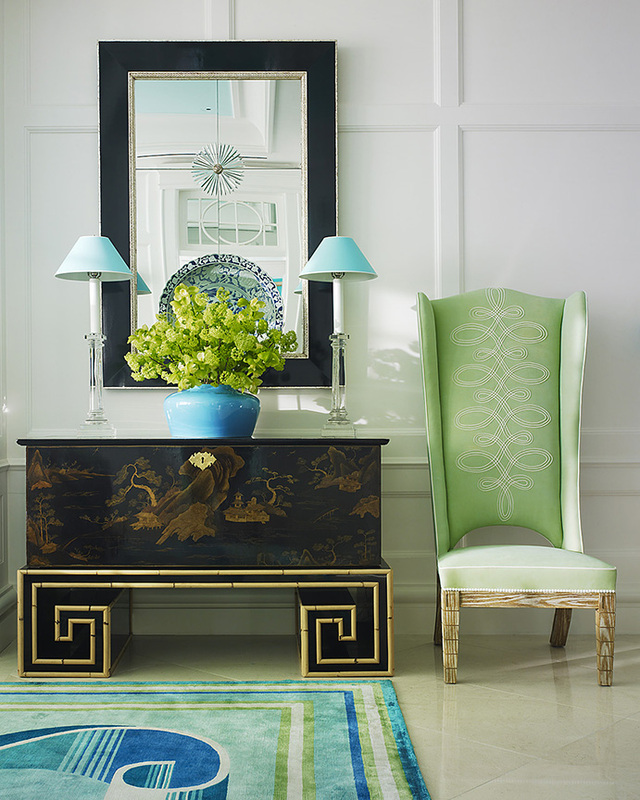 The bedroom features exquisite linens by dPorthault and an ivory and periwinkle bone-inlaid side table. 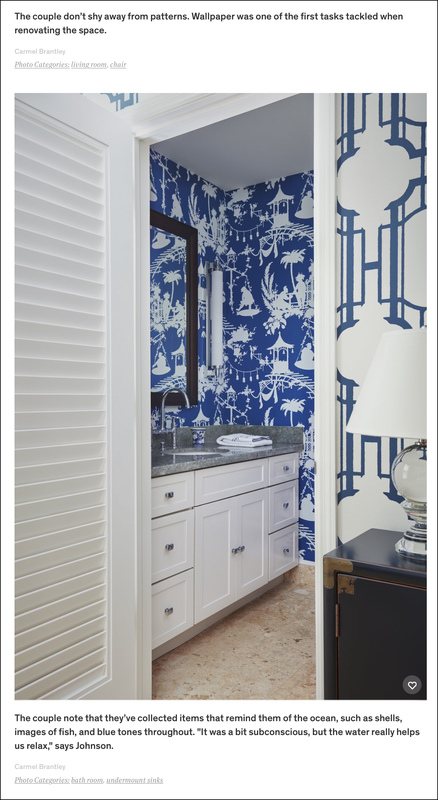 Cindy, along with builder Fasca, Inc., renovated the apartment to give broad views of the intracoastal waterway. 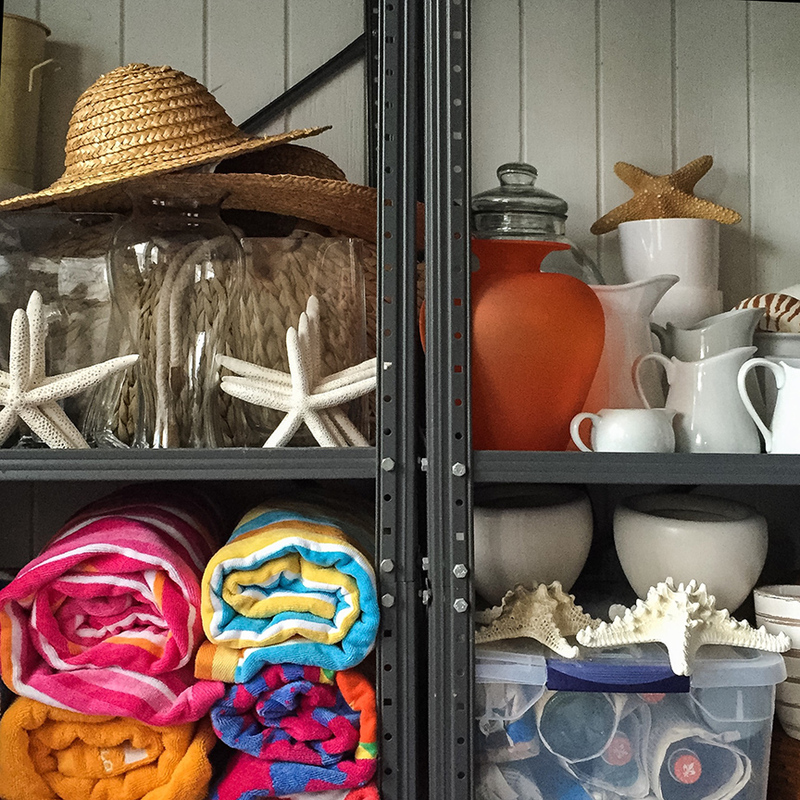 The apartment is a warm-weather getaway for Cindy and her family. 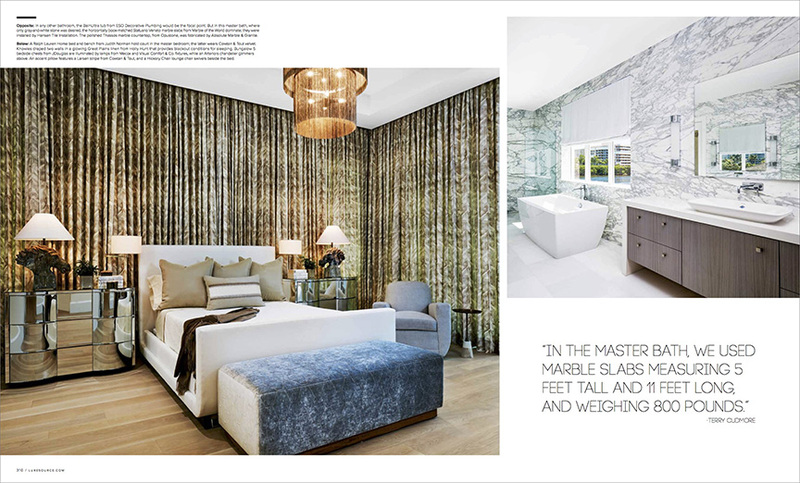 We have had several projects in Modern Luxury Interiors Miami Magazine but this was our first project featured in the Chicago version of Modern Luxury Interiors. 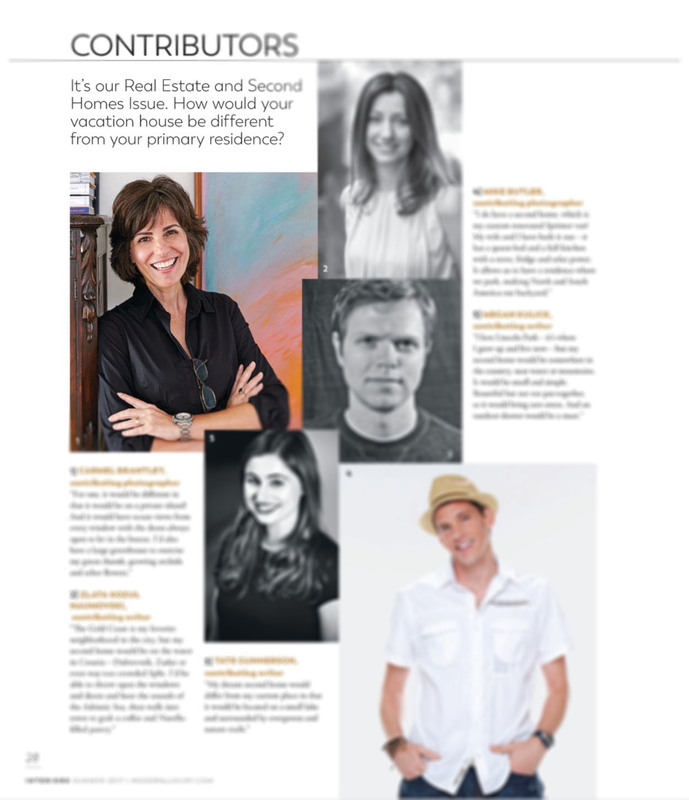 Thank you Modern Luxury for making us a contributor! 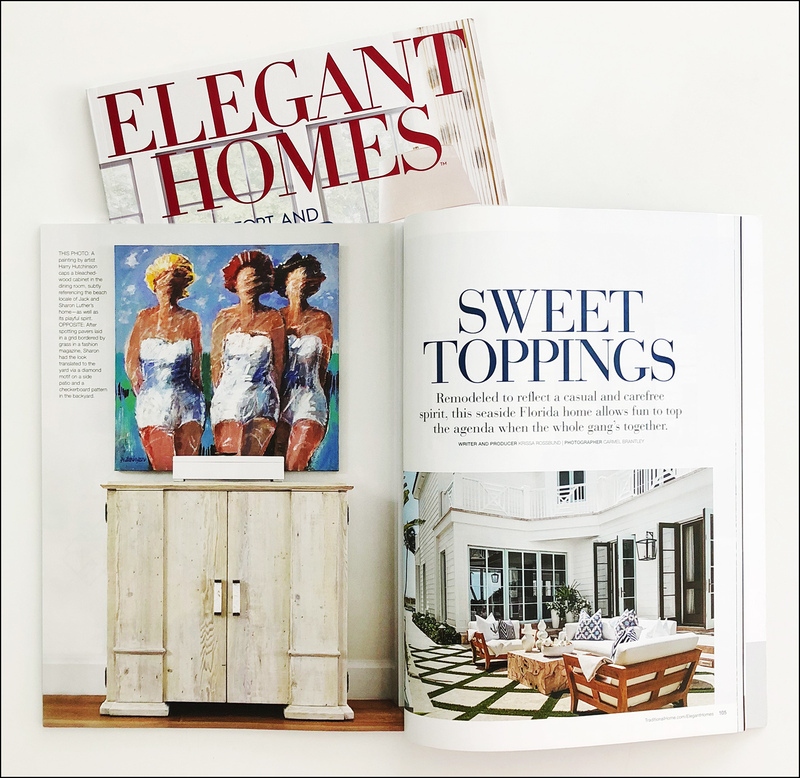 We are so excited with our new Traditional Home Magazine feature! Many thanks to the staff at Traditional Home for making this possible. 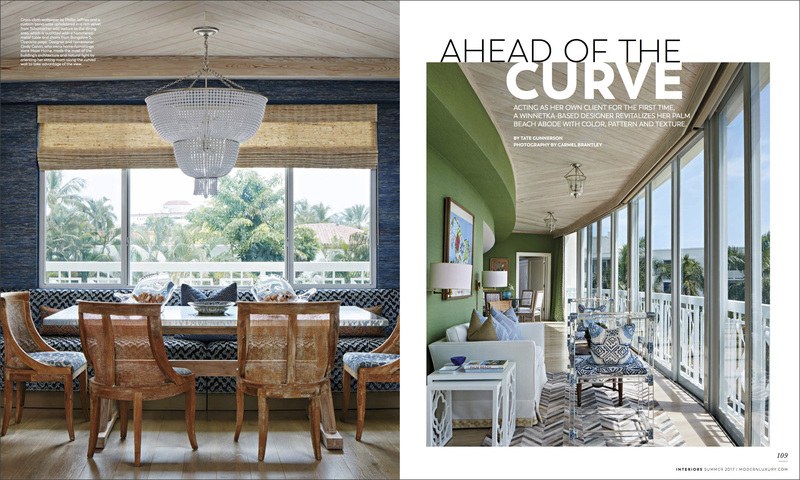 The July/August issue of the interior design magazine features a 10-page spread on a fabulous house located in Juno Beach, Florida. 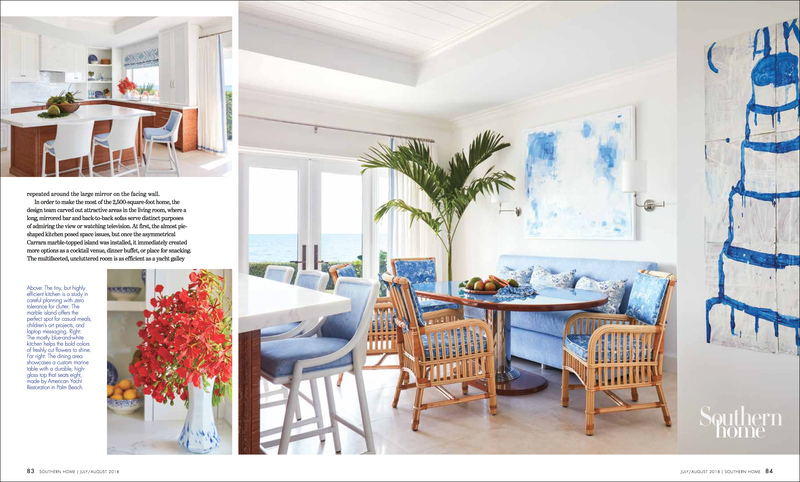 The house was designed by the talented team of Lisa Peterson and Melanie Hayes of Pineapples and Palms Interior Design in Jupiter, Florida. 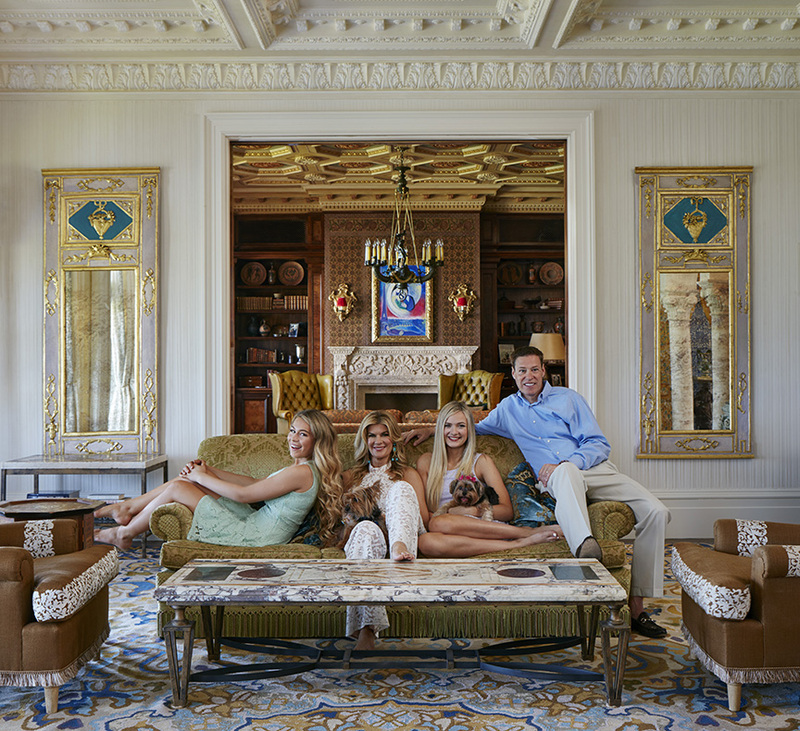 The owners, Jack and Sharon Luther, call the home “Ocean’s Eleven” as there are 11 family members. 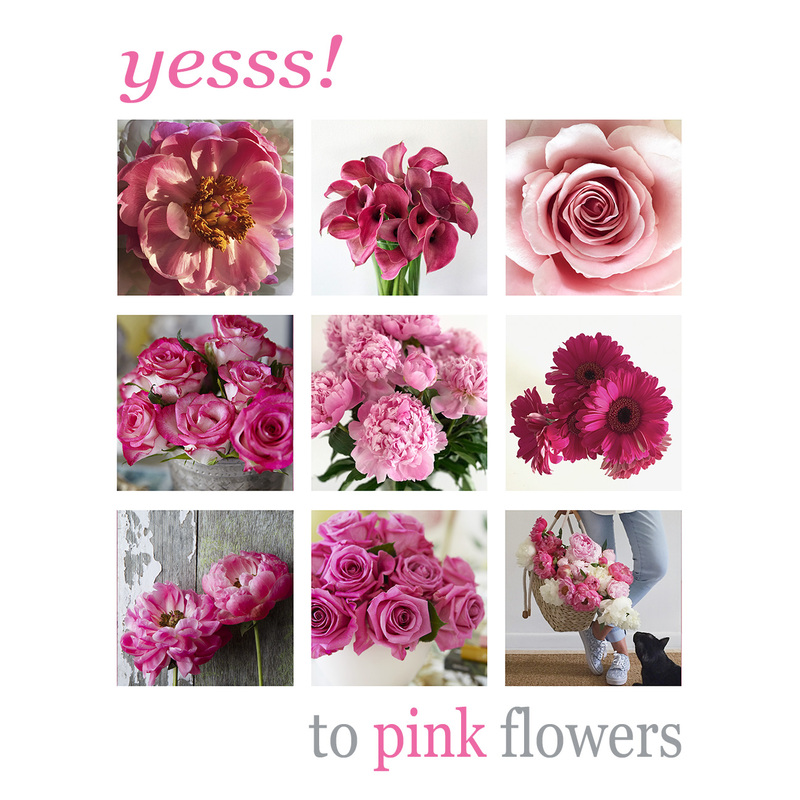 So excited to have our first Flower Magazine Cover Photography Feature! We were thrilled when the Art Director called to hire us for this fabulous house and garden feature. The house, located on Hypoluxo Island, is owned by Renny Reynolds and Jack Staub. 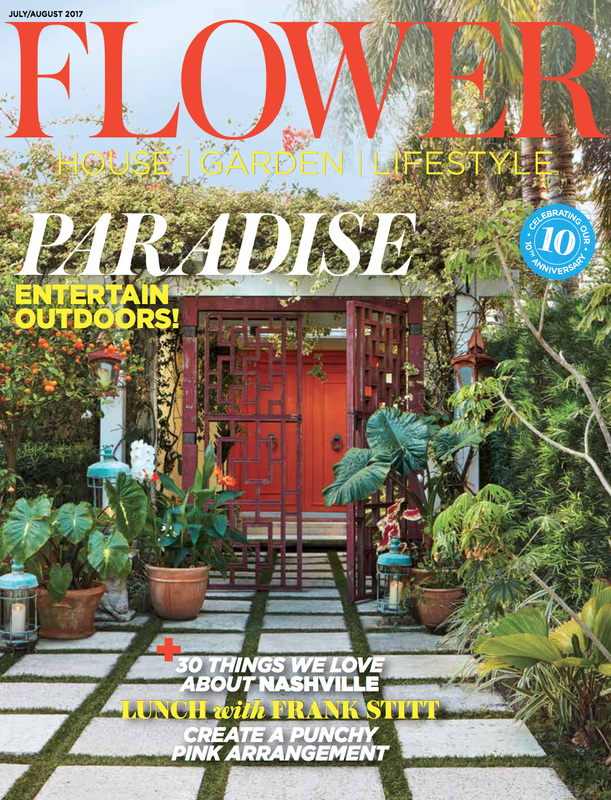 I have always enjoyed reading Flower Magazine so this was especially exciting for me to be able to work along side their editor, Margot Shaw. It was a long day of shooting, from early morning light until sunset. The gardens featured several tropical, lush plantings. I fell in love with beautiful orange front door! In addition to the house interiors and exteriors, we had the pleasure of photographing the owners dog, Bandit, who proved to be a willing model! 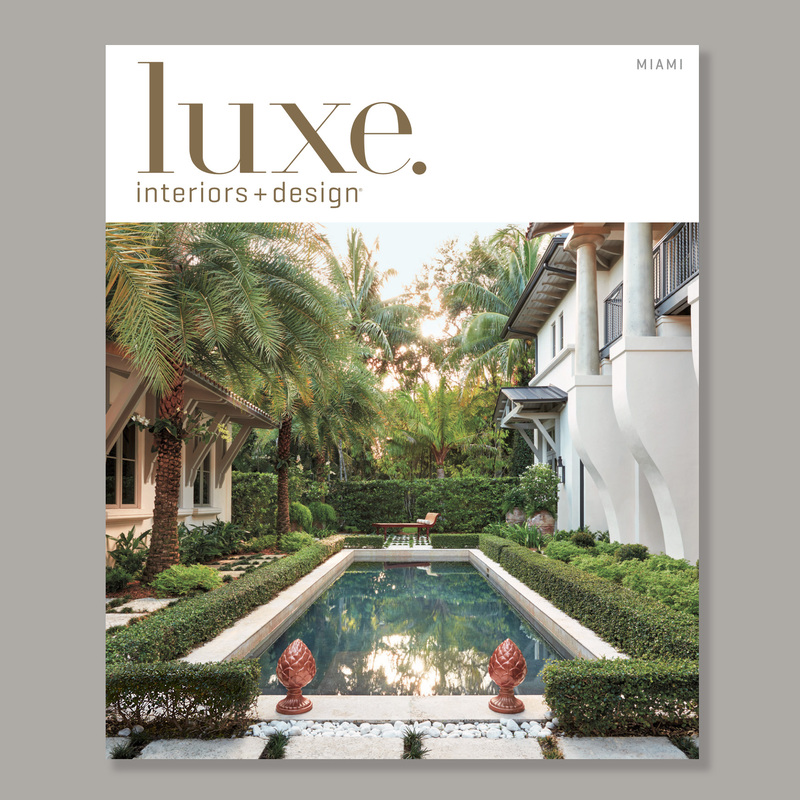 The Luxe Magazine Miami Cover for May/June 2017 features an interior design project by Cullman Kravis Interior Design, New York. 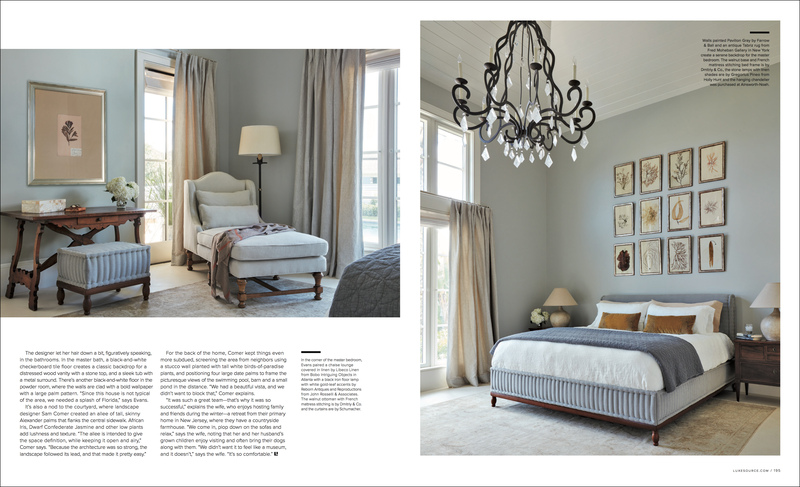 We were thrilled when Luxe gave us this editorial photography assignment. And to have the Luxe Miami Cover is a true bonus! 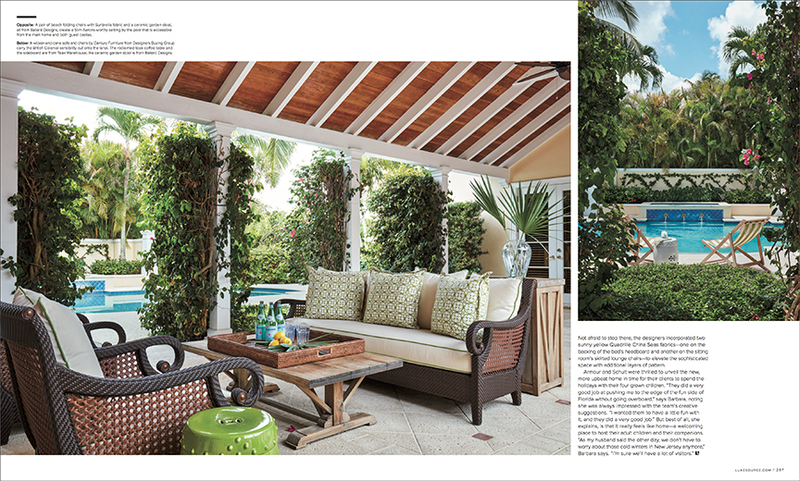 The house, located on Key Biscayne, was a pleasure to photograph! It has dynamic, cutting edge design, combined with a fresh, fun-loving family vibe. It was the first photo shoot in which we worked on set with Luxe Editor in Chief, Pamela Jaccarino along with Senior Art Director, Martin Elfers. The two day design shoot kept us moving from room to room trying to take advantage of the incredible natural light flooding the spaces. 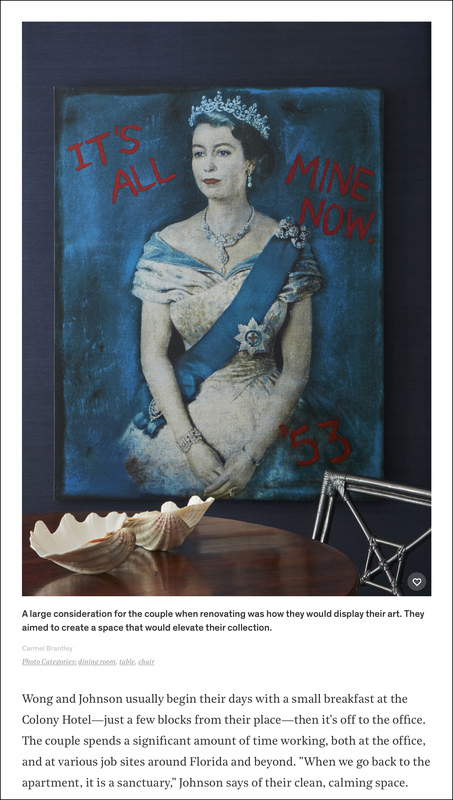 The home owners had a fabulous contemporary art collection which made the shoot all the more exciting. 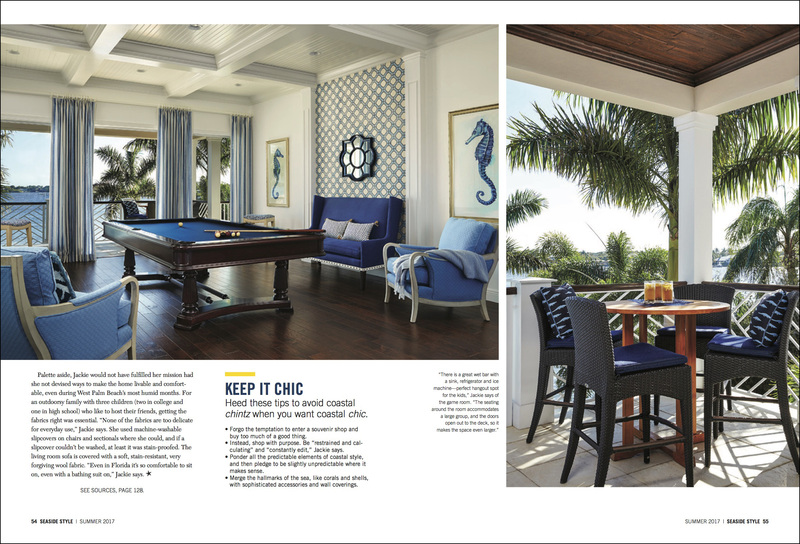 The 16-page spread was not only the cover of the Miami Edition of Luxe, but it was featured in the Palm Beach/Broward Edition, as well as the National Edition of Luxe Magazine – a real “hat trick” (for you hockey fans) for Brantley Photography! We are very grateful to have had this wonderful opportunity. Many thanks to the talented team at Luxe Magazine, including Pamela, Martin and Photography Director, Olivia Lambert! 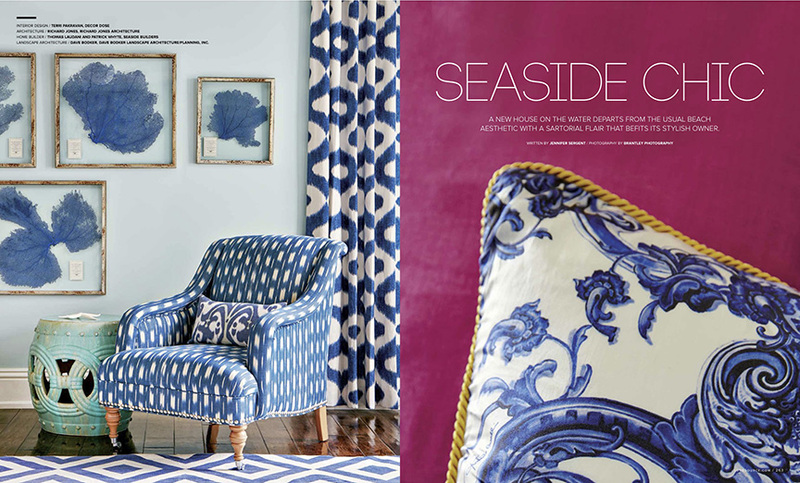 Excited to be a part of Seaside Style, Summer 2017 edition! 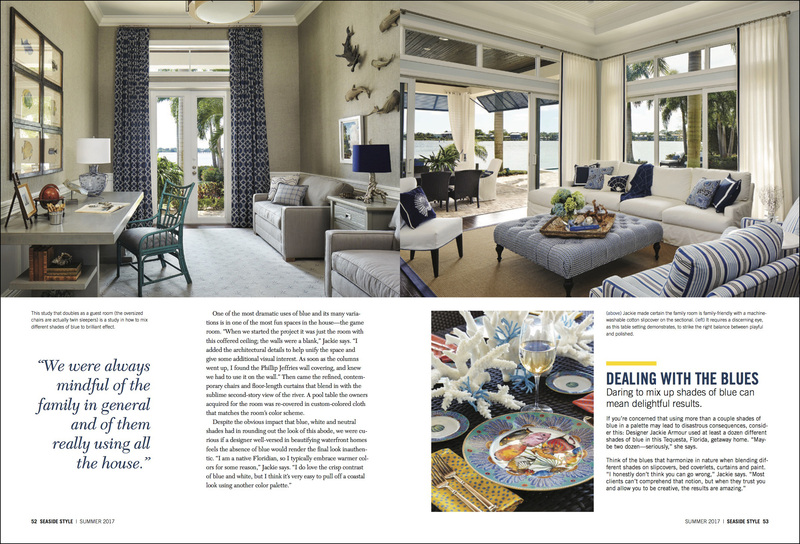 The magazine that touts “Shoreline Bliss from the Big Island to Palm Beach, features a 12 page spread on a project we photographed for long-time client Jackie Armour of JMA Interior Design in Jupiter, FL. 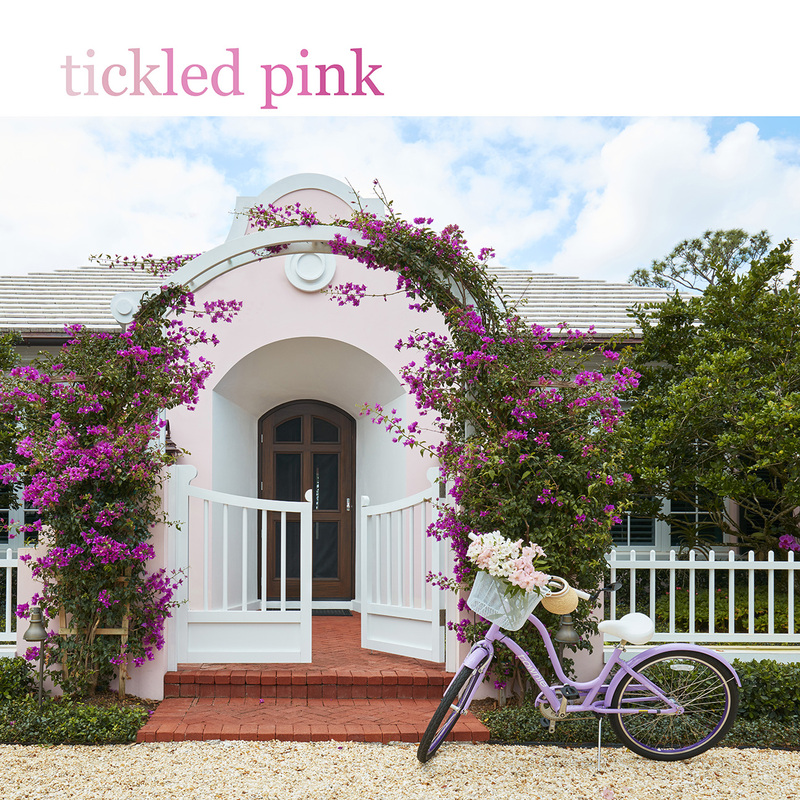 The house is located on the waterfront in Tequesta, FL. 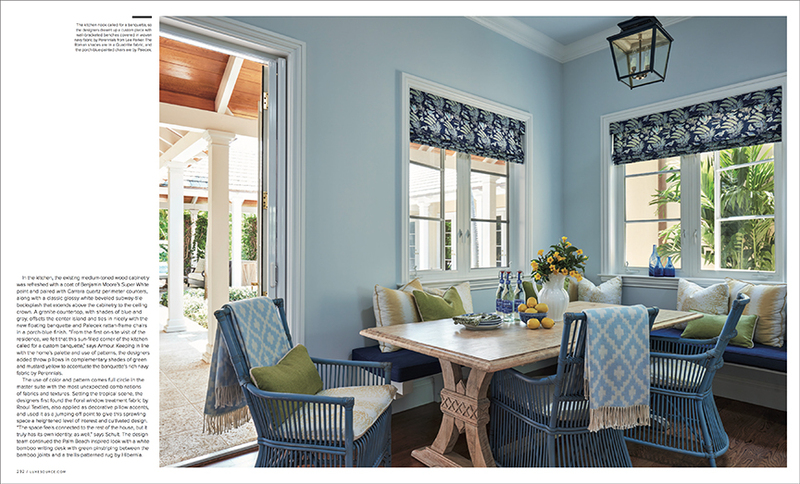 It is a true coastal home with an amazing patio and a blue and white color scheme throughout the interiors. 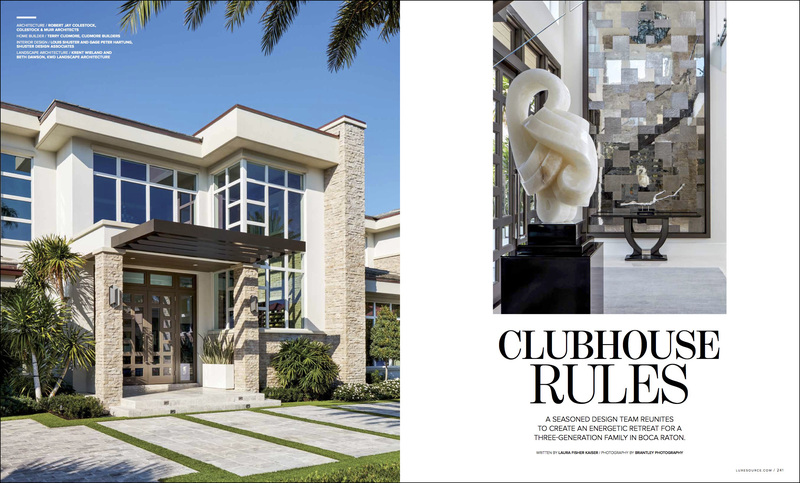 This marks the second article for this fabulous project as the first one appeared in a recent issue of the Palm Beach edition of Luxe Magazine. 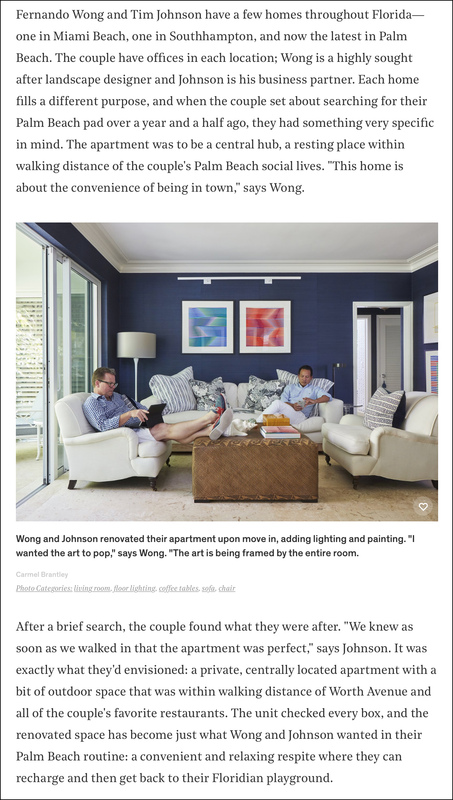 We love it when our clients get double (and triple) coverage from our photographs! 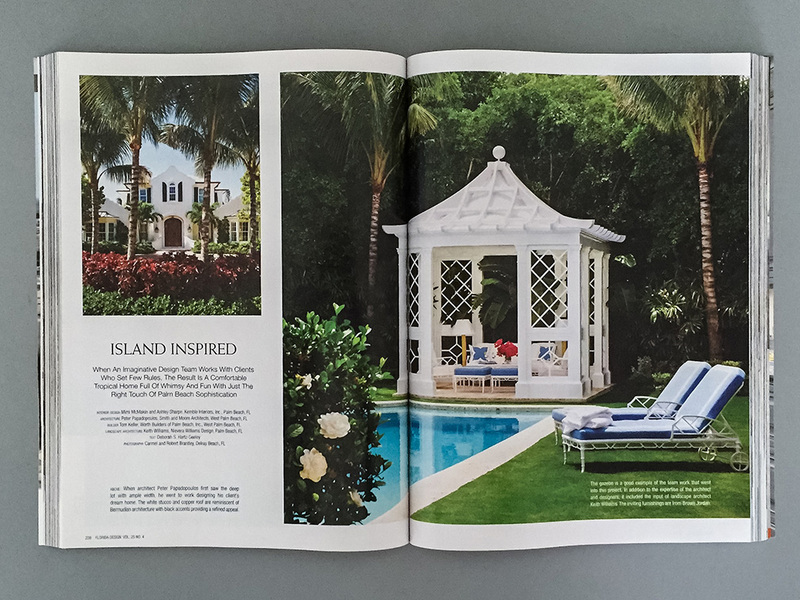 The May/June issue of Luxe Magazine Palm Beach is on the news stands now and features a fabulous project we photographed on editorial assignment for the magazine. It is a 9200 square-foot home in St. Andrews Country Club. The design team of Cudmore Builders, Louis Shuster Interior Design and Colestock and Muir Architects have worked together on several projects. We have been fortunate to have worked with all three of these talented firms on previous projects. This project, with its timeless look, was a pleasure to photograph. It was our first project having Luxe Director of Photography, Olivia Lambert on the shoot. It was great fun styling and collaborating with Olivia! 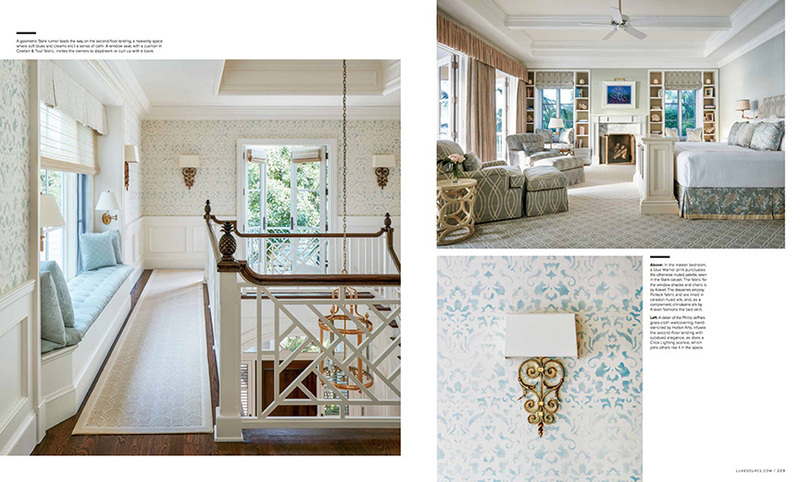 So happy to have our interior design photography featured in the new issue of Cottage White Magazine! 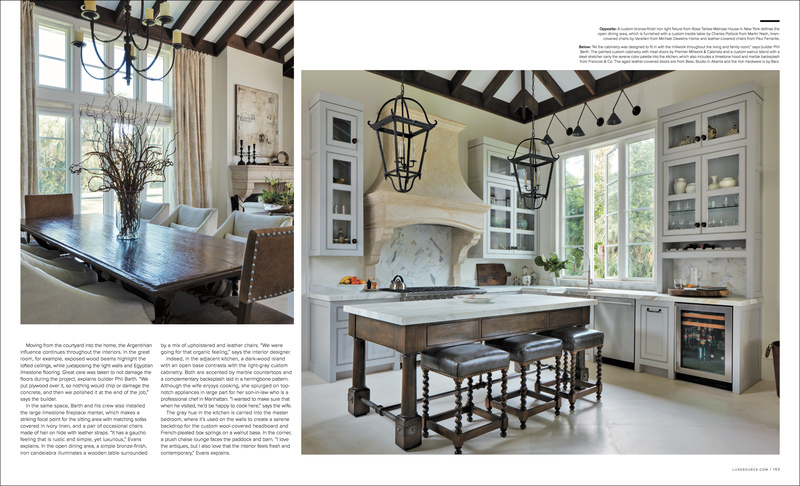 The beautiful 10-page spread highlights the work of our long-time interior design client, Jackie Armour of JMA Interior Design. 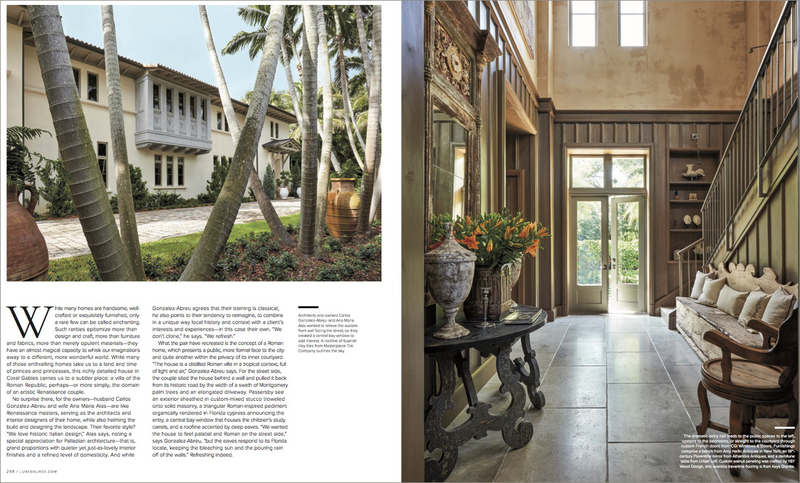 This Hobe Sound, Florida home has antique oak wood floors and reclaimed beams and wood doors. 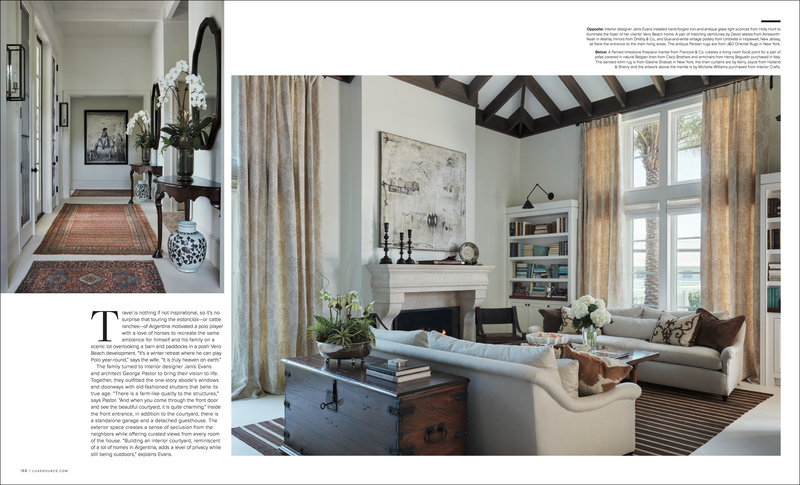 The 6000-square-foot home has Tuscan, French, and contemporary influences with subtle coastal vibes. 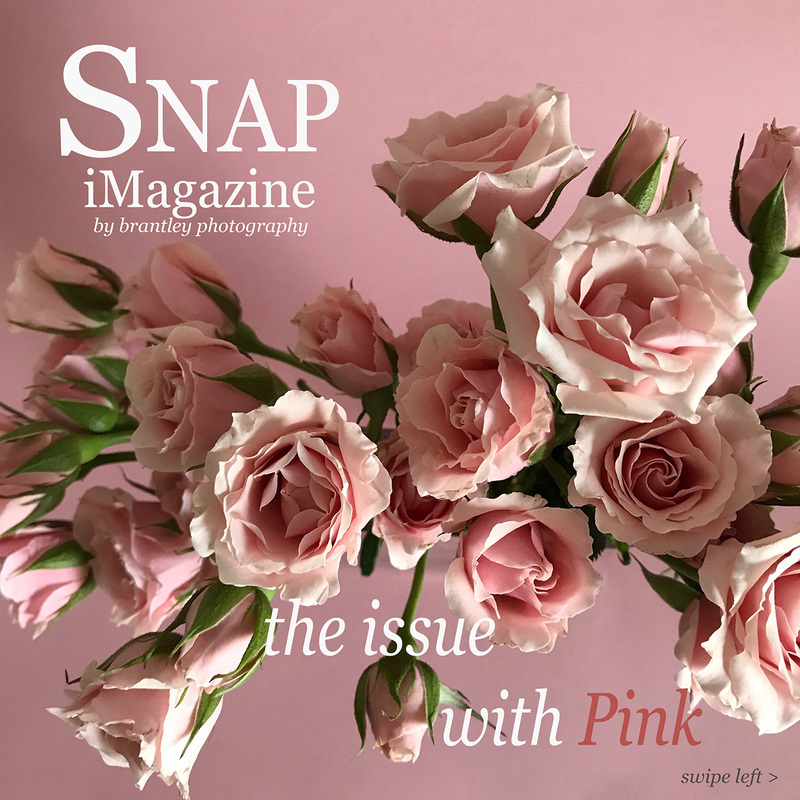 It is the second time it has been published in a magazine. The first time was in Luxe Magazine. 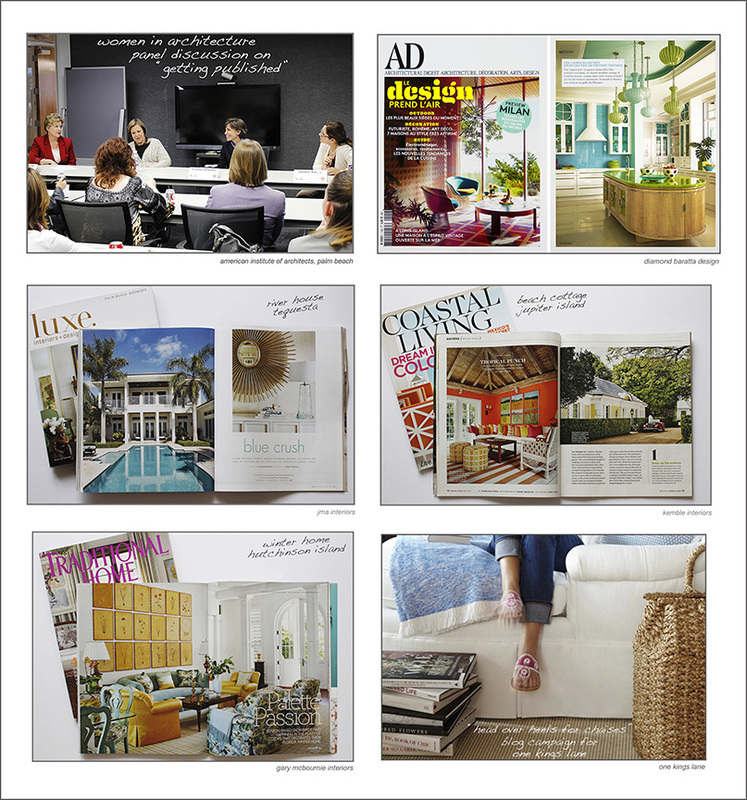 We love it when we can provide several publishing opportunities for our design clients! In honor of President’s Day, we thought we would share some Presidential interiors that we have had the pleasure of photographing over the years. 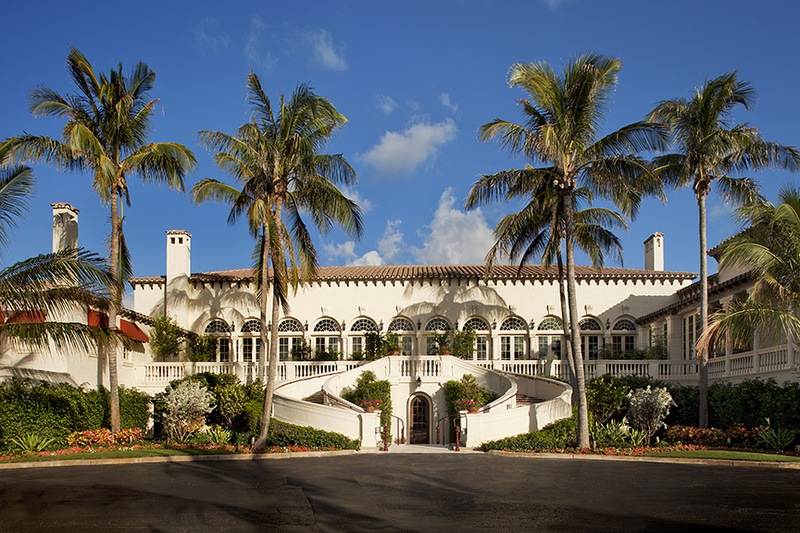 The Kennedy Estate in Palm Beach was home to the Kennedy family for over 60 years. Patriarch Joseph Kennedy bought the house in 1933 for $120,000. Used as the Winter White House by President John F. Kennedy, the historic property had a pool, tennis courts and no air conditioning. We were called in to photograph the house when the Kennedy family decided to sell it in the mid-1990’s. The private residence of President George H. Bush and Mrs. Barbara Bush is located on the campus of Texas A & M University in College Station, Texas. 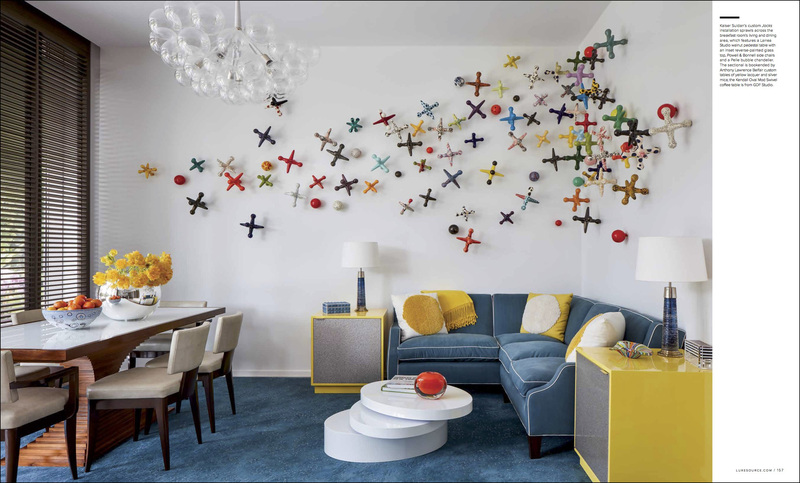 Designed by Mark Hampton, the apartment was bright and cheerful. Framed photographs of family and dignitaries were in abundance. We were told not to move any pictures in President Bush’s office as he hung them all himself and liked where they were placed. The apartment overlooks the Bush Presidential Library. 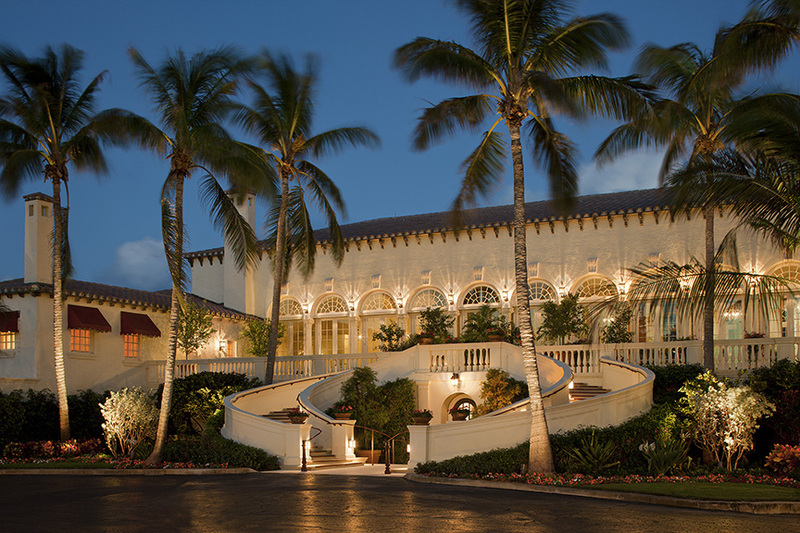 We have photographed Mar-A-Lago for several magazines. A historic landmark, the estate was built in the mid-1920’s by heiress and socialite Marjorie Merriweather Post. Post envisioned the house as a winter retreat for American presidents and dignitaries, and following her death in 1973 it was bequeathed to the nation. Successive presidents declined to use the mansion, which was returned to Post’s estate. Purchased in 1985 by Donald Trump, it now serves as Post intended as a winter white house in addition to being a members-only club. 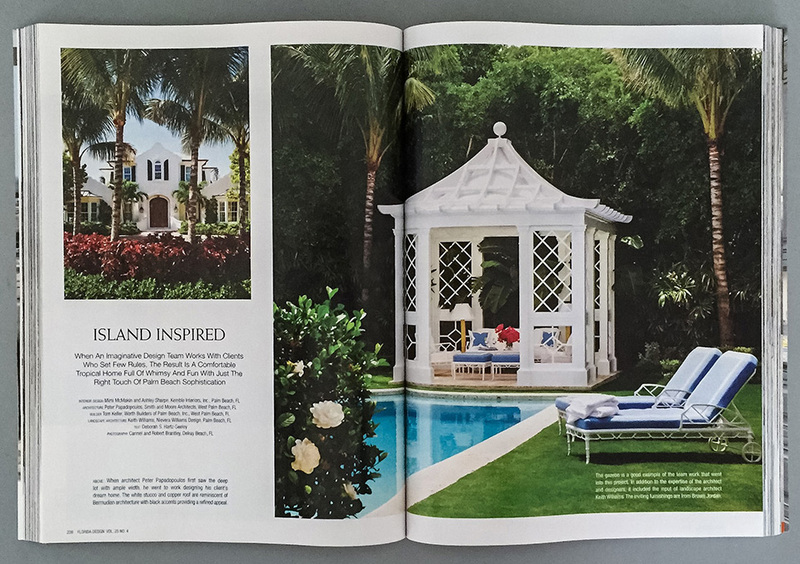 We recently had the opportunity to photograph a historic Palm Beach estate designed by famed architect Addison Mizner. The estate was built in 1923 for Arthur B. Claflin, a New York businessman. Case del Ensueno, as it was originally named, is over 17,000 square feet, with nine bedrooms, ten bathrooms, and seven fireplaces. 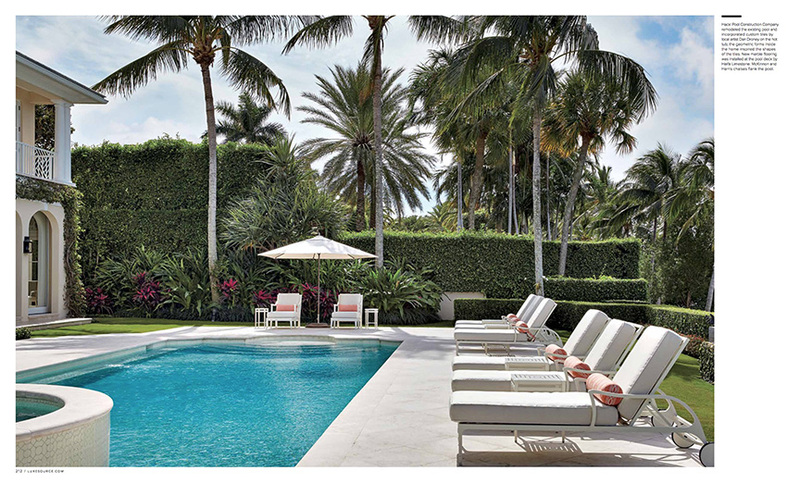 Situated on Lake Worth, the landmarked property is surrounded by lush tropical gardens. 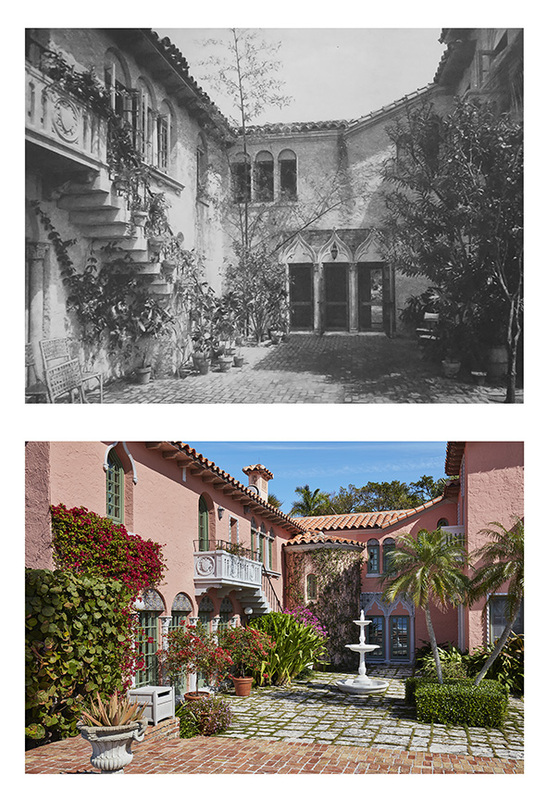 Always fascinated by these historic Mizner estates, I decided to research the background of this property. 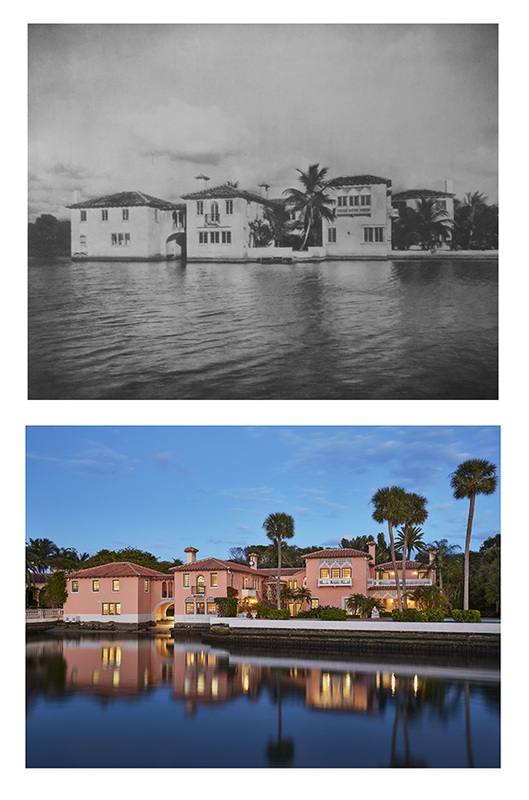 I found several photos of the original estate in the book, Florida Architecture of Addison Mizner, published by Dover Publications, Inc. 1992. Several additions have been made to the property over the years. Some where along the way, steps that lead directly into the water were added. Oh if these walls could talk I am certain they would speak of colorful tales! 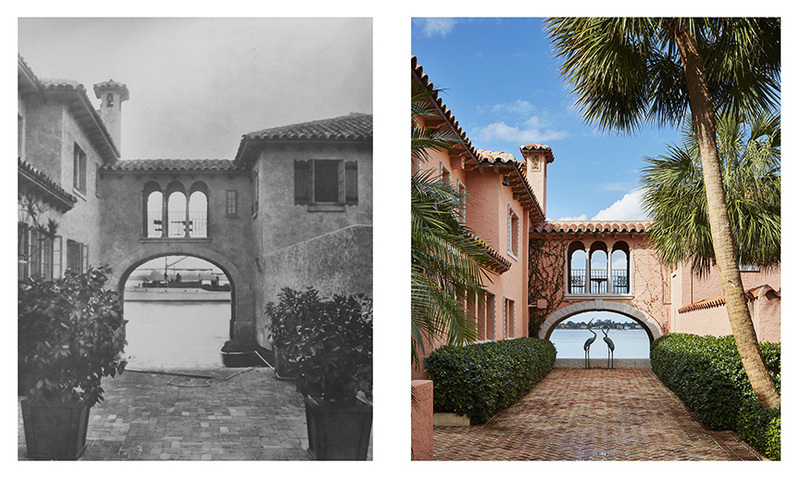 Equally fascinating is the architectural photography from the 1920’s to present day. While the equipment is different, and the photographic process changed from film to digital, the architectural perspective remains the same. Regardless of method and oblivious to time, the photographer’s eye is the one constant. We are so very fortunate to start off 2017 with several published architectural photography projects in both national and local design magazines. 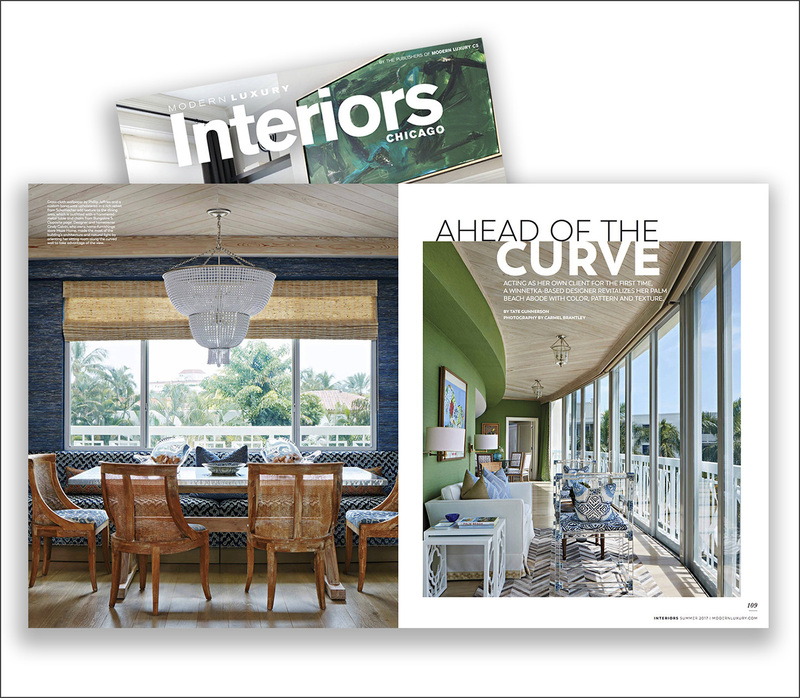 Architectural and interior design photography of our client’s projects are featured in four different magazines currently on the news stands. 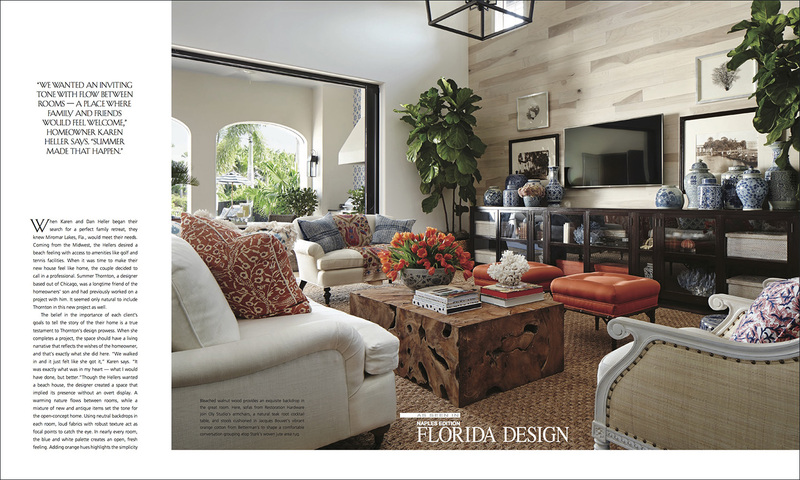 Florida Design features the work of designer Gary McBournie Design, Boston. 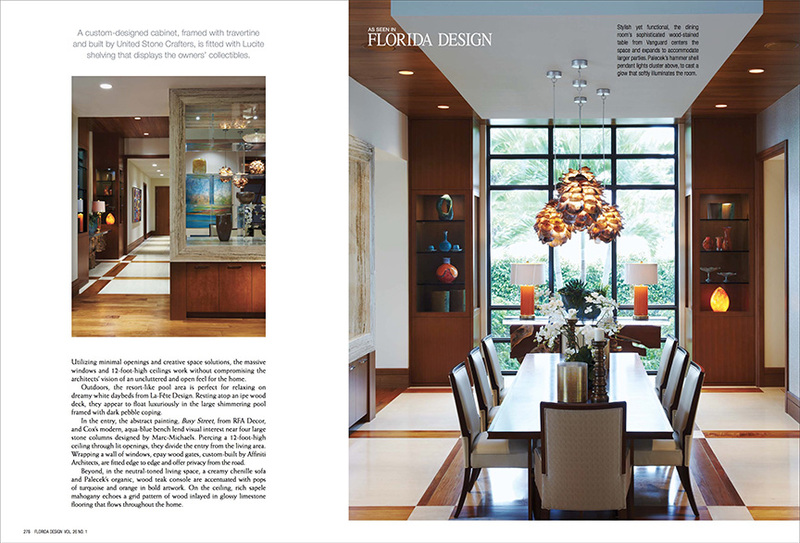 City and Shore Magazine highlights the work of Piper Gonzalez Interiors, West Palm Beach. 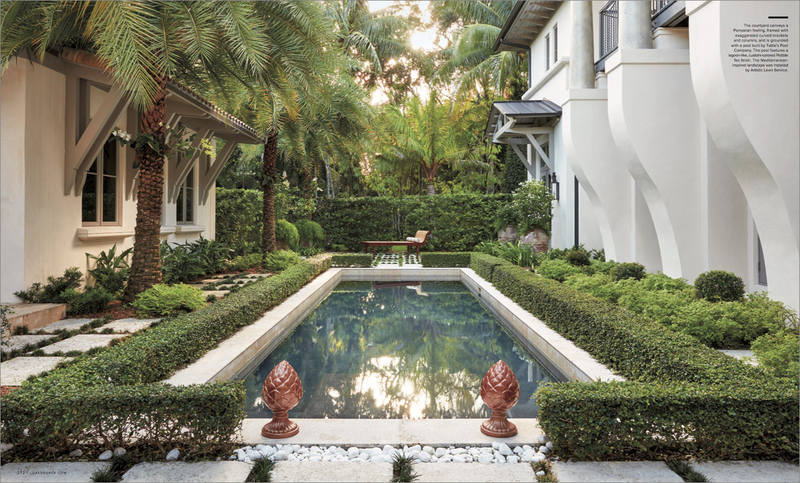 Florida Design Naples Edition showcases projects by Diamond Baratta, New York, Ficarra Design Associates, Naples, and Summer Thornton Design, Chicago. 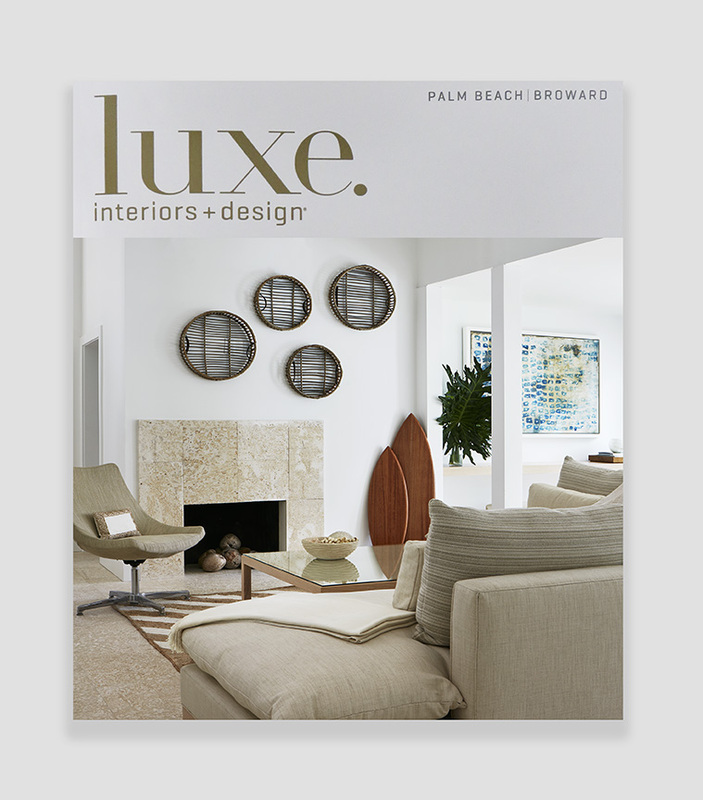 Luxe Palm Beach/Broward choose our photography of a JMA Interiors project for the cover of their Design 2017 issue. And, we made our first calendar appearance! Out on The Porch 2017 Calendar features our image of an upstate New York porch designed by Jack Fhillips Design, Palm Beach/New York, as its May photo. 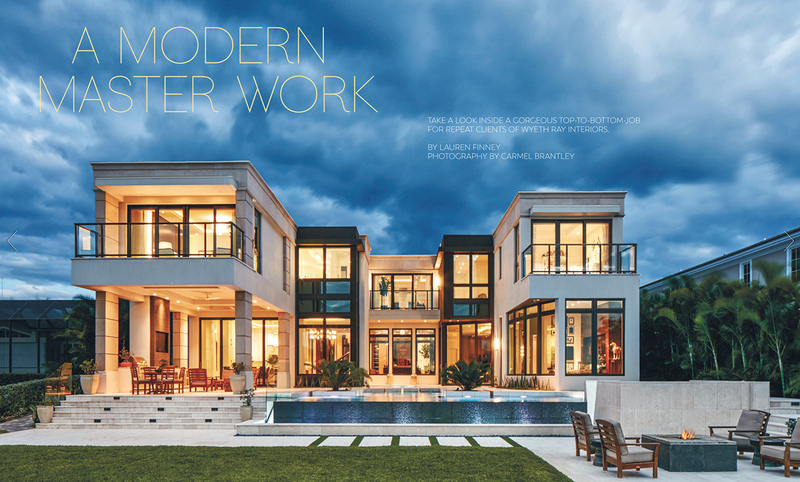 At Brantley Photography, we work hard to establish ourselves as the go-to photographers for interior designers, architects, and builders who want to get their design projects published in magazines, books, and on social media. We are very grateful to our talented clients that make this possible and to the wonderful editors, art directors, and bloggers who support us. Happy New Year to you all! 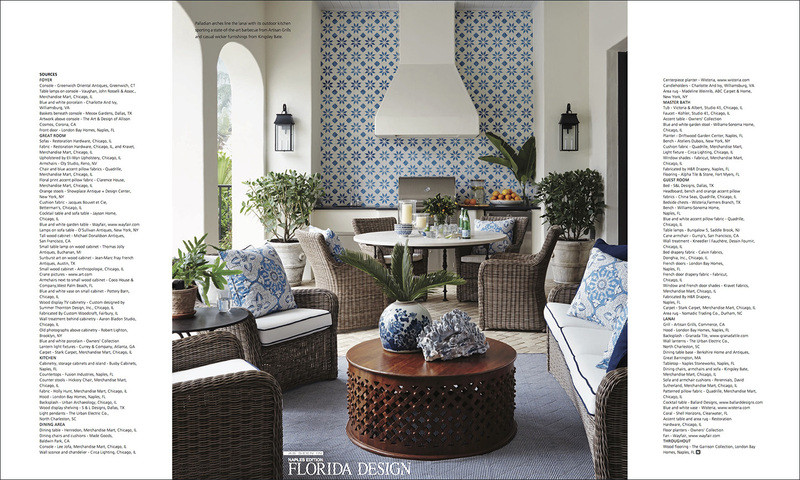 Excited to see our Hutchinson Island interior design project designed by Gary McBournie, Gary McBournie, Inc., Boston, featured in the current issue of Florida Design Magazine! 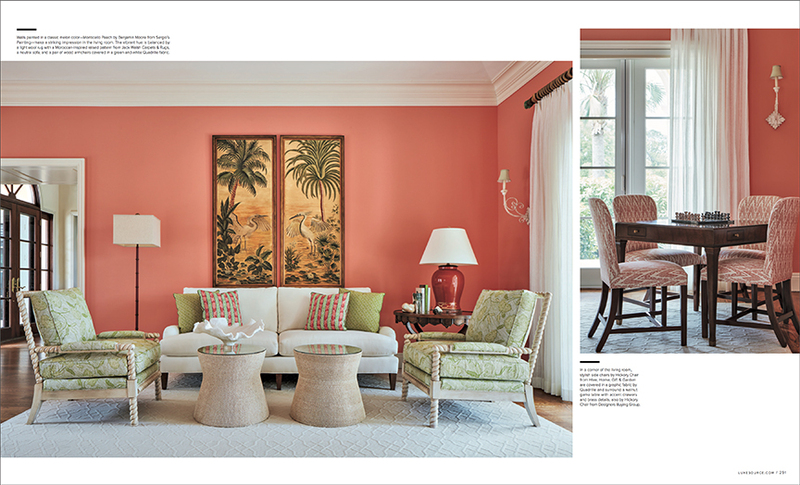 The 10-page article showcases the talent of Gary as he blended a warm, sophisticated color palette in a tropical seaside setting. 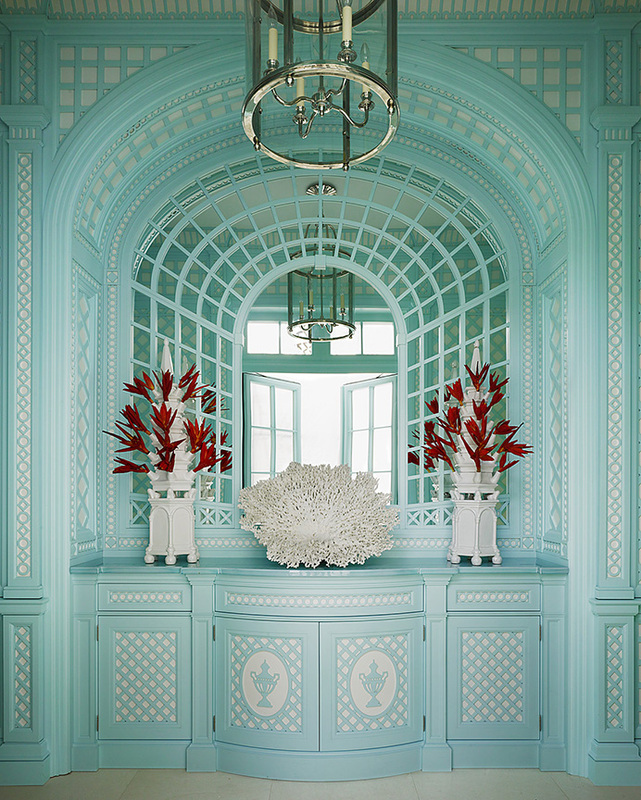 Gary has designed 15 homes for the same couple so he knew exactly what was needed in this stunning 12,000 square-foot, plantation style estate on a barrier island off the coast of Martin and St. Lucie counties in Florida. 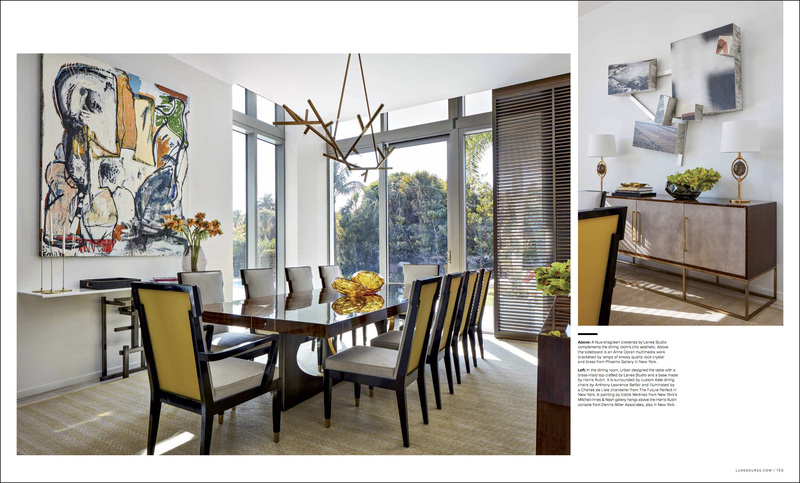 Our design photography of this house was previously featured in an issue of Traditional Home Magazine (April 2015). 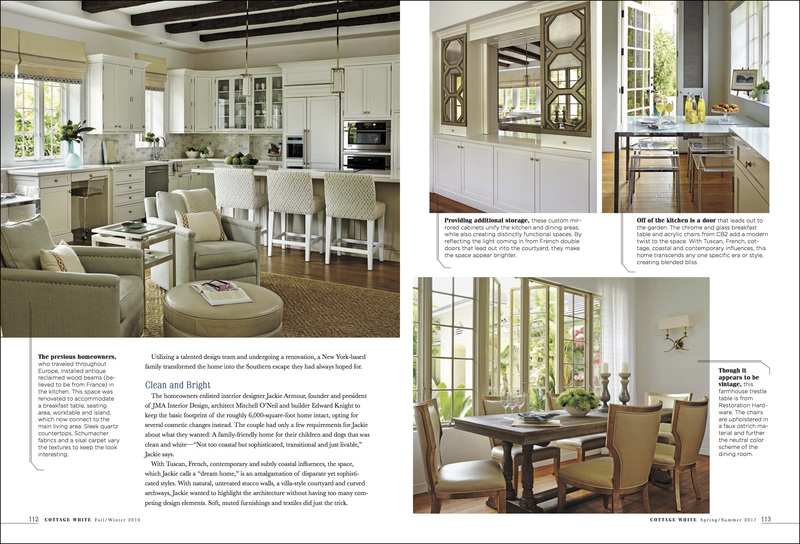 We love it when our photography of a client’s project is featured in more than one design publication! It is marketing at its best as we always try to provide as much exposure as possible for the many talented designers that hire us to photograph their work. And we are forever grateful to the many wonderful magazine editors who accept our projects. 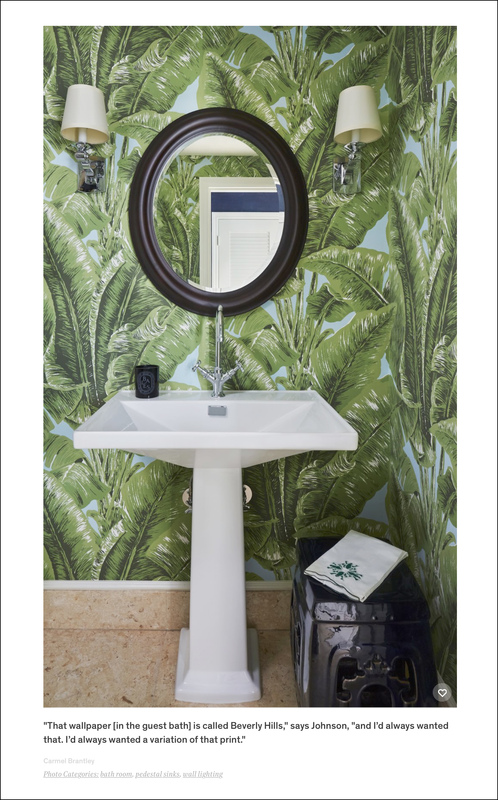 We were very happy when designer Summer Thornton of Summer Thornton Design in Chicago contacted us to provide Naples interior design photography for her project. 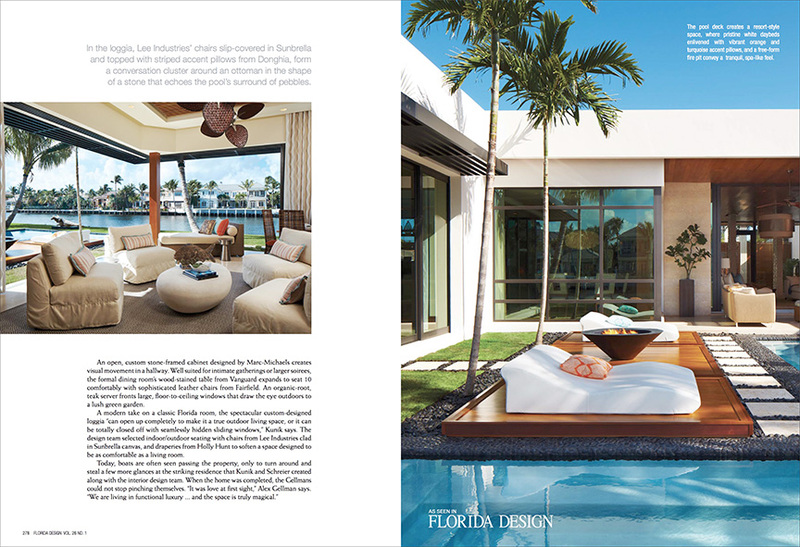 The house was designed for a couple from the Midwest, and is featured in the new issue of the 300-page Naples Edition of Florida Design. Summer and her husband Josh, asked if we would be willing to shoot on New Year’s Eve and New Years Day, as that was the only time they would be in Florida. It marked the first time that we said good bye to one year and hello to a new year while on the job! 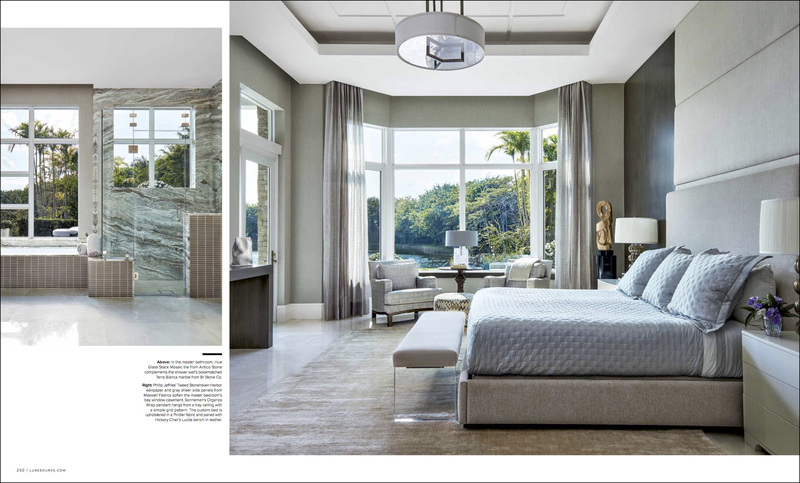 The November/December 2016 issue of Luxe Palm Beach/Broward features an interior design project we had the pleasure of photographing for our client Wietsma Lippolis Architects and Builders. 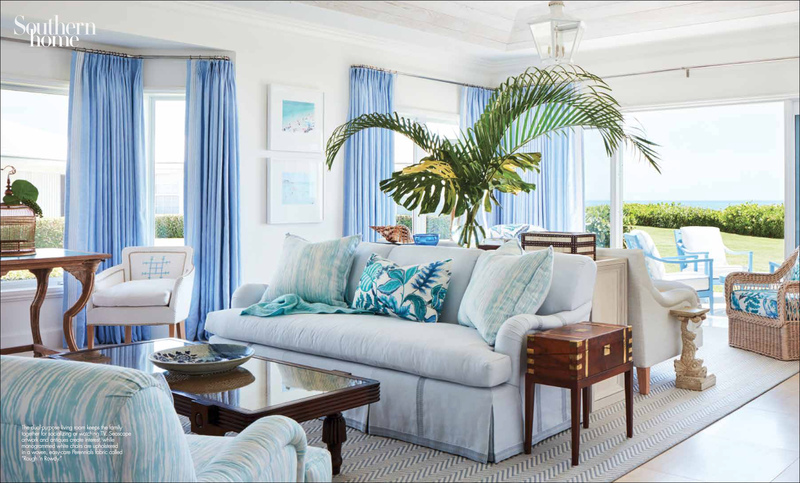 Located on the Intracoastal Waterway in Gulf Stream, Florida, the interiors are transitional with a Caribbean flair and a nod to British style. The architectural details are throughout the house from the woodwork and crown moldings, to the finishes and coffered ceilings. 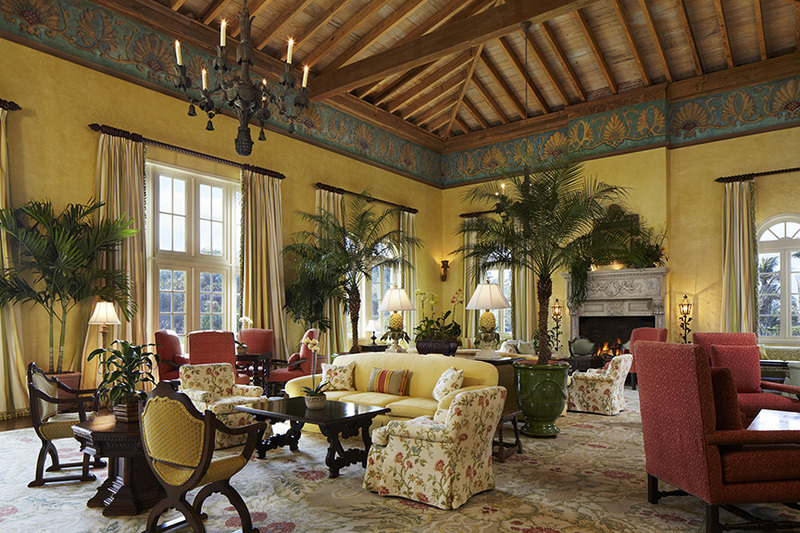 The study is especially warm with its pecky cypress ceiling and paneled walls. 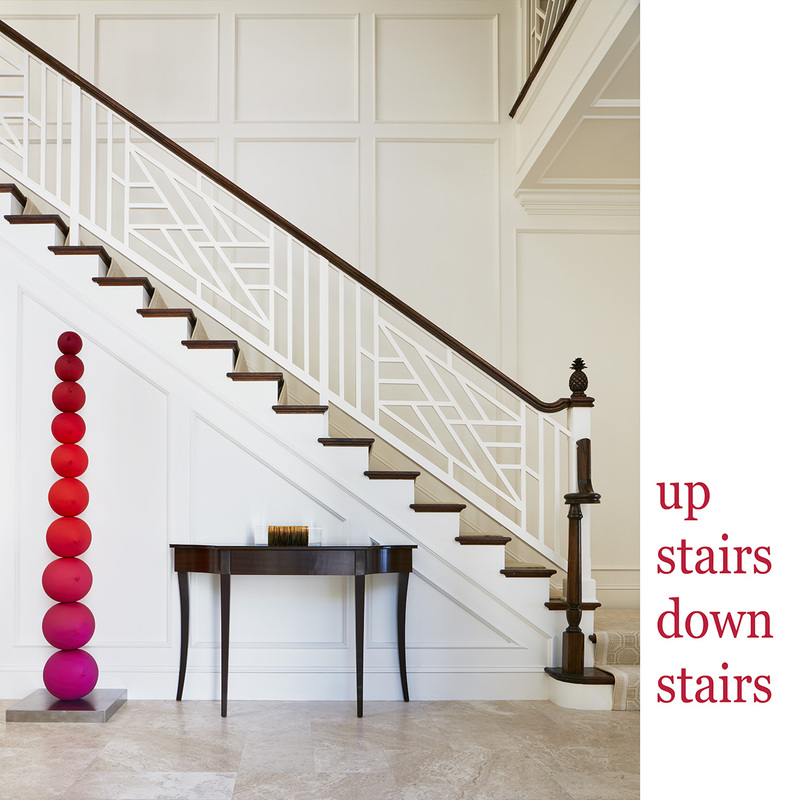 The interior design was by the homeowner, Ellen Hatton and her design partner Nancy Green. 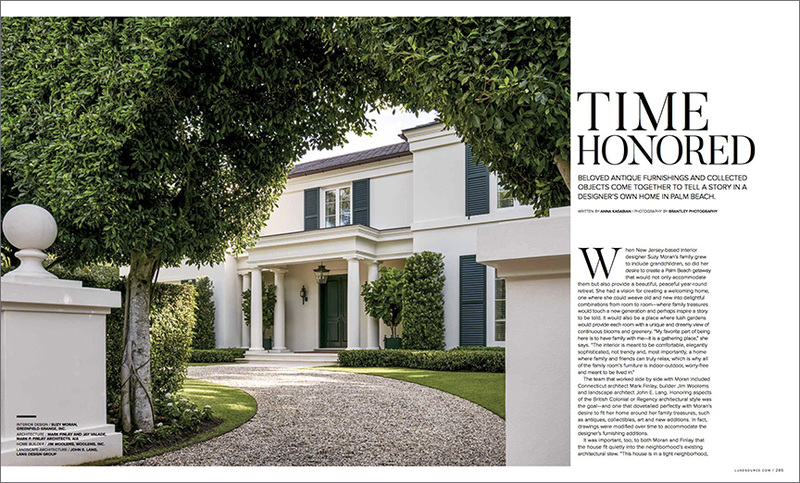 This stunning architectural gem in Coral Gables is the cover of the November/December issue of Luxe Miami Magazine. We were thrilled when Luxe assigned us this beauty! 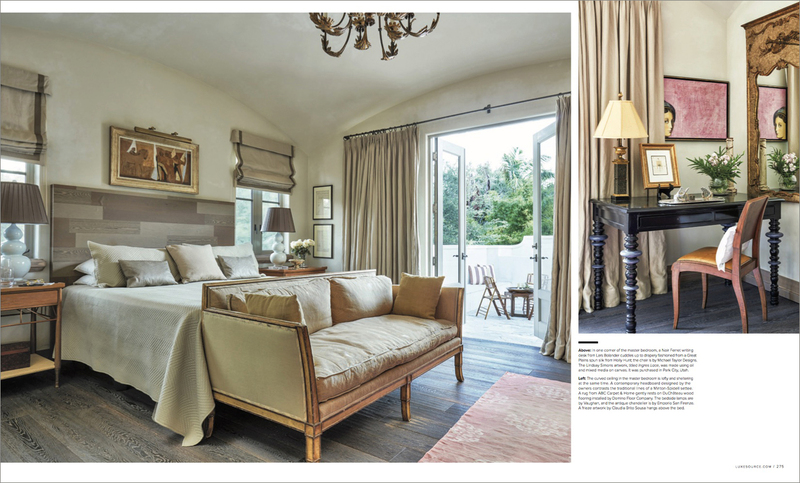 The 20-page spread, which is also featured on the cover of Luxe Magazine National Edition, is the work of the husband and wife team of Carlos Gonzalez-Abreu and Ana Maria Alas, GAA Architects in Miami. It also happens to be their own home which made the photo shoot even more exciting. 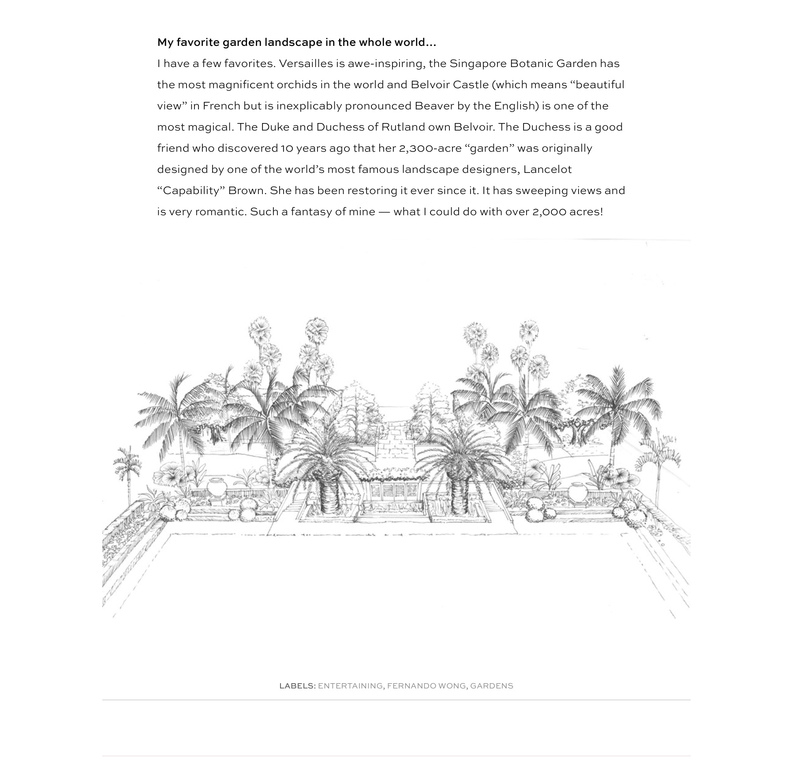 Carlos and Ana not only were the architects and interior designers of the house, they also designed the landscaping. Architectural elements of the richly detailed house are in keeping with their favorite style of architecture – historic Italian design. 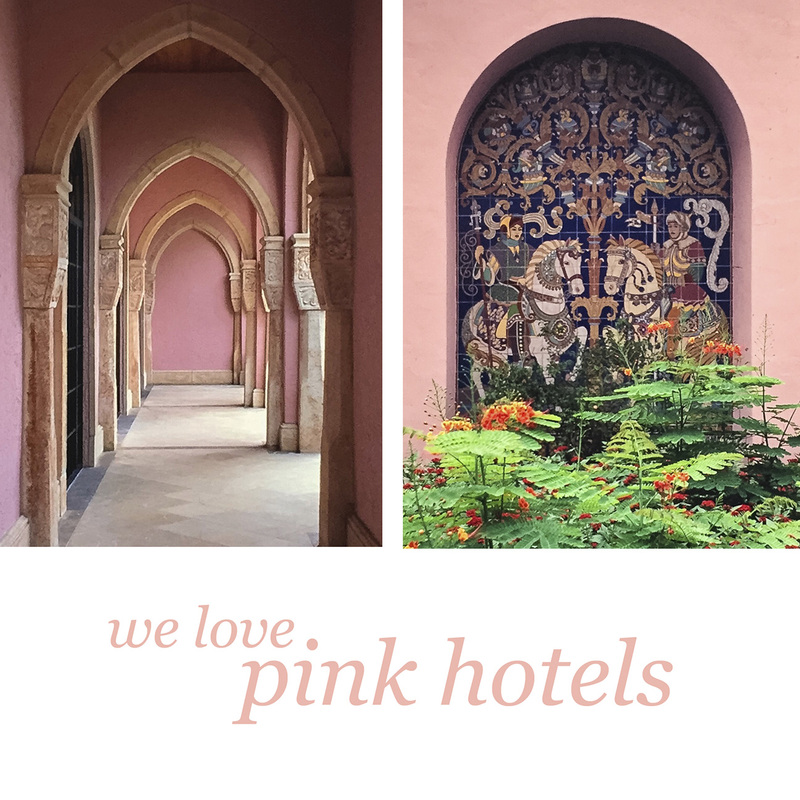 The inner courtyard features a stunning pool and patio with design elements reminiscent of a Michelangelo time period. 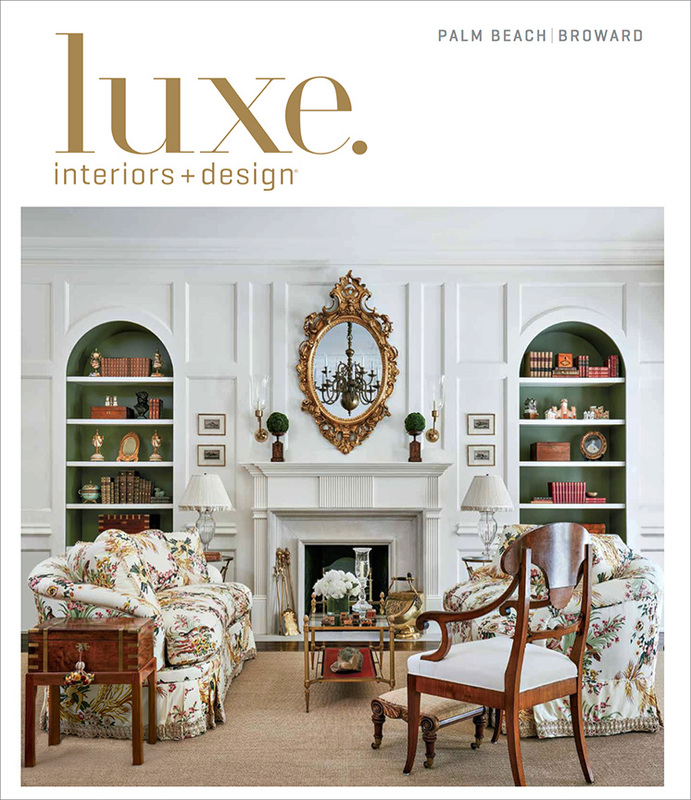 Thank you to the Luxe team and to GAA Architects! Wow! 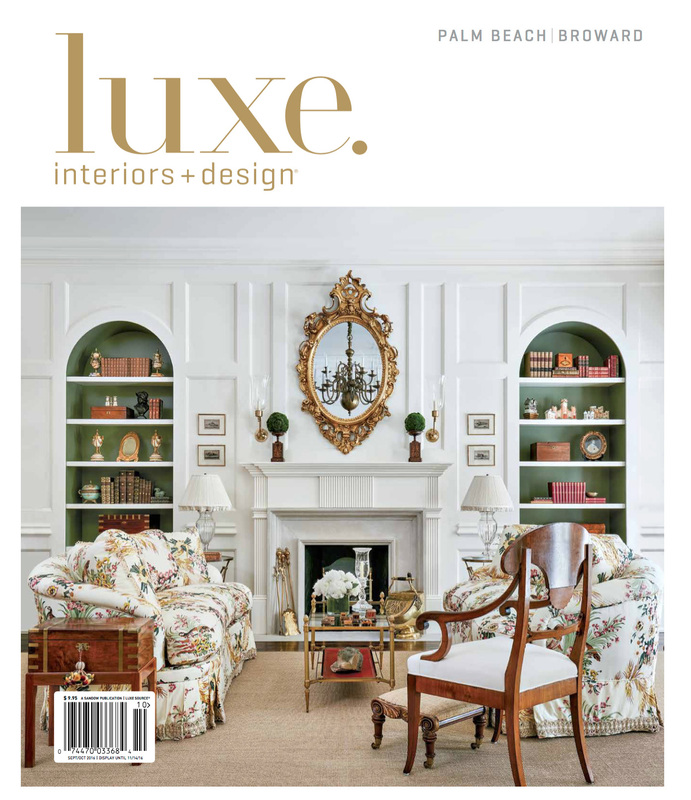 We are ecstatic at Brantley Photography to have our work featured as the Luxe Magazine National Edition Cover! 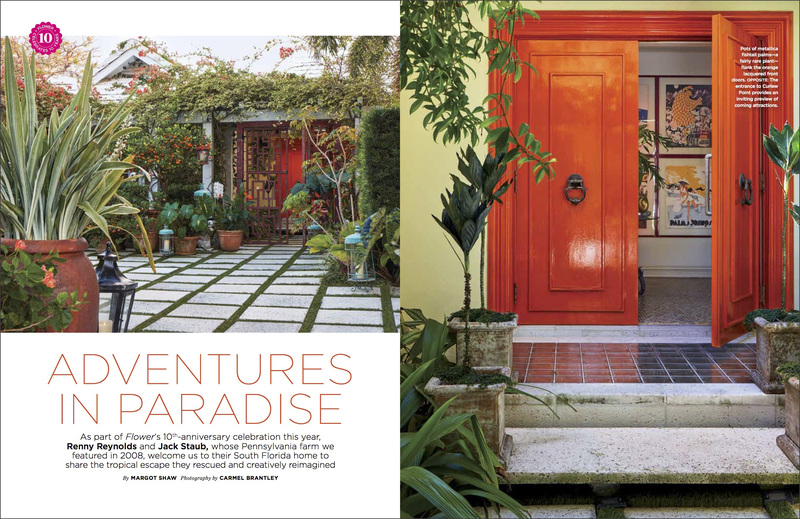 This beautiful Coral Gables home is not only the cover of the National Edition, but also the cover of the Miami Edition! We are grateful to Luxe and GAA Architects for giving us this wonderful architectural project to photograph. 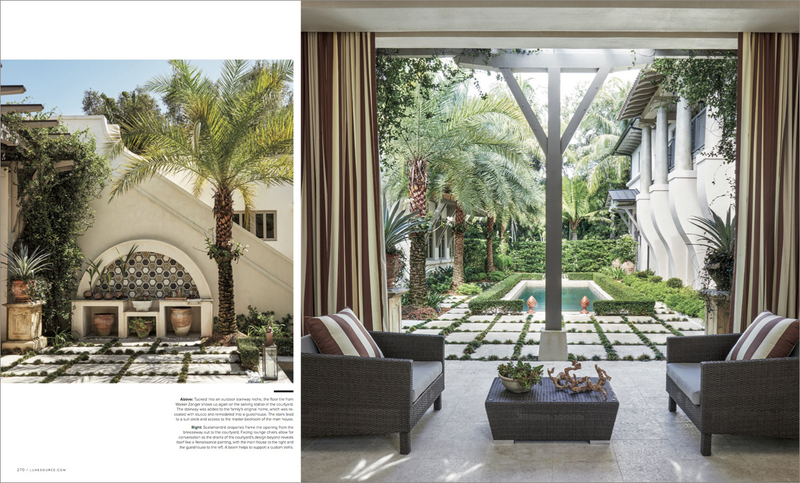 Pick up a copy of either the National Edition or the Miami Edition to see the twenty-page spread of this visually exciting home. Both interiors and exteriors reflect a new and fresh approach to the idea of an Italian villa design. Robert and camera staying drying under the rain poncho and umbrella. Thank you to assistant Dan for the expert umbrella holding! Two cameras set up and ready to go. 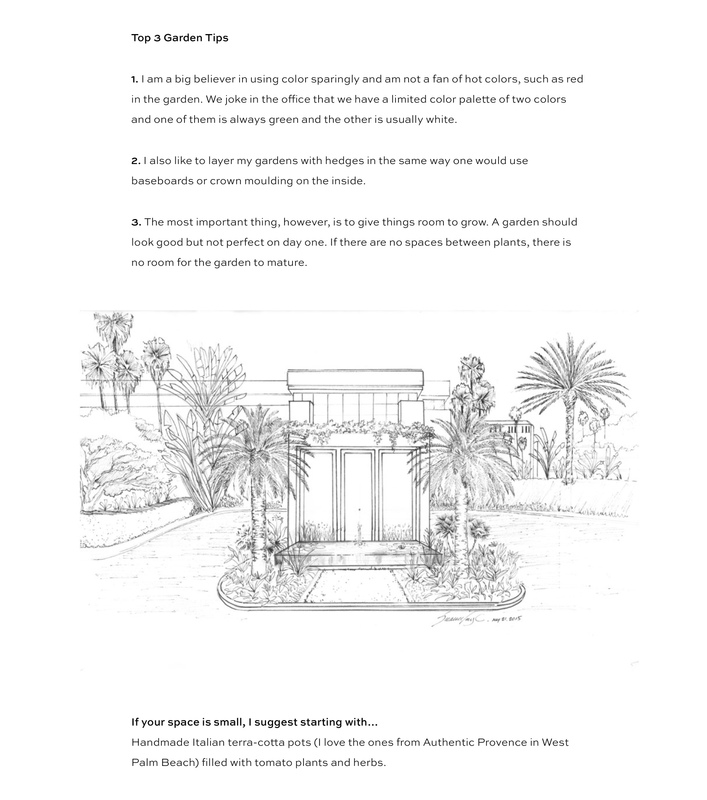 The challenges for a Florida architecture photographer can at times be quite numerous. The main challenge is in dealing with Mother Nature and her changing moods. One minute sunny, blue skies prevail and the next, thunder, lighting and you are running for cover with cameras in tow! 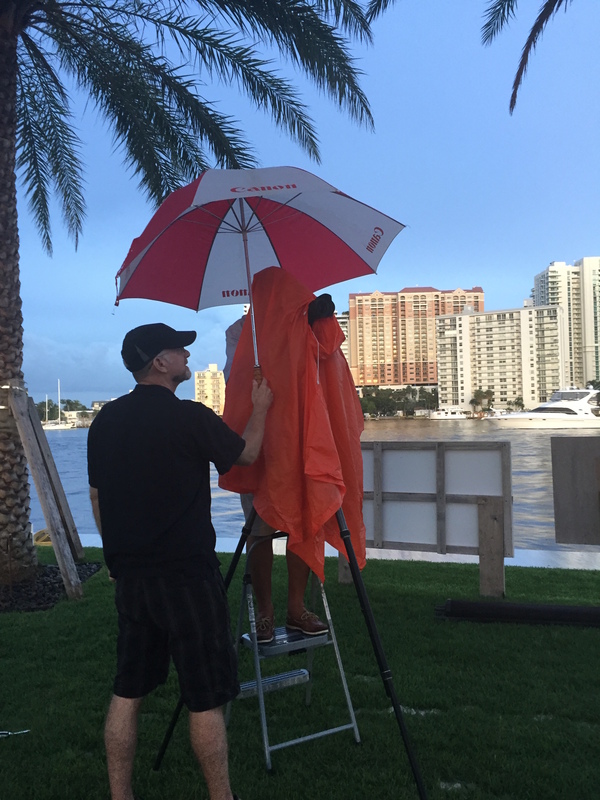 Last week, we enjoyed a three-day photo shoot in Ft. Lauderdale for one of our long-time clients, Danielle DePerro Designs. The project was a private residence located on the water. Very contemporary in both architecture and interior design, we planned on shooting a mix of daytime, dusk and evening images. Each night we had scheduled dusk shots. And each night it rained! 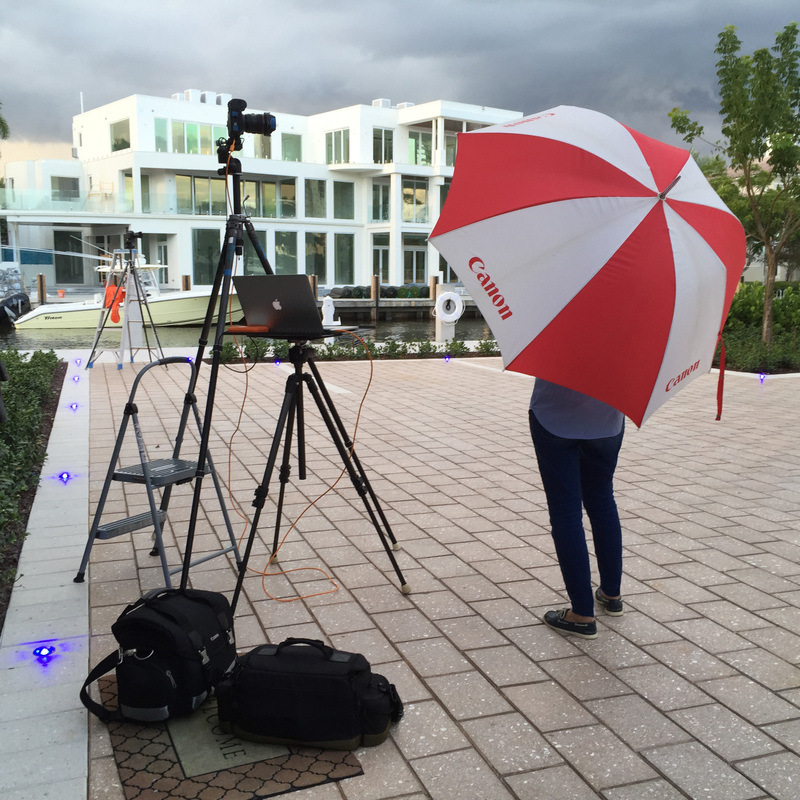 As you can see from the photos, we are always prepared with our trusty Canon umbrella and rain ponchos. We always plan our escape route to the nearest cover should the rain become too heavy or the lightening a little too close. Dusk photos are challenging even on good weather days as they require precise timing, and proper lighting. As it turned out, we were able to get the images we wanted. Like the postal service, neither snow, nor rain, nor heat, nor gloom of night will keep us from getting the perfect photo! 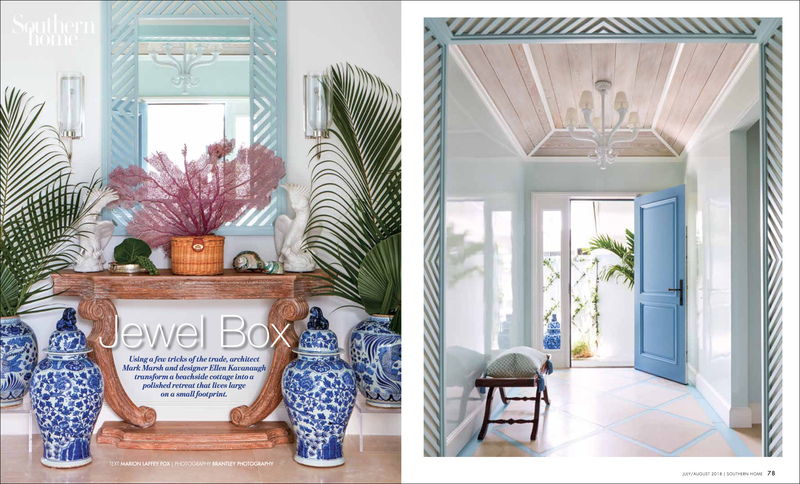 The new issues of Luxe Palm Beach and Luxe Miami both feature interior editorial photography by Brantley Photography. 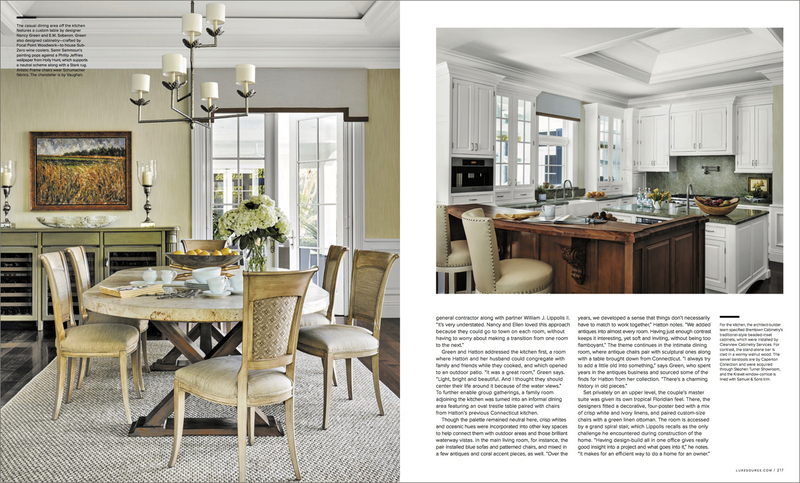 We were very fortunate that our project for Jennifer Knowles Design and Cudmore Builders was selected for both issues. 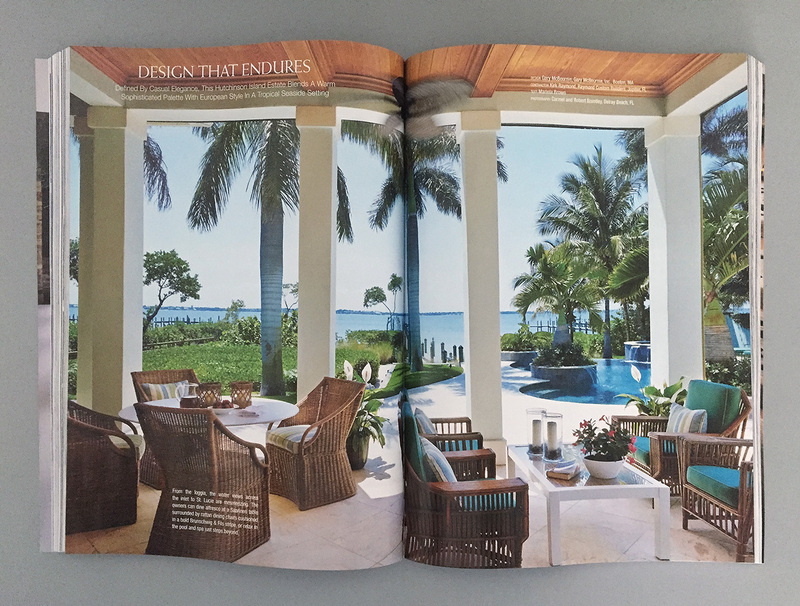 The 12-page spread features a Delray house located on the intracoastal waterway. 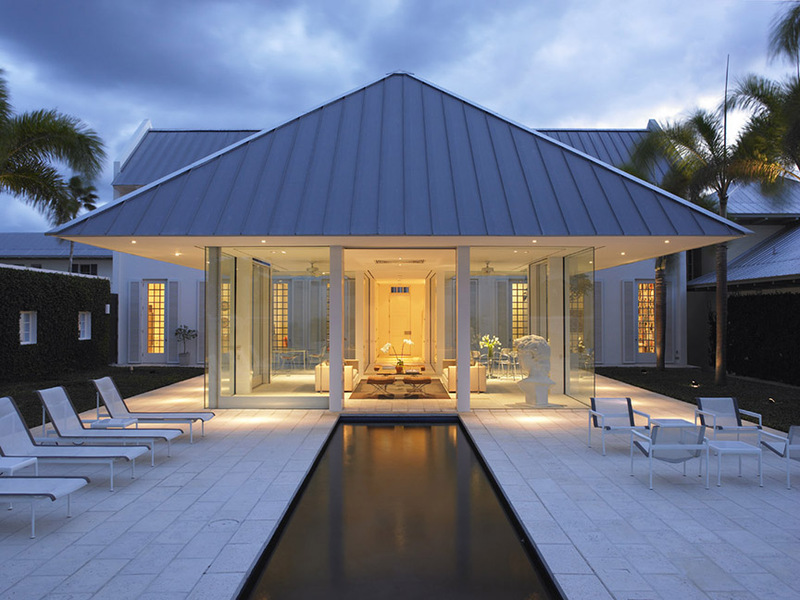 The tropical modern home has a color palette of charcoal, gray and white with a few splashes of gold. The shoot took place while the house was being furnished and still under construction. With teamwork, we pulled it together! Mother Nature did not cooperate either as we had some of the worst rain storms of the year! 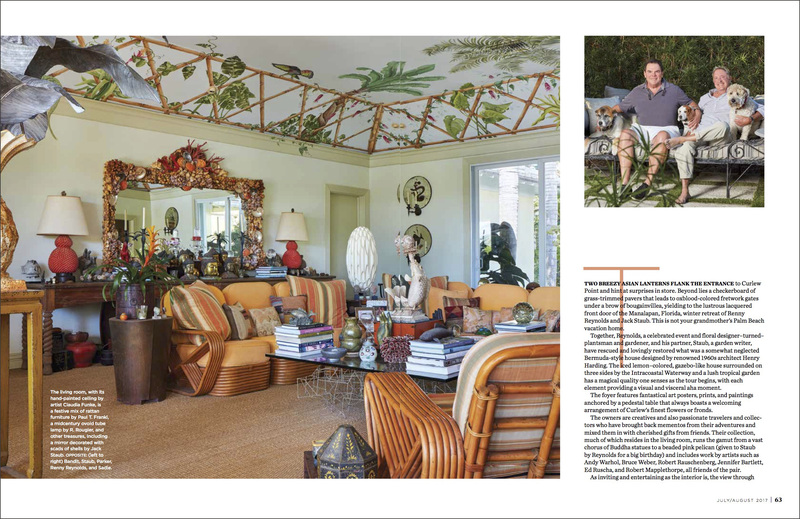 This grand estate on Captiva Island has always been a favorite photography project which showcased island architecture and tropical interiors. Designed by Stofft Cooney Architects along with Diamond Baratta Design, this ocean front home is as colorful as they come. 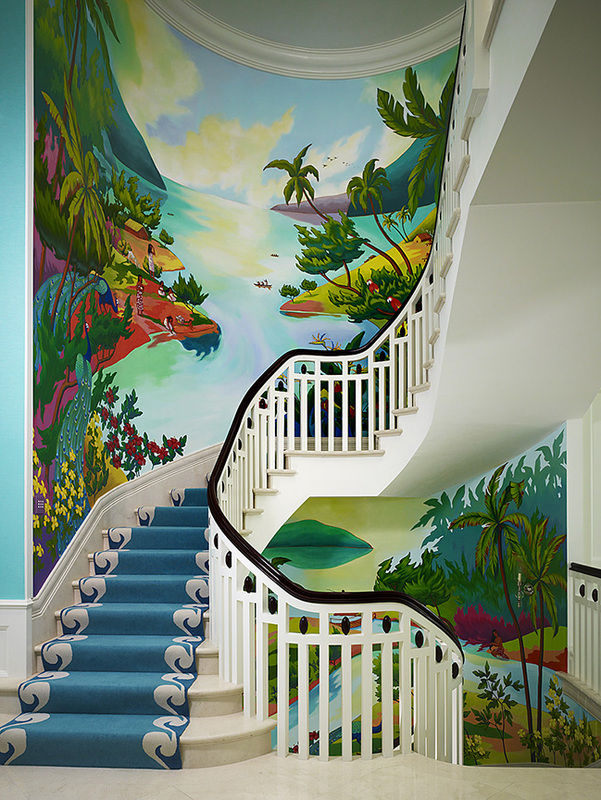 The design is whimsical and tropical with an infusion of color. We worked with the late Bill Diamond on the two day shoot. Bill was always a perfectionist and demanded that every shot be perfect no matter how long it took to set up. That was fine by us as we wanted every shot to be perfect! My favorite room in the house was by far the kitchen with its unique and contemporary feel. I could cook all day if I had that kitchen! 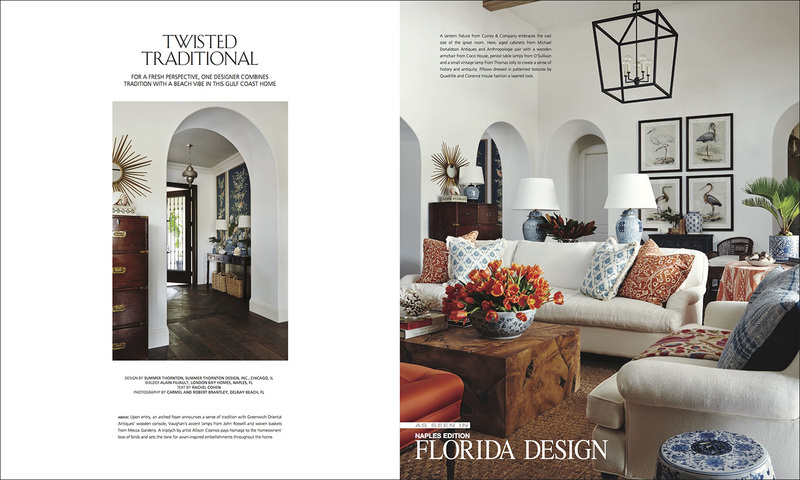 The house was published in Florida Design Magazine and has been on several blogs. 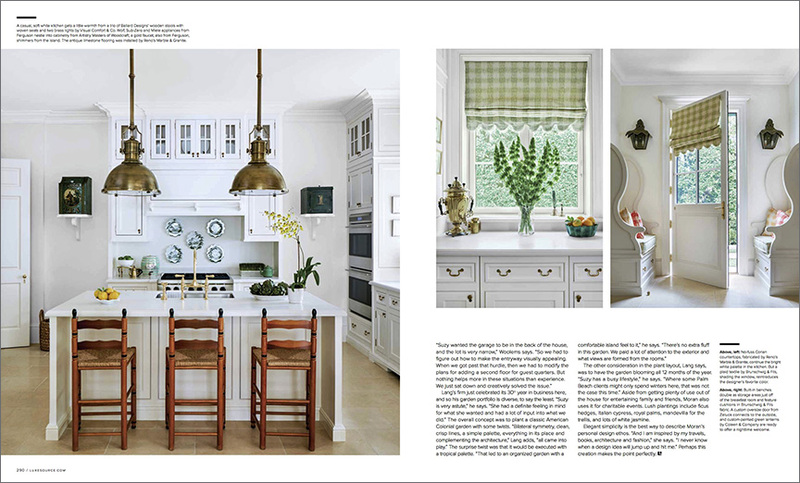 The kitchen shot has been featured in several blogs and magazines including Architectural Digest France. 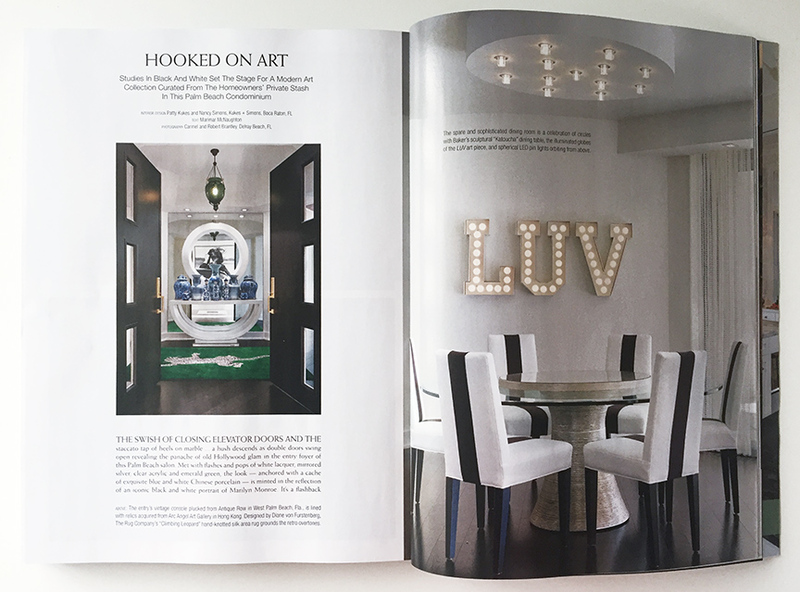 Thrilled to have been hired by Luxe Magazine to shoot this Miami interior photography feature that is in the current issue of Luxe Miami. The 16-page article titled “Global Fushion” showcased the work of designer Tatum Kendrick of Studio Hus, Los Angeles. 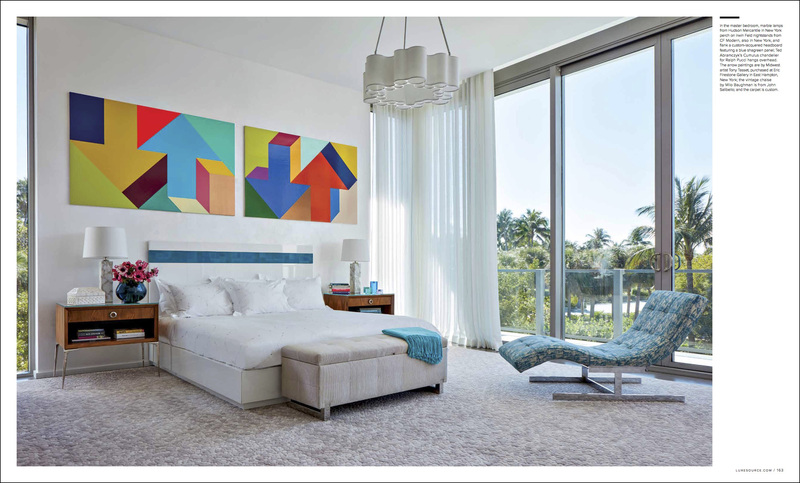 Located on Fisher Island, the condo combined a Cuban vibe with the essence of the French Riviera. 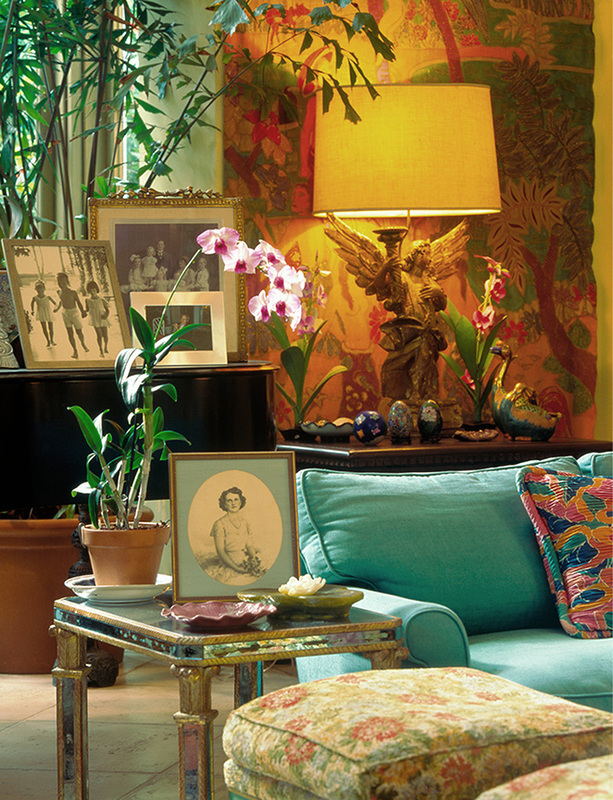 Tatum worked with her clients, a New York couple with Cuban roots, to create a home with a romantic, spiciness. It is always a fun adventure for us when it comes to shooting on Fisher Island, which I am sure has a lot to do with riding the ferry to and from the island. 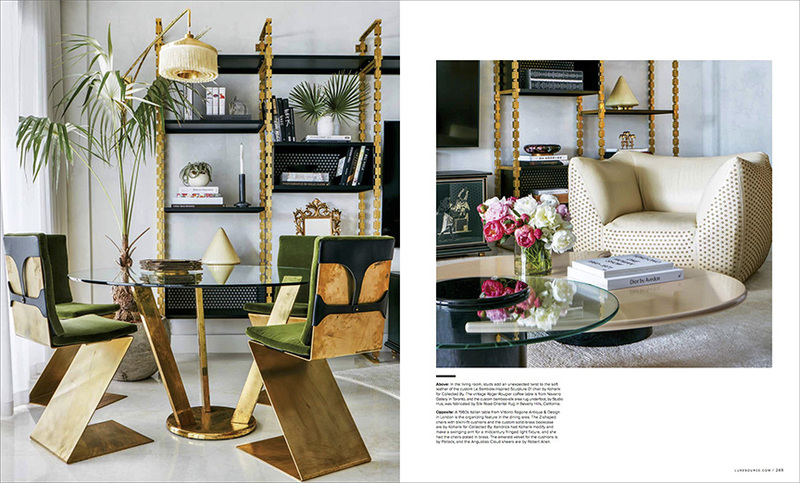 Working with designer Tatum and editor Jesse Bratter from Luxe, we collaborated on angles, styling and furniture placement. The weather started out great but quickly turned to clouds and heavy rain. We were lucky to get the patio shot while the sun was still shining! A huge thank you to Luxe for this exciting assignment! 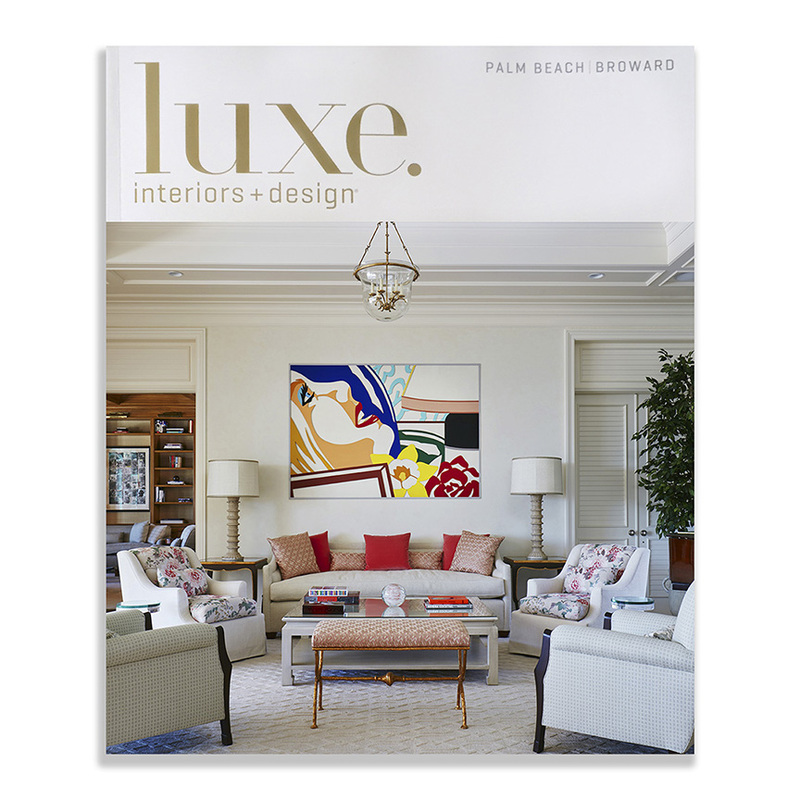 We are extremely excited to have our photography showcasing Palm Beach interior design on the cover of Palm Beach/Broward Luxe Magazine! 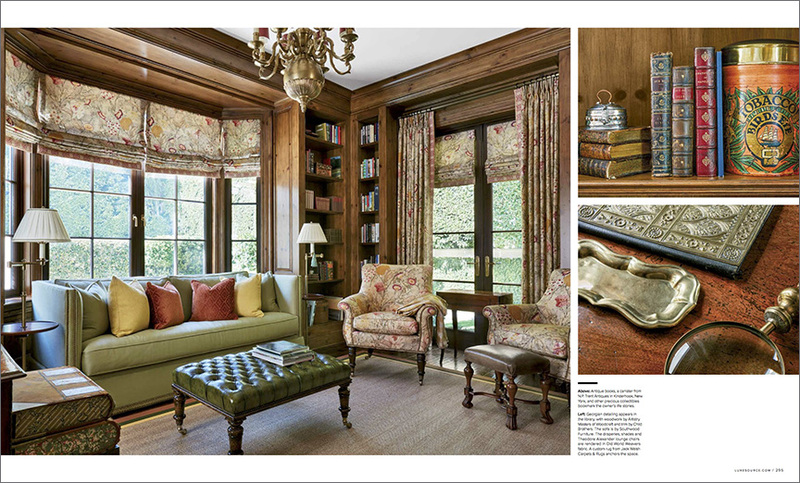 The 14-page spread features the home of designer Suzy Moran of Greenfield Grange Design. Suzy is a long time client of Brantley Photography. We have had the pleasure of photographing Suzy’s previous Palm Beach home as well as her stunning estate in Morristown, NJ. 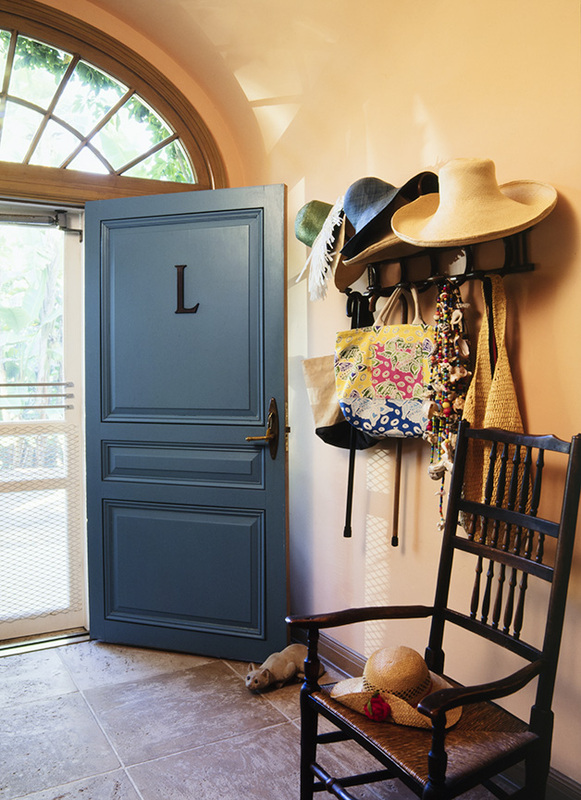 Her new Palm Beach home is sophisticated and elegant, with a mix of antique furnishings and collected objects. 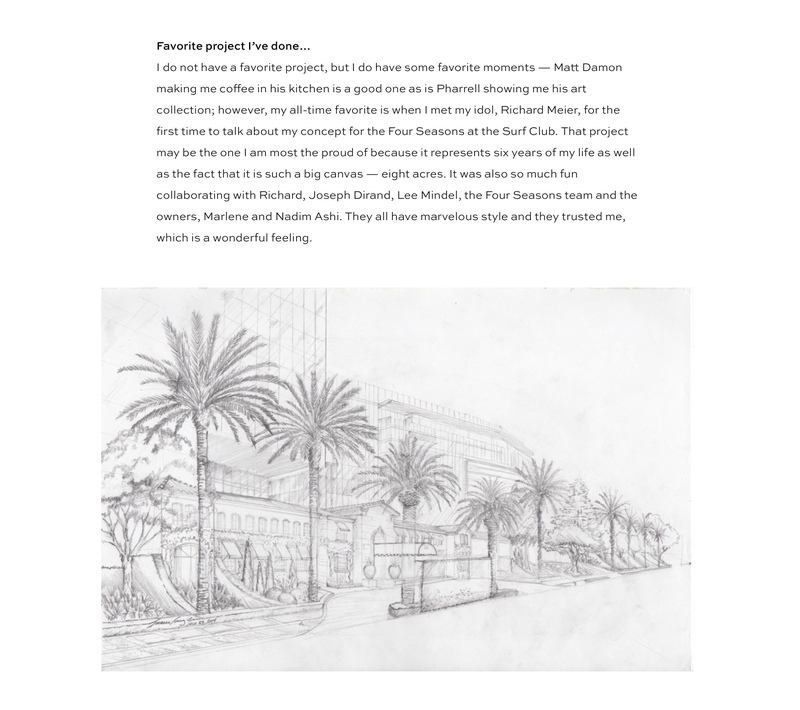 Suzy’s team included architect Mark Finlay, builder Jim Woolens and landscape architect John Lang. The 7,ooo-square-foot home has a symmetrical layout that aligns with the Regency style of the 1800s. 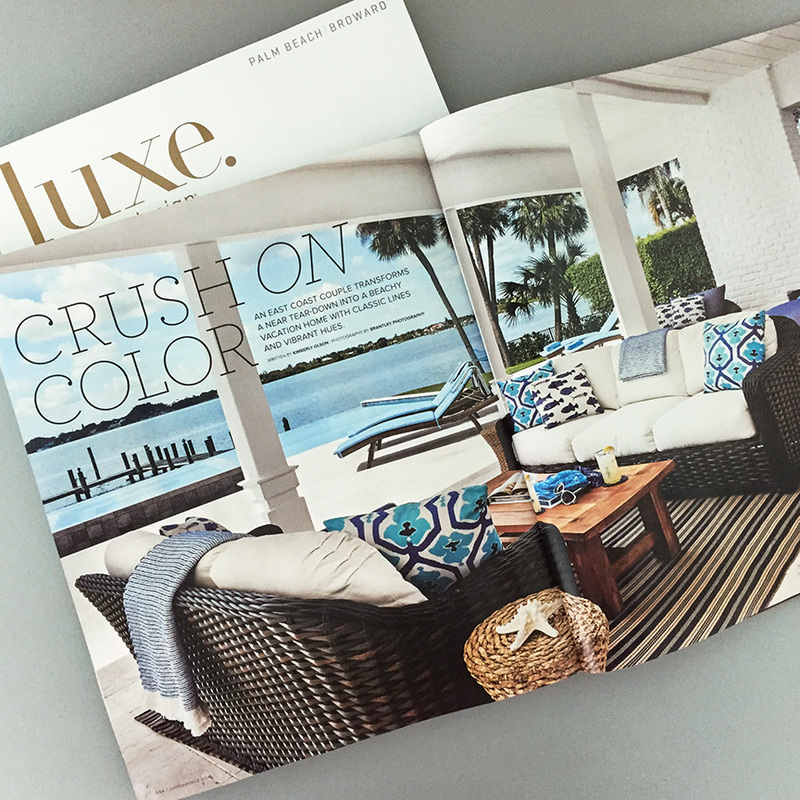 The creative team at Luxe did an amazing job with the layout, which features the front exterior, foyer, living room, kitchen, bedroom, library and pool/patio. From the scouting shots we submitted to the magazine, photography director Olivia Lambert was able to tell us which areas she was interested in for the layout. Other than that, the magazine left the creative aspects of the photography up to us. It was a wonderful two day shoot that resulted in a beautiful magazine cover and feature article for our client, of which we are most proud! 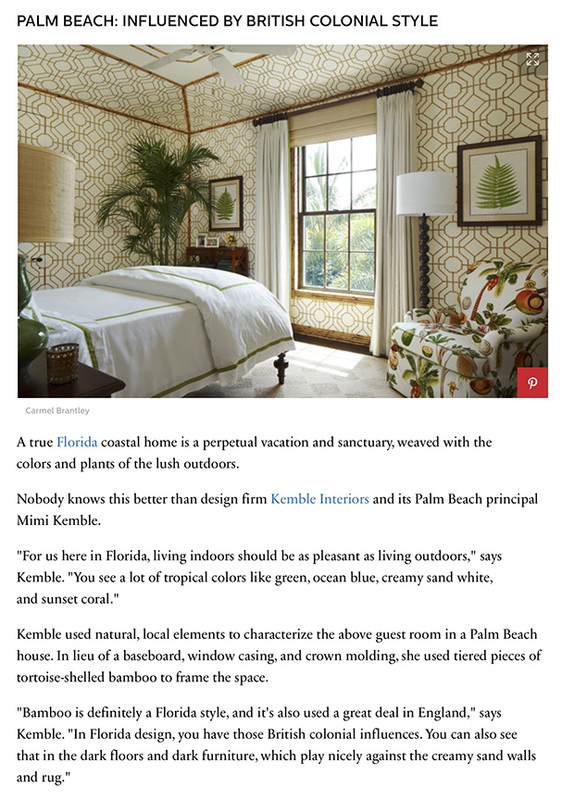 We were excited to be a part of the Elle Decor interior photography article on “What Beach Decor Looks Like in Five Different Coastal Cities.” A big thank you to Mimi McMakin of Kemble Interiors for including our photography of a guest bedroom suite we photographed as her definition of beach decor in Florida. 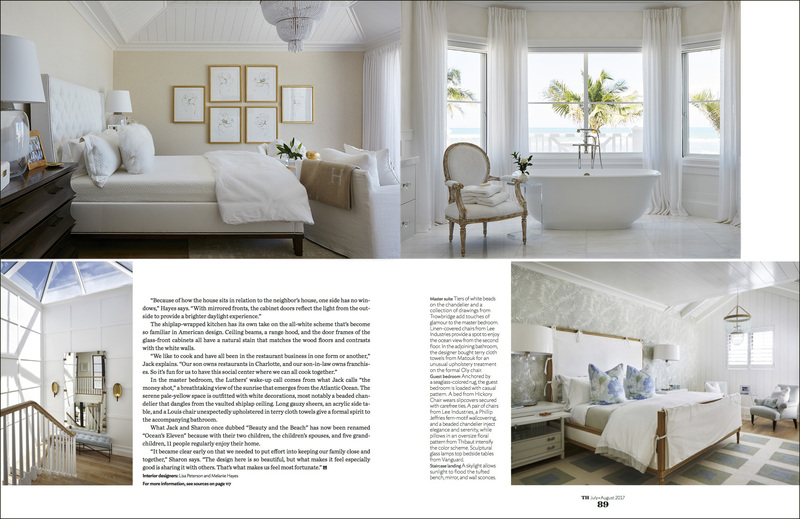 The guest bedroom was part of a residential photography project we photographed for Kemble Interiors. 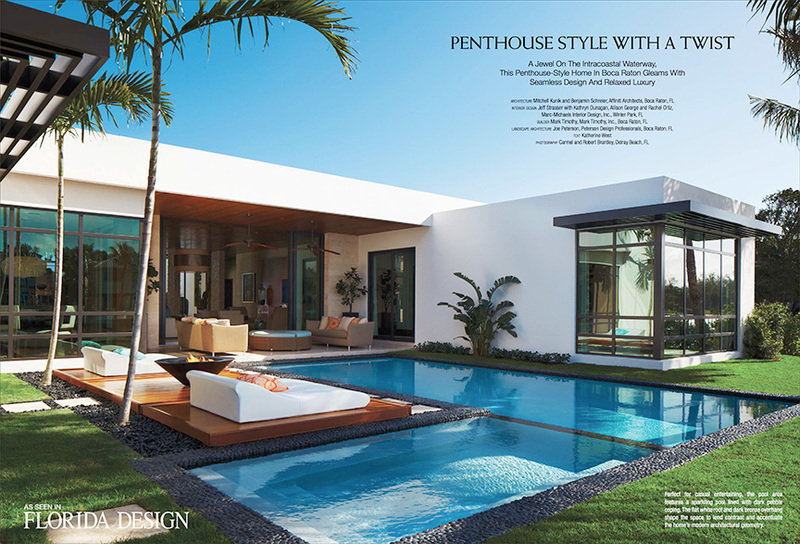 The house, located in Palm Beach, was also featured in Florida Design Magazine. We approach all of our interior design photography projects with the idea that they will be published in magazines, books and on design blogs. 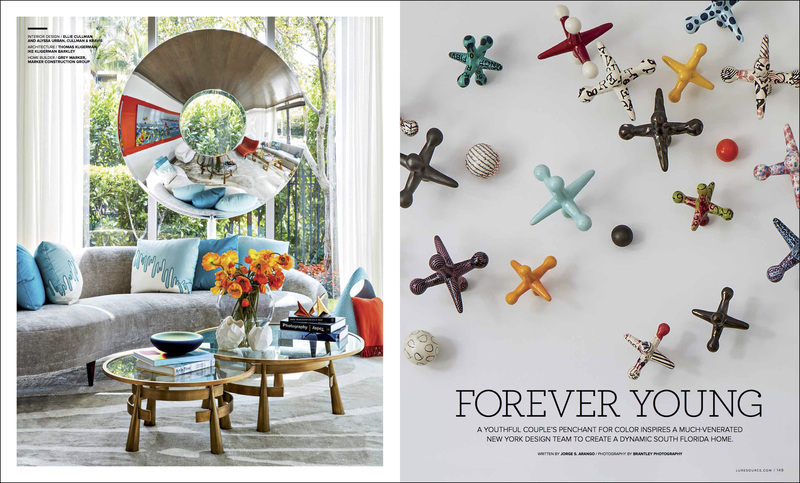 Thrilled to be a part of the Elle Decor feature! 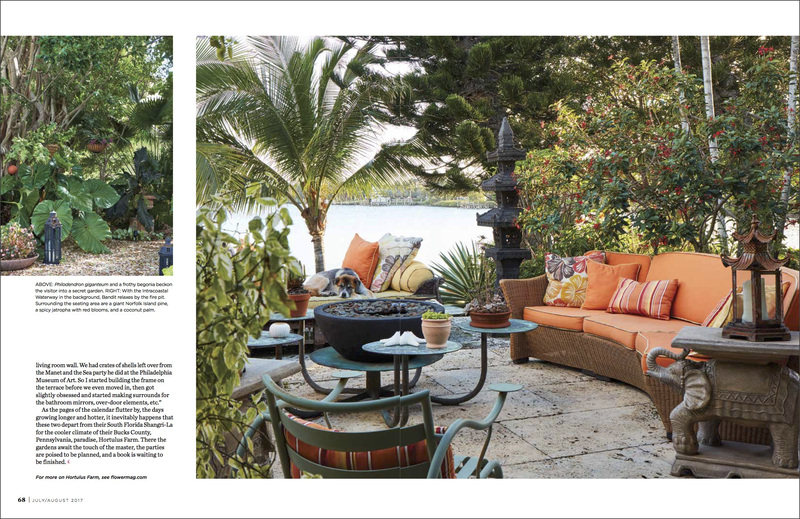 We are excited to have our patio design photography in the July issue of City and Shore Magazine! 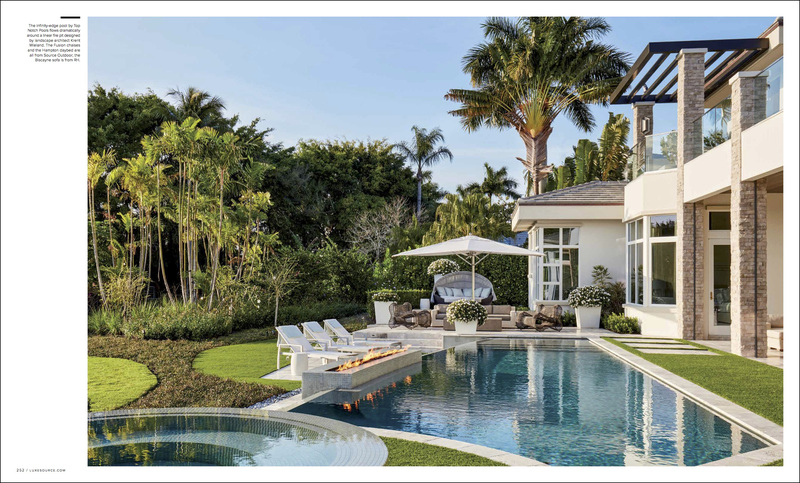 Our dear friend, writer Charlyne Varkonyi Schaub wrote an amazing article on great pool and patio designs in South Florida. 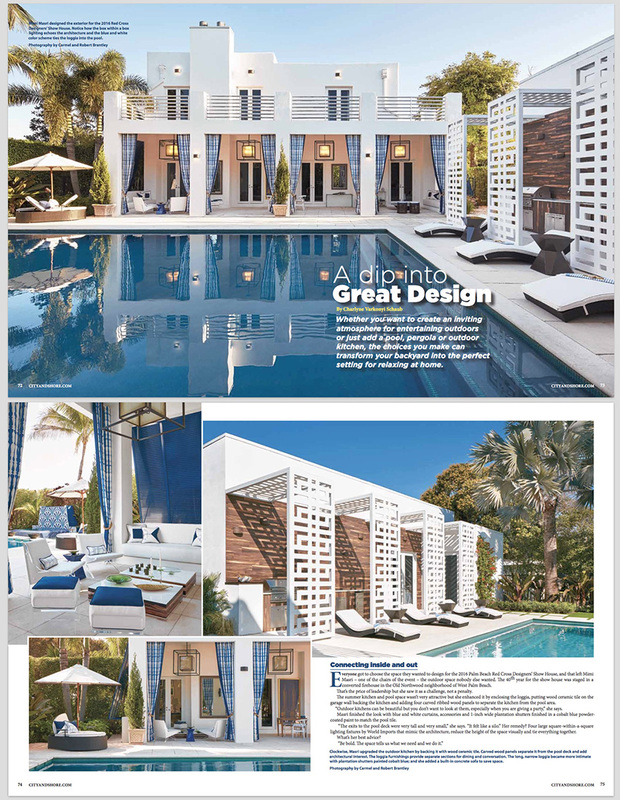 We were thrilled that she featured so prominently our project for Mimi Masri of MM Designs in West Palm Beach. 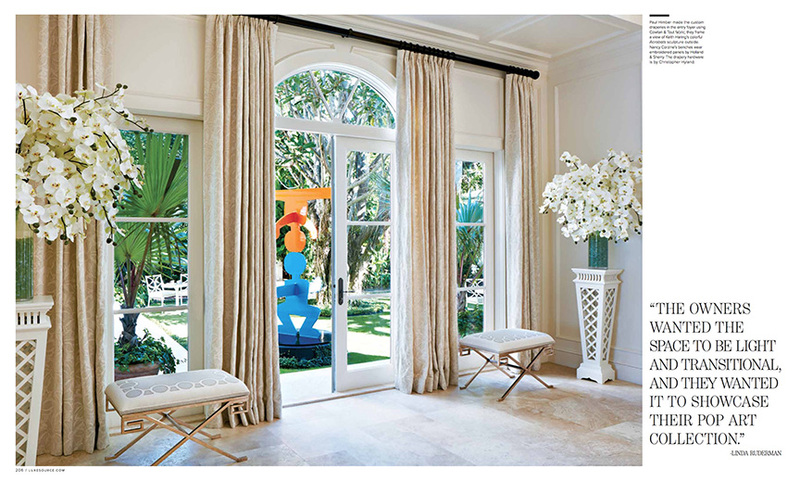 Mimi renovated the pool, patio, loggia and outdoor kitchen of a converted firehouse in Old Northwood for the 2016 Palm Beach Red Cross Show House. 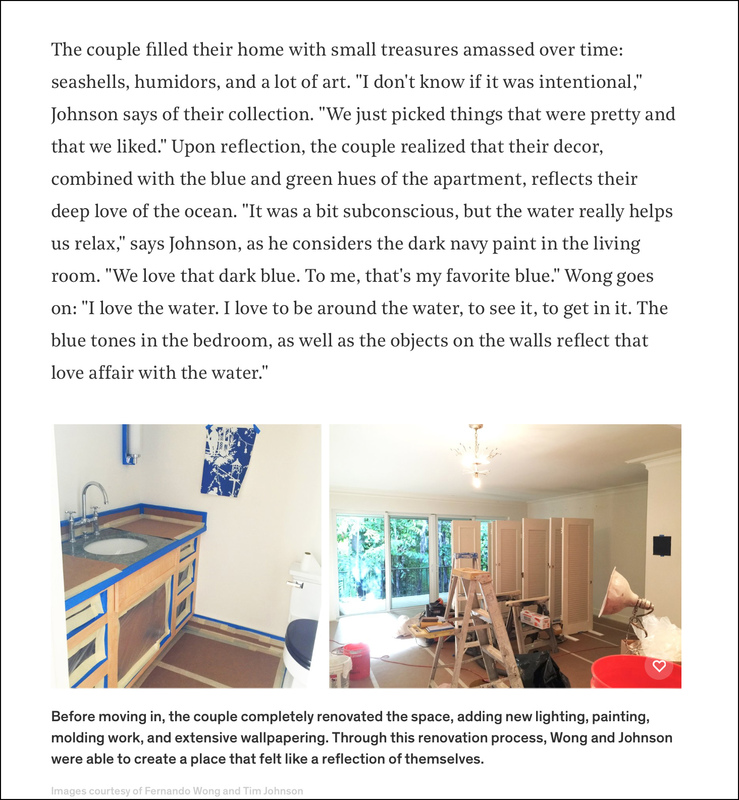 With blue and white curtains, cobalt blue shutters, built-in concrete sofas, and wood ceramic tile, Mimi transformed the space into a stunning area for entertaining and relaxing. 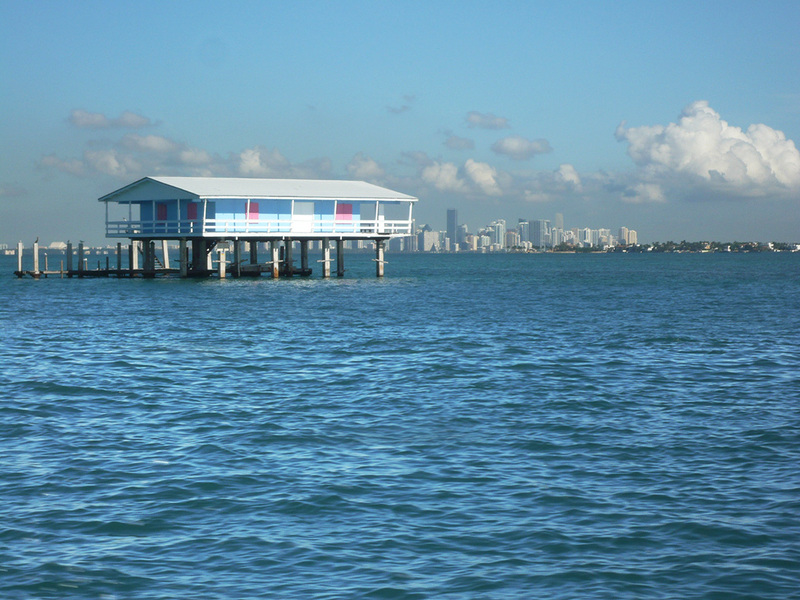 On a recent yacht photoshoot, we couldn’t resist taking some Florida architectural photos of Stiltsville. 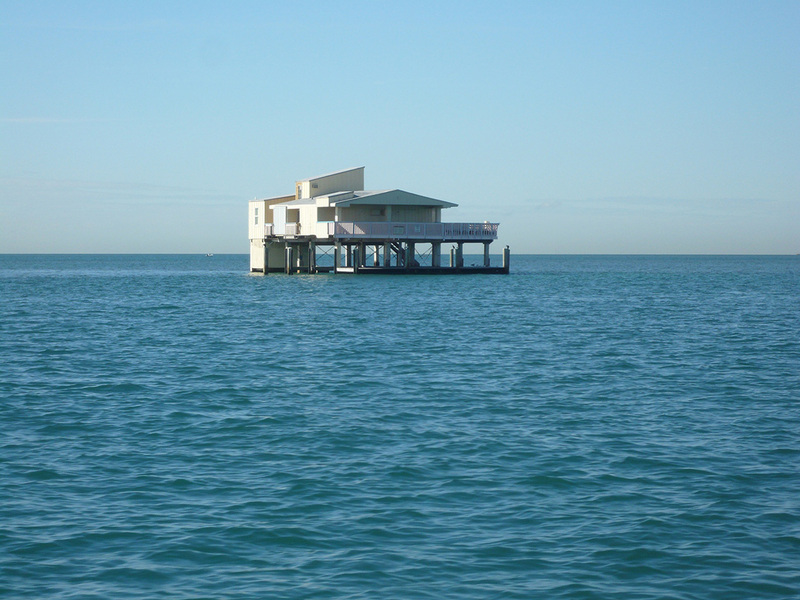 Stiltsville in Miami is an interesting collection of wood stilt houses a mile offshore from the Cape Florida Lighthouse. Dating back to the 1930’s, only seven houses are still standing. 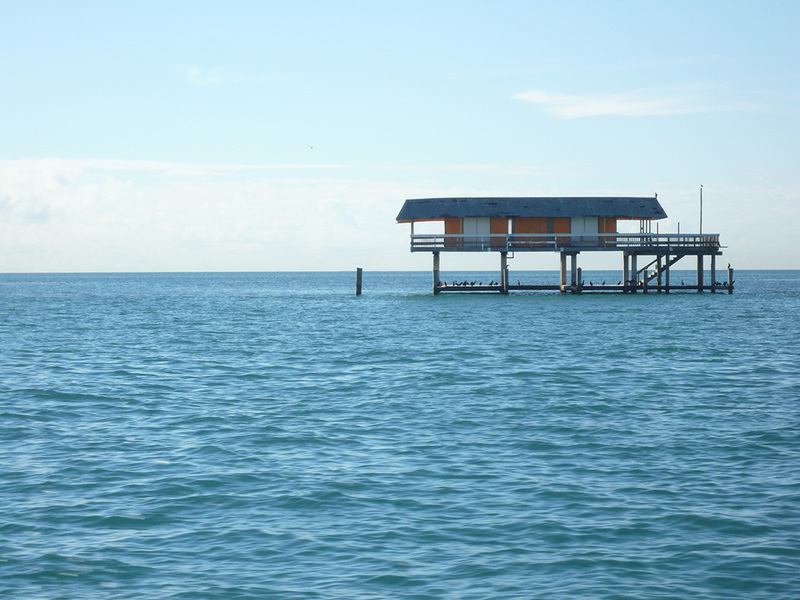 Seeming to float above the beautiful blue waters of Biscayne Bay, Stiltsville Florida has a colorful history that started with “Crawfish Eddie Walker” and the first shack built on stilts. 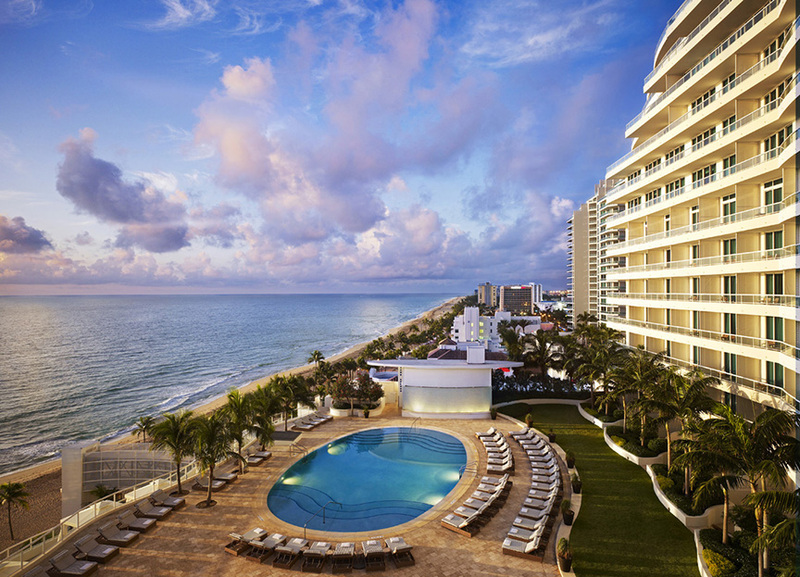 Accessible only by water, the area was the place to see and be seen when visiting the Miami Beach resorts. Stories of illegal alcohol and gambling led to police raids. At its peak in 1960, there 27 structures. Hurricanes and the ravages of nature made the buildings relatively short-lived. 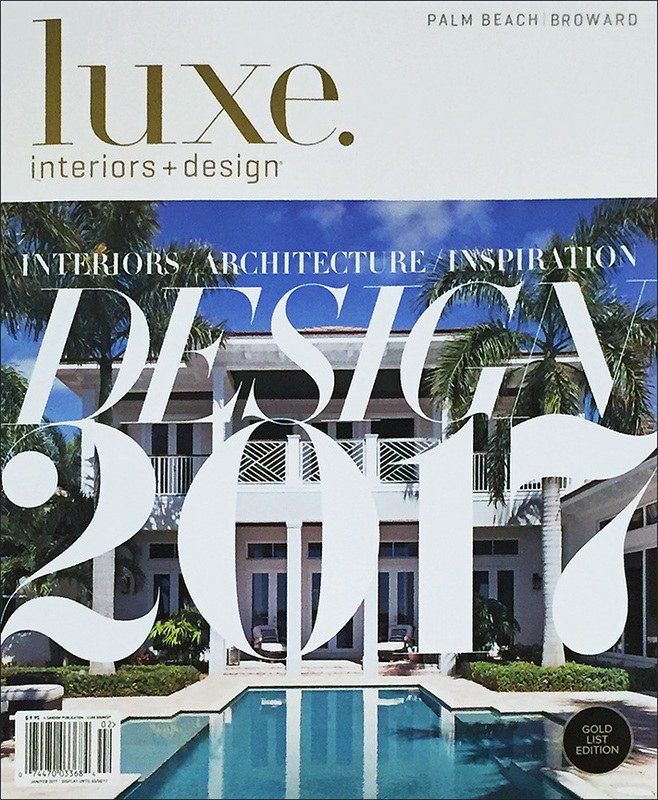 We are thrilled and excited to have our project for Linda Ruderman Interior Design featured on the cover of the new issue of Luxe Magazine! 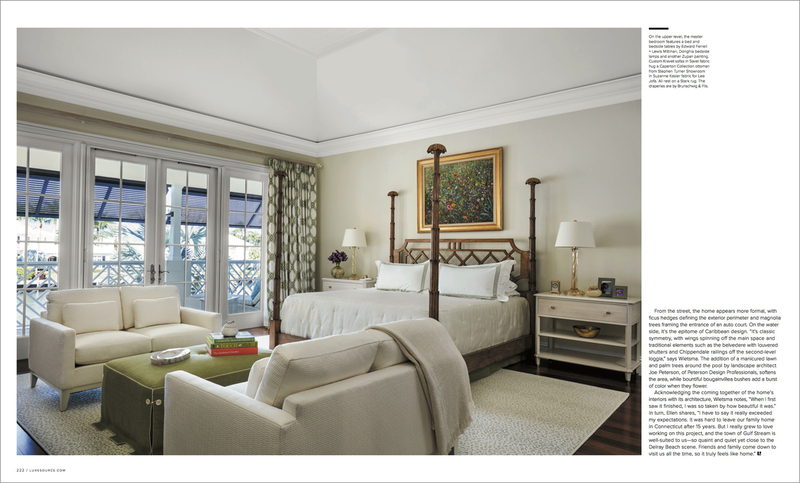 Linda contacted us earlier this year about photography a recently completed Palm Beach project. 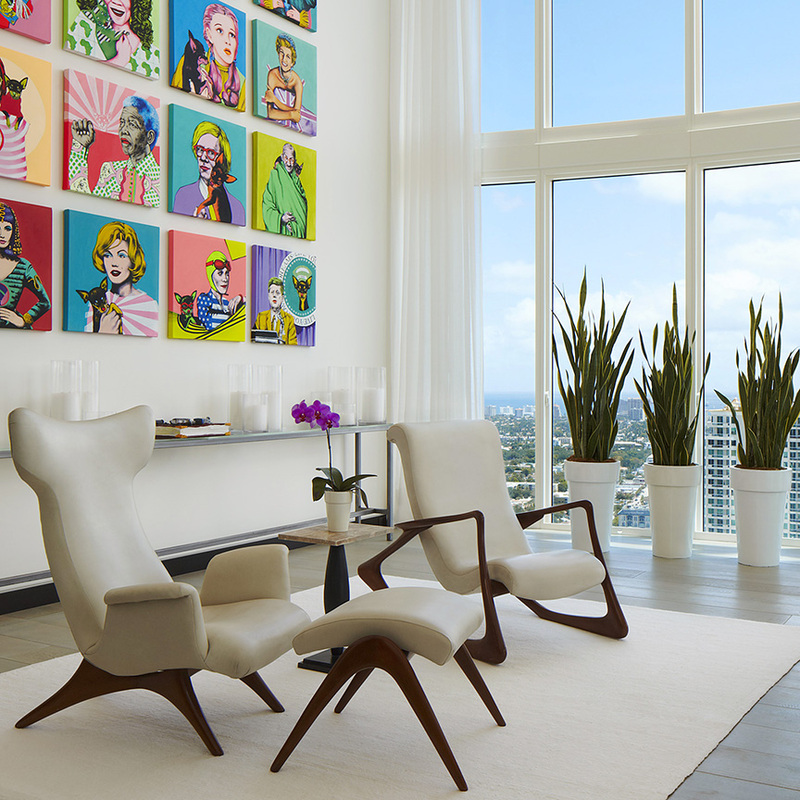 The waterfront home has an amazing collection of pop art. 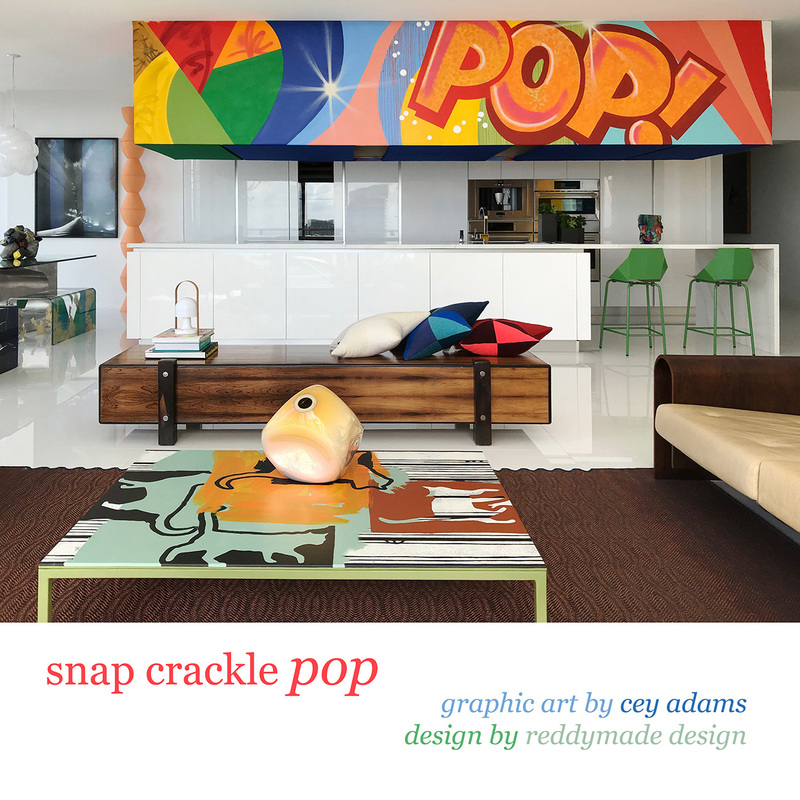 Artwork by Tom Wasselmann, Andy Warhol, Annish Kapoor, Robert Indiana, and Keith Haring enhance the interiors and exteriors. 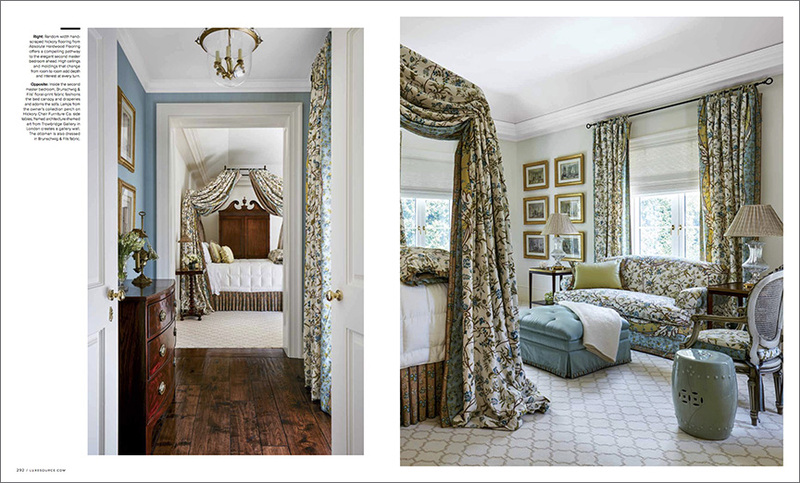 This stately house boasts high ceilings, exquisite fabrics, and classic paneling. The three day shoot allowed us plenty of time to be creative in our shot selection. This was our second project working with Linda so we had a good understanding of how to best capture her designs. 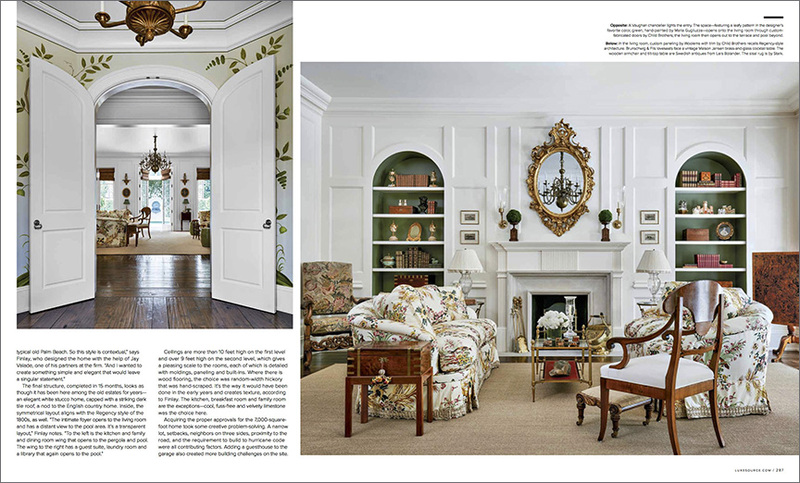 Linda asked me to submit the project to Luxe Magazine which led to this stunning 18-page spread in the current issue! Also working on the design of this project were, Smith Architectural, Tim Givens Building and Nieveera Williams Landscape Design. 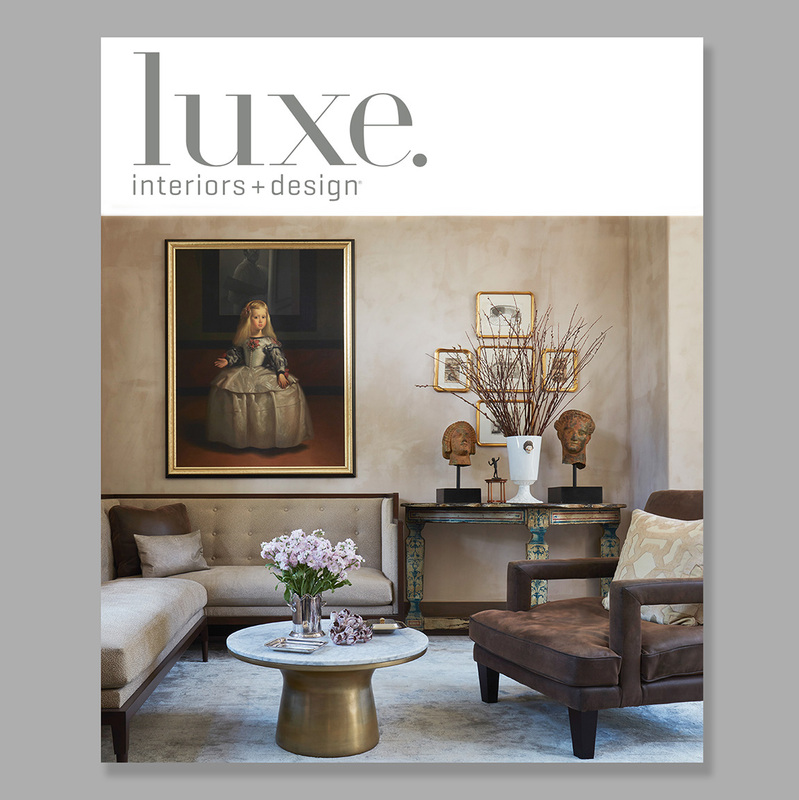 We are grateful to the Luxe Magazine team for this architectural photography magazine cover. 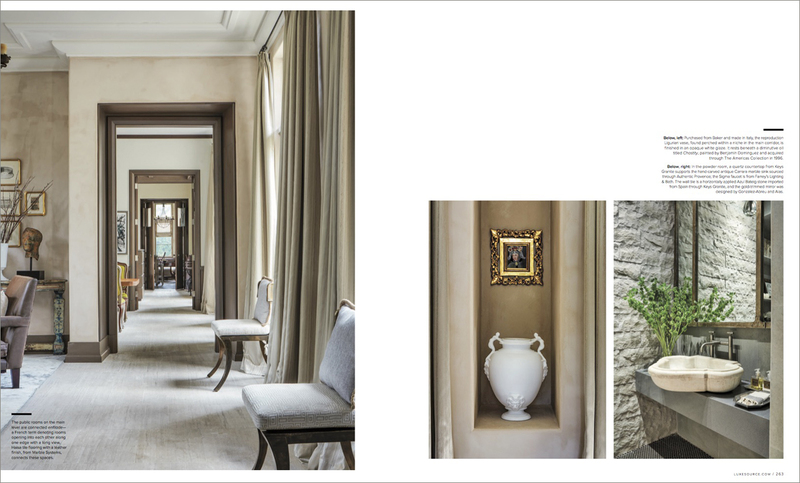 We hope you enjoy our architectural photography project in Luxe! 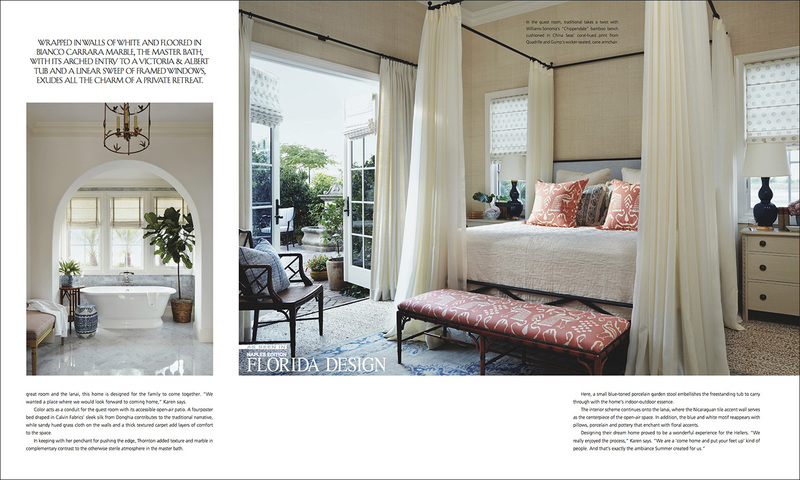 We are thrilled that the summer issue of Florida Design Magazine features an interior design photography project we recently photographed. 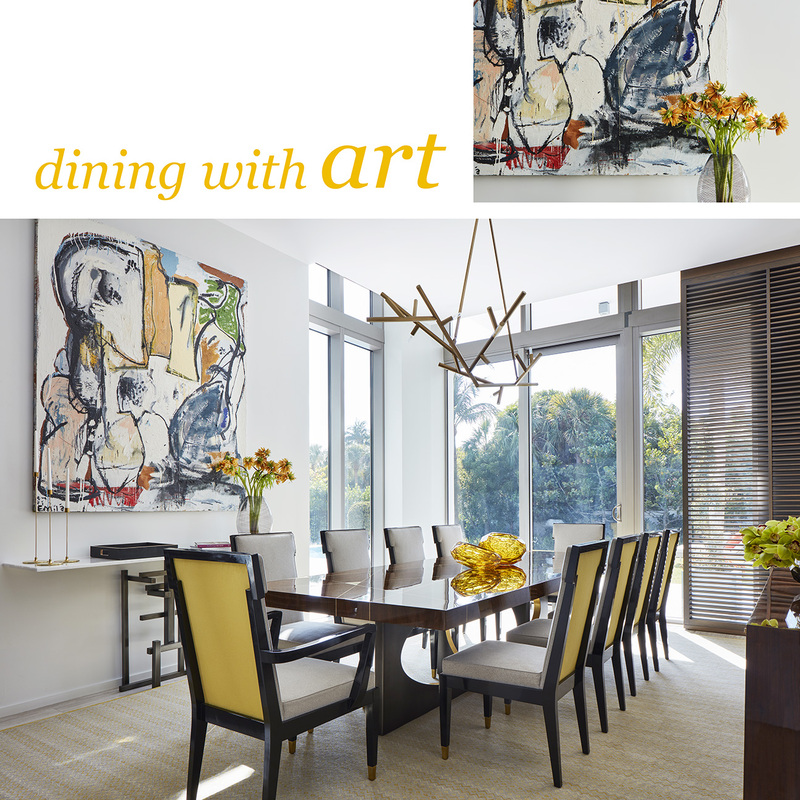 A Palm Beach apartment, designed by our long-time clients, Kukes Simons Interiors, is filled with modern art from the homeowners’ private stash. The art collection includes photography, sculpture and paintings. Girl, a limited edition white doll statue by Chinese artist Zhang Hui, poses on a glass-topped acrylic cocktail table in the living room. 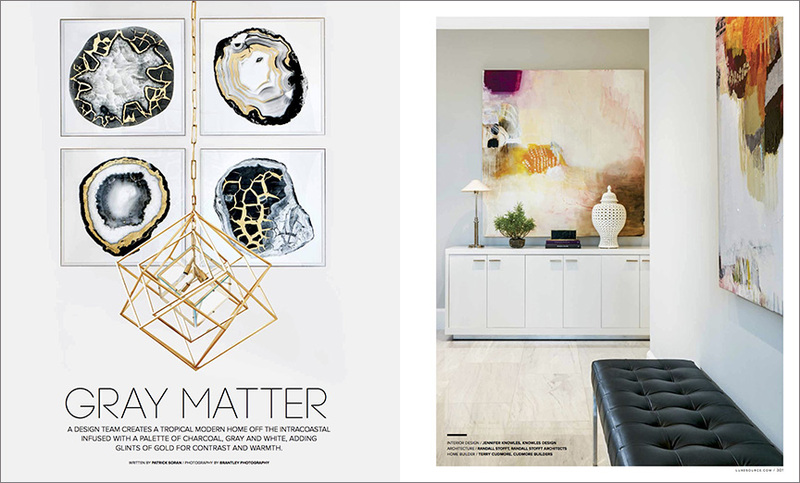 In the hallway, Fracture, a textural shadowbox oil on plexiglass by artist Craig Allen accents a long lucite console table. 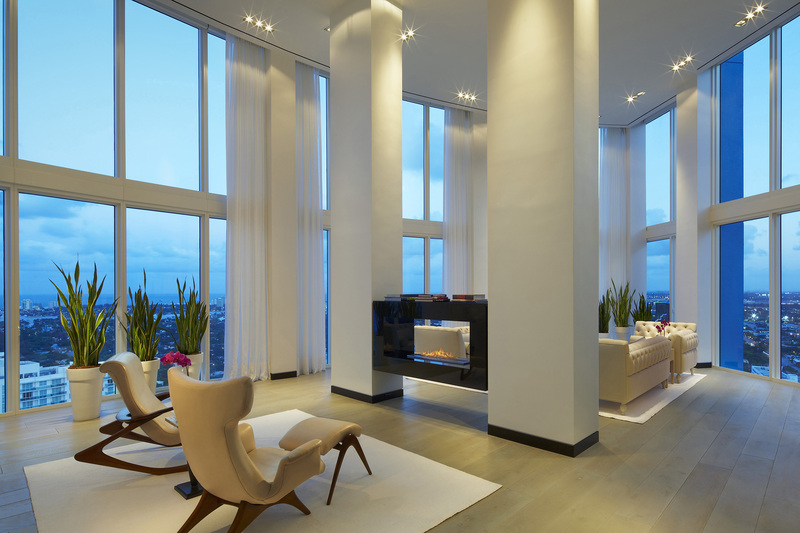 The 4200-square-foot apartment has beautiful panoramic views of the ocean. 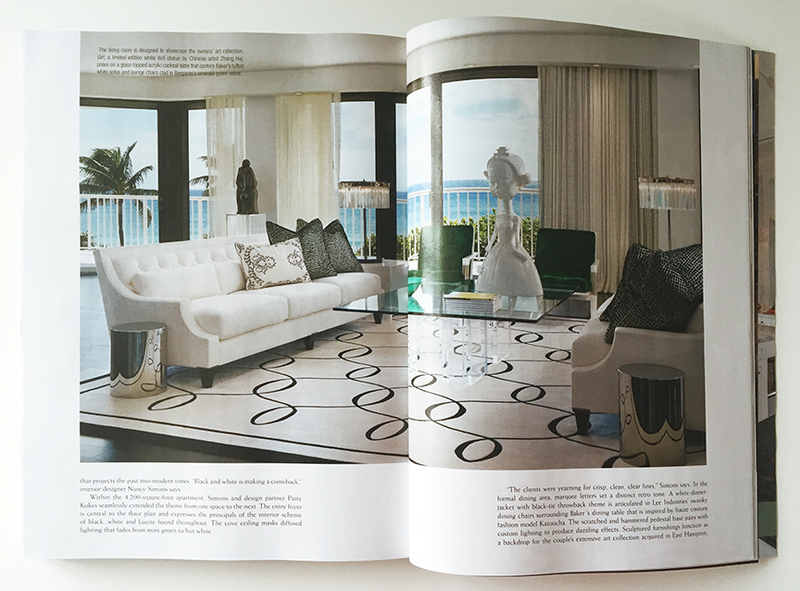 The contemporary interiors are predominately black and white, with emerald green accents and Lucite throughout. At this time of year in Florida architecture photography means long, hot and humid days. When working on residential projects, we often find ourselves starting in the morning shooting any east facing exteriors. We will then move inside and shoot interiors, occasionally running outside with a camera for perhaps a mid-day pool shot. West facing exteriors are shot in the afternoon. Preparation for the dusk shots begins around 6:30 or 7:00 pm. We often set up two cameras in different locations to make the most of the sunset light. If we are lucky, the sky will give us some pink color in the clouds. And if we are really lucky, it won’t rain! 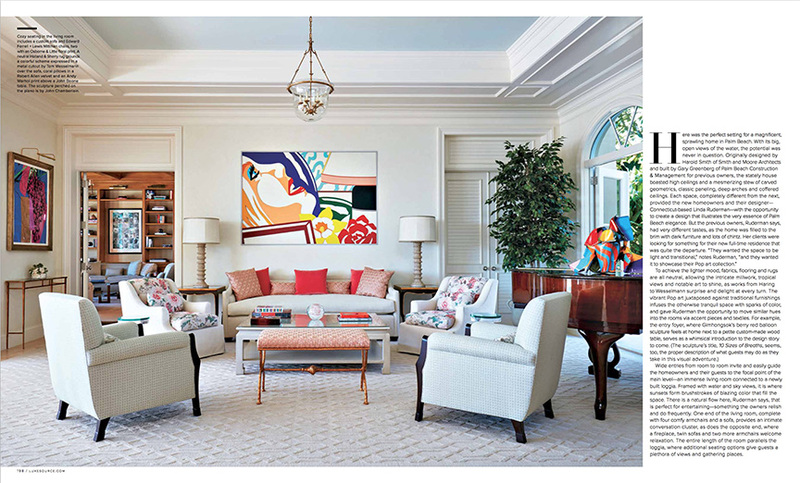 Living room detail of Lilly Pulitzer’s home featured in Vanity Fair. 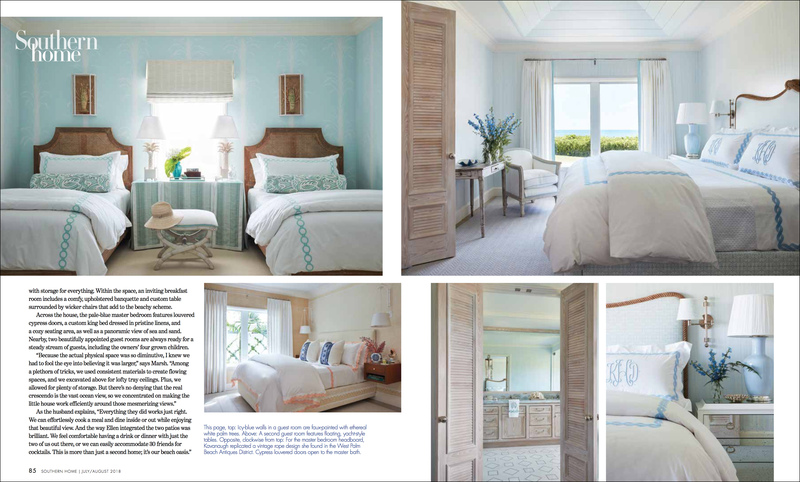 One of our past editorial assignments sent us to the Palm Beach home of the one and only Lilly Pulitzer. 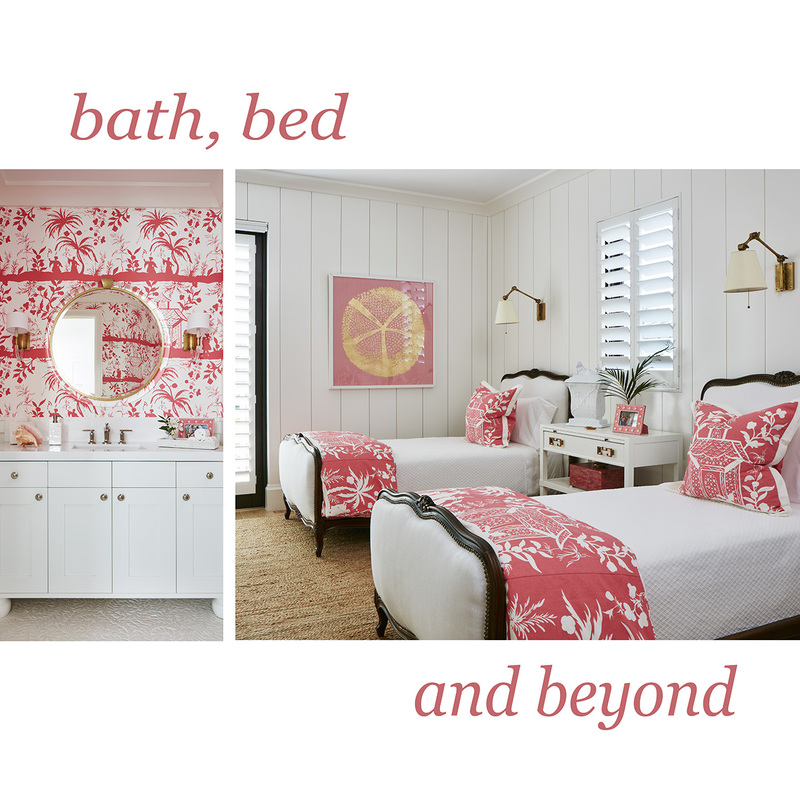 Photographing Lilly Pulitzer house in Palm Beach was a wonderful opportunity. Lilly was delightful and charming! She greeted us at the door and gave us full run of the house. Each room had a story, which Lilly was more than willing to share. 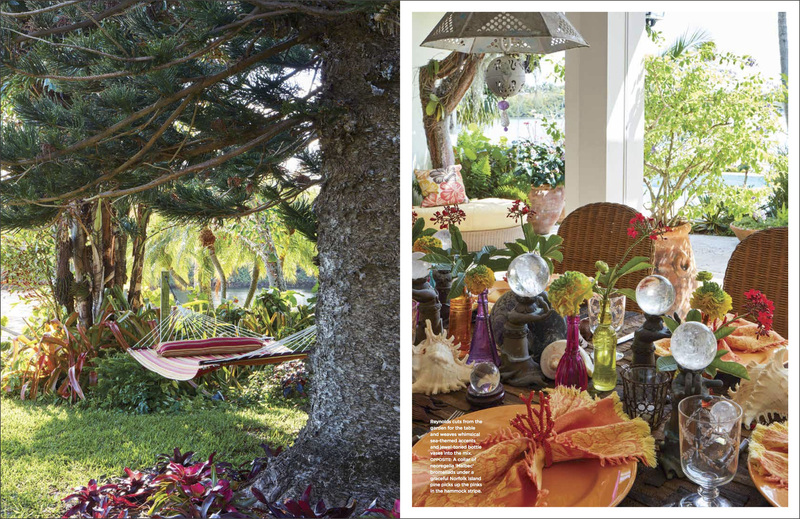 The property was surrounding by lush, tropical Florida gardens. When we were ready to break for lunch, Lilly insisted that she make us lunch saying, “You won’t get a better meal in all of Palm Beach!” She was right! Dining at her small kitchen table, we enjoyed homemade liver wurst sandwiches, although I must admit liver wurst is not a favorite of mine. 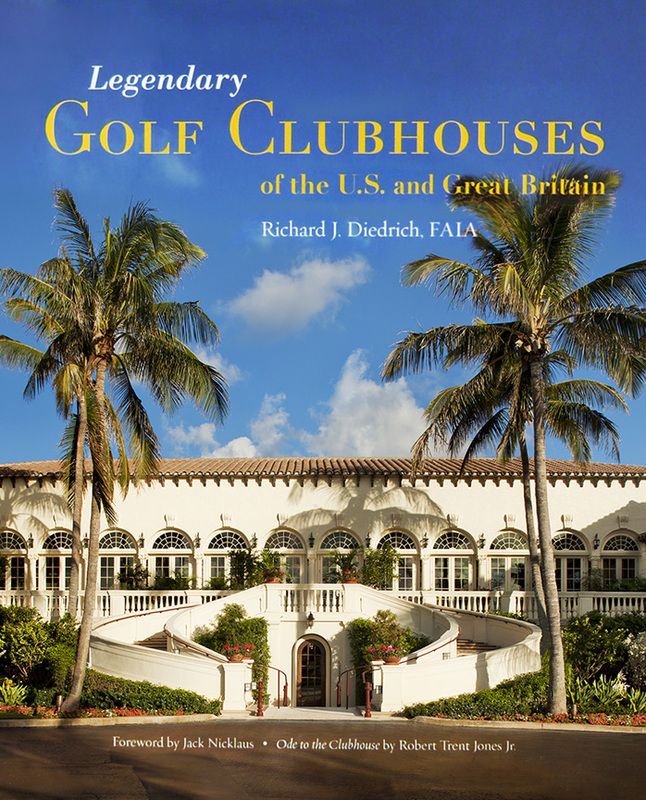 Lilly entertained us with colorful and captivating stories of old Palm Beach. At the end of a long day of shooting, Lilly stood in her doorway and waved goodbye saying “Come and visit anytime, my door is always open.” That was Lilly. Traveling architectural photographer style is always a welcome adventure. Many of our clients have projects outside of Florida that they have us photograph. Whether we are traveling to the Caribbean, to New York or to LA, it takes a great deal of preparation. We prefer to bring our own equipment rather than rent in the city in which we are shooting. We research equipment rental options and photographic equipment stores in the city prior to the shoot in case we need extra gear or the equipment is damaged or delayed. On average, we travel with 8-10 bags. Cameras, computers, lights, stands, scrims, and tripods are all part of our travel gear. 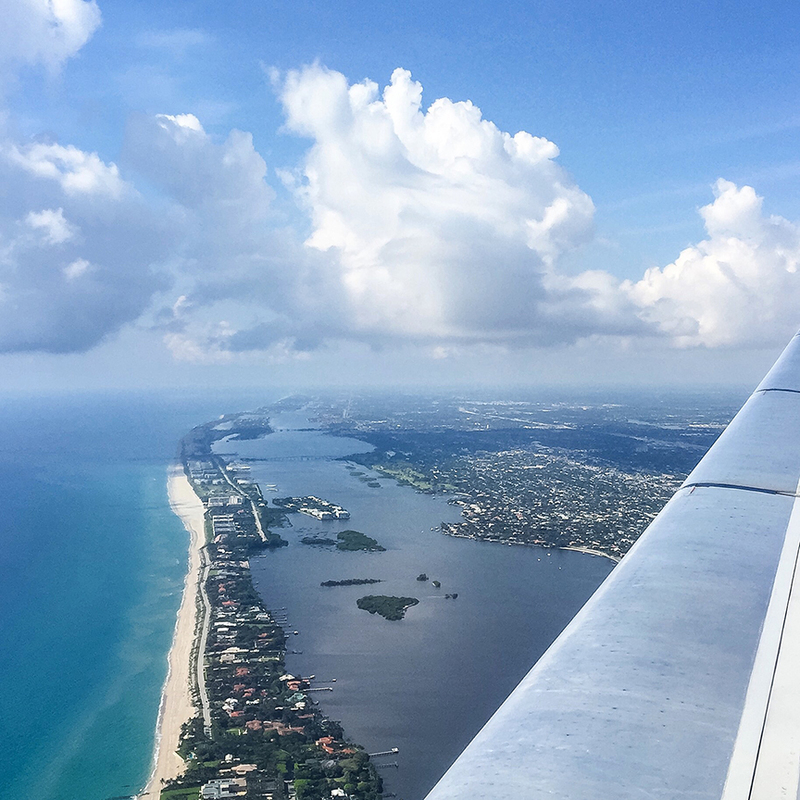 Traveling to photo shoots is an adventure – one that we always welcome! 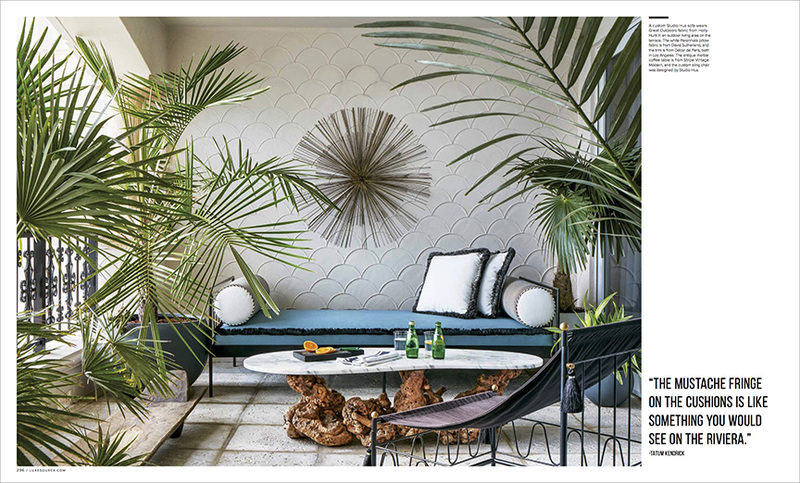 Enjoyed viewing all of the exciting Miami interior design products at the 2016 Maison & Objet this past week. 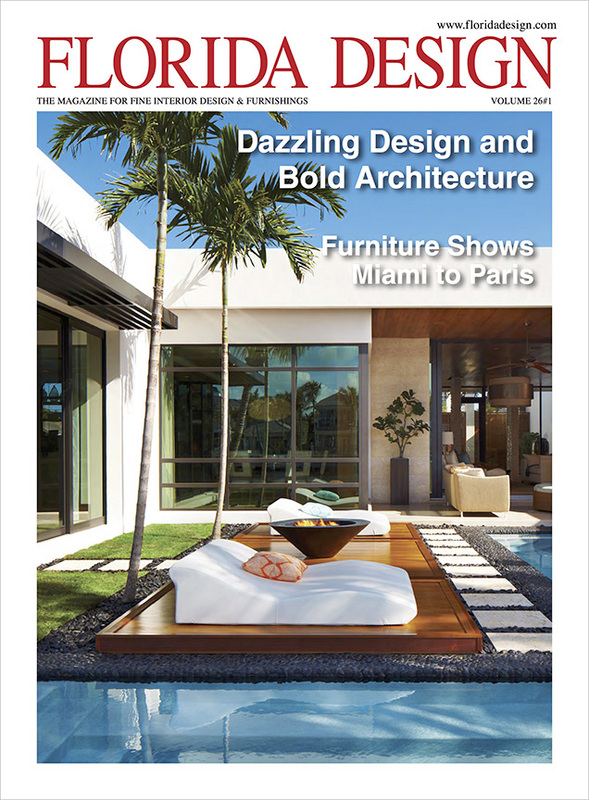 Held at the Miami Convention Center, it was the second year Maison Objet showcased in Miami. Also had the opportunity to sit in on two lectures by our clients, Frank deBiasi and Carrier and Company. 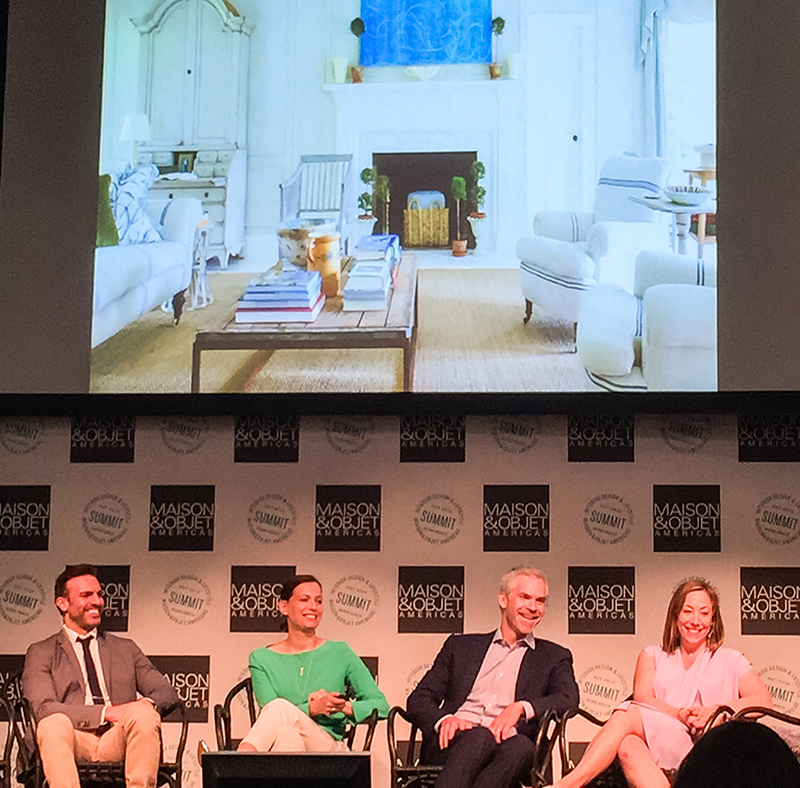 The Carrier and Company lecture focused on interior design and fashion. 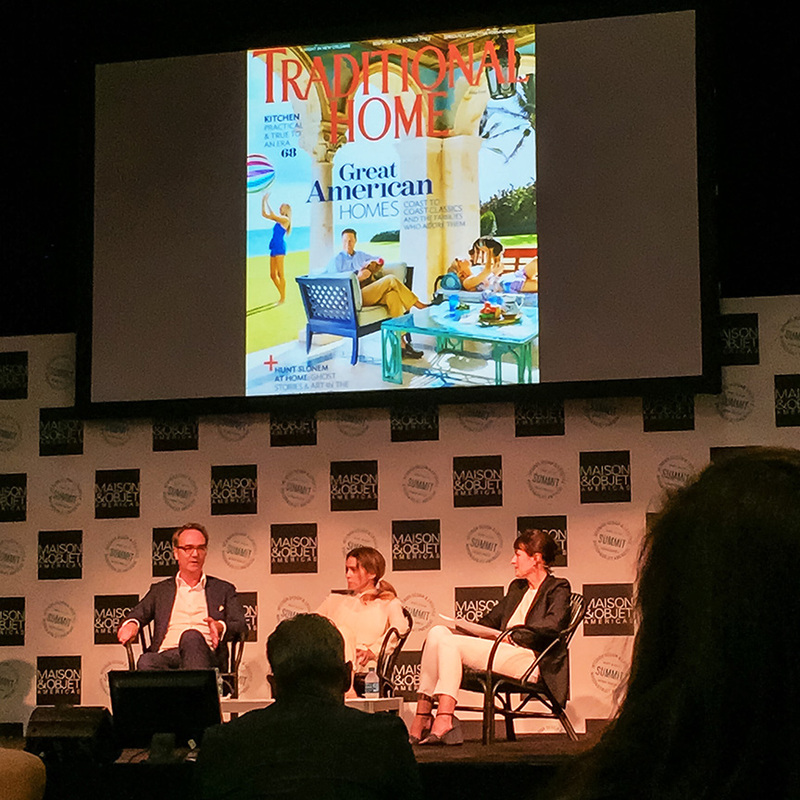 The Frank deBiasi lecture topic was an interesting conversation on the crossover between residential and hospitality design. Even though I am not an interior designer, I found it very enlightening as we do photograph both residential and hospitality projects. Especially exciting was seeing our Traditional Home cover that featured Frank’s Palm Beach project flashing on the big screen! Check out our Brantley Architectural Photography Instagram page. We do our best to keep up with social media such as Facebook, Twitter and Linkedin, but lately our favorite go-to outlet has been Instagram. We post a little of everything from behind-the-scenes shots, to throw-back images, to current work. Most of the photos have something to do with architecture and interior design but some have nothing to do with architecture and interior design like the ocean shot above. It was a gorgeous Florida day and I could not resist wading out into the ocean and snapping a pic with my handy Canon SX700 camera and posting to Instagram. 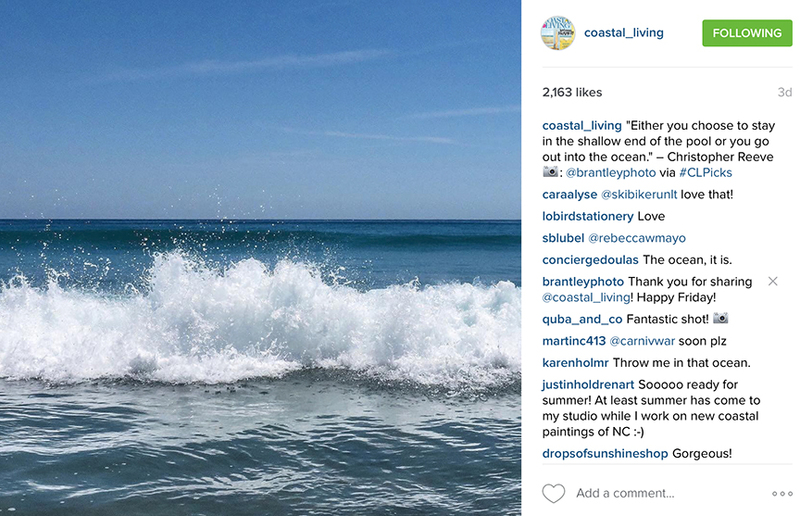 I was thrilled when Coastal Living shared the image not only on Instagram, but Twitter and Facebook as well! They paired the photo with the perfect inspirational quote by Christopher Reeve. The power of the internet allowed my photo of the ocean to be shared with 2,163 people and counting! To follow us on Instagram, click here. 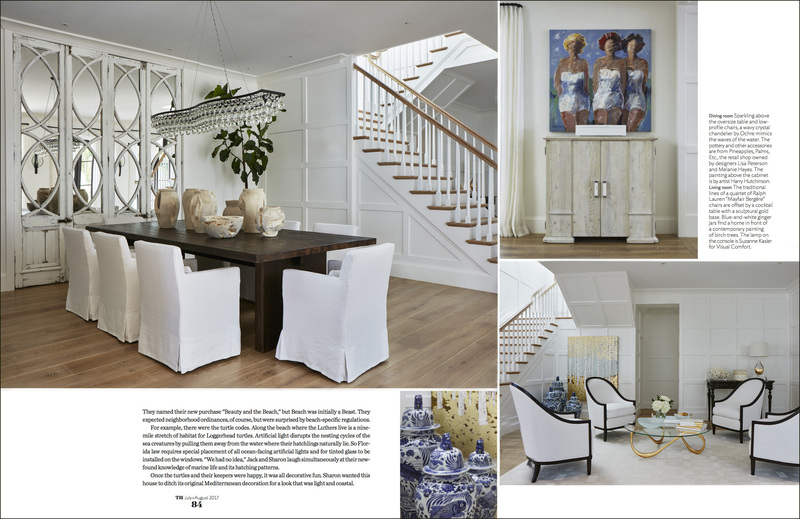 We are fortunate to once again have our interior photography published in Luxe Magazine! 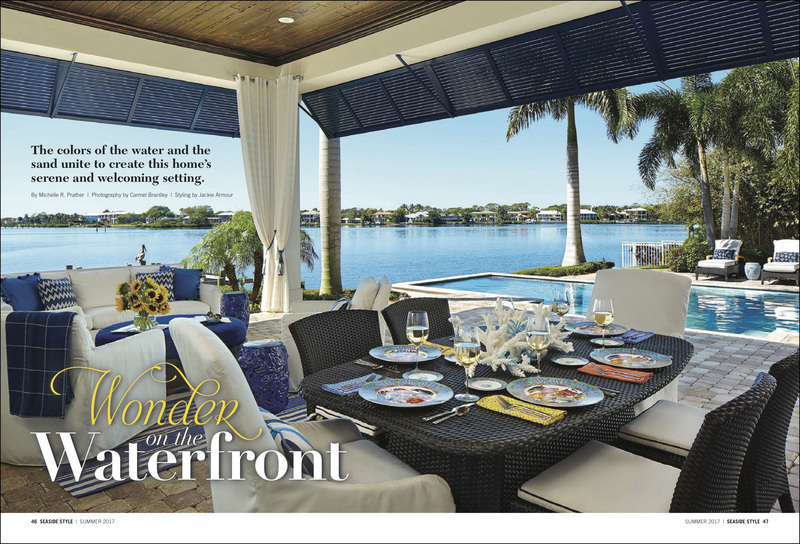 The May/June Palm Beach/Broward issue features a water-front vacation home in Tequesta. 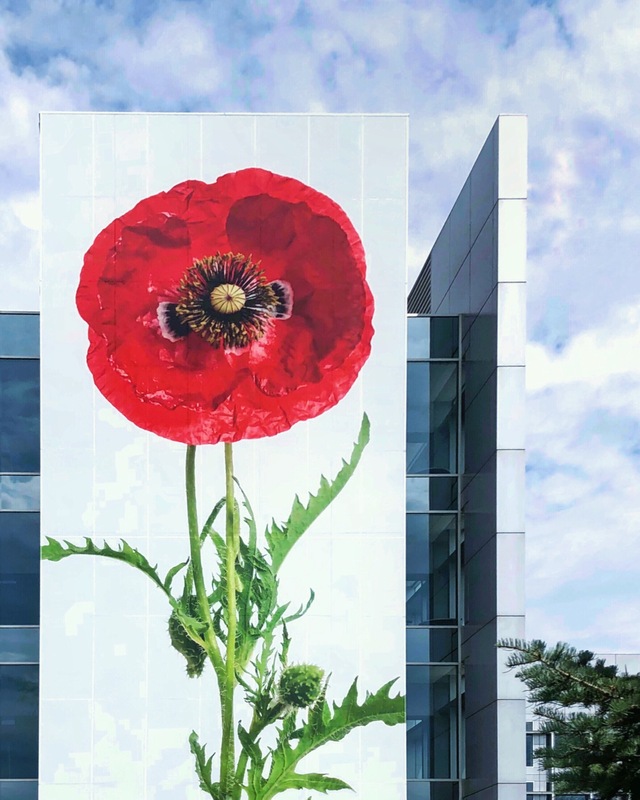 The project team included Jackie Armour of JMA Interiors, architect Dennis Rainho, Dan Reedy of OnShore Construction, and John Walsh, JDLA Landscape Architecture. 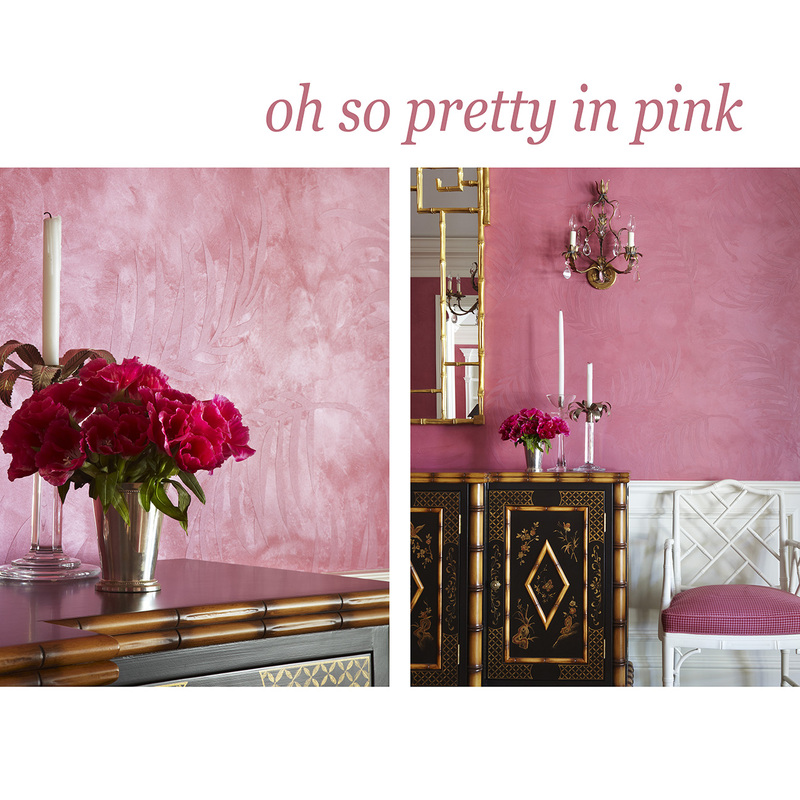 We worked closely with Jackie to prep and style the rooms. Always fun to collaborate with our talented clients! 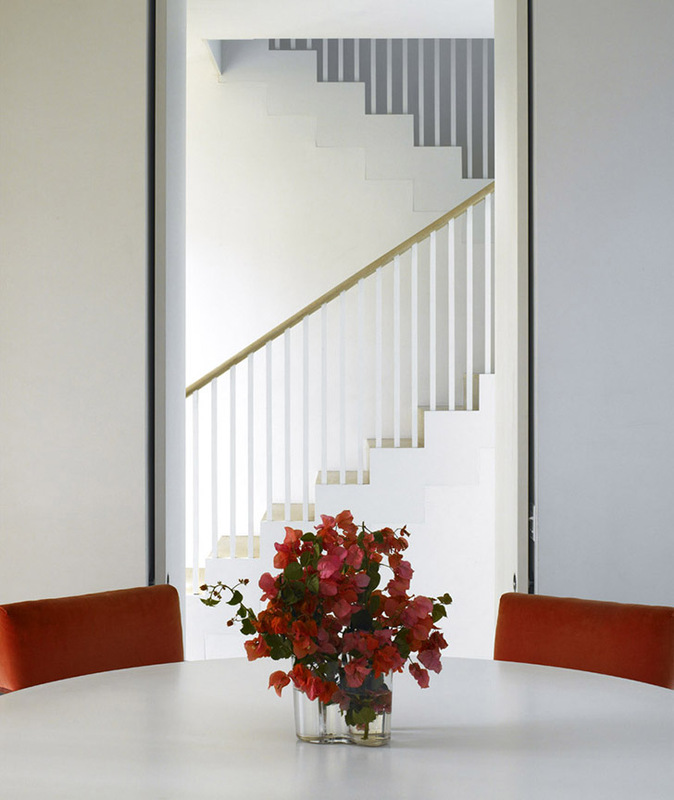 Our goal in photographing the house was to maintain the open, casual feeling throughout the rooms. 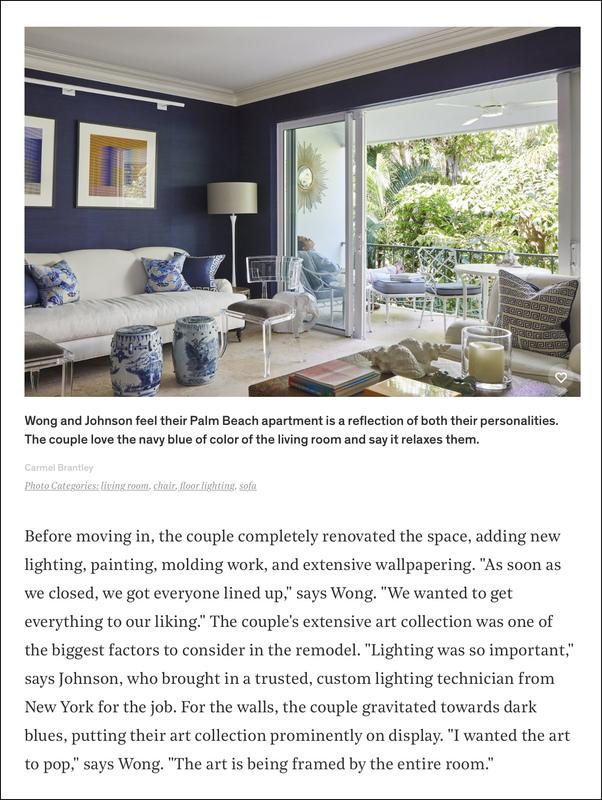 We wanted to enhance the beach feeling that Jackie created by keeping our lighting soft and to a minimum. 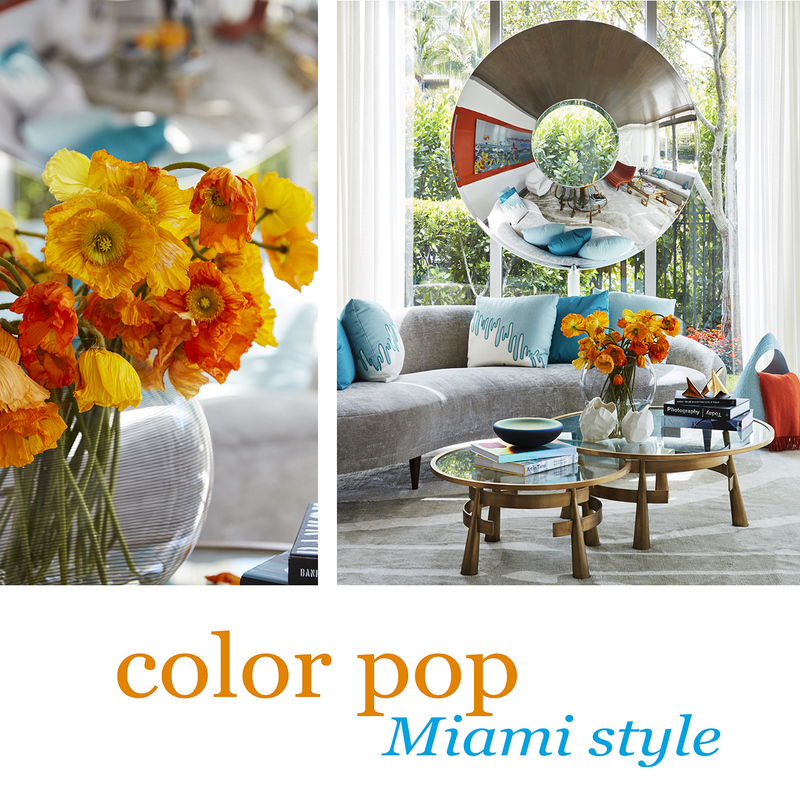 And, at the same time, we wanted the splashes of color to really “pop” and grab the viewer. 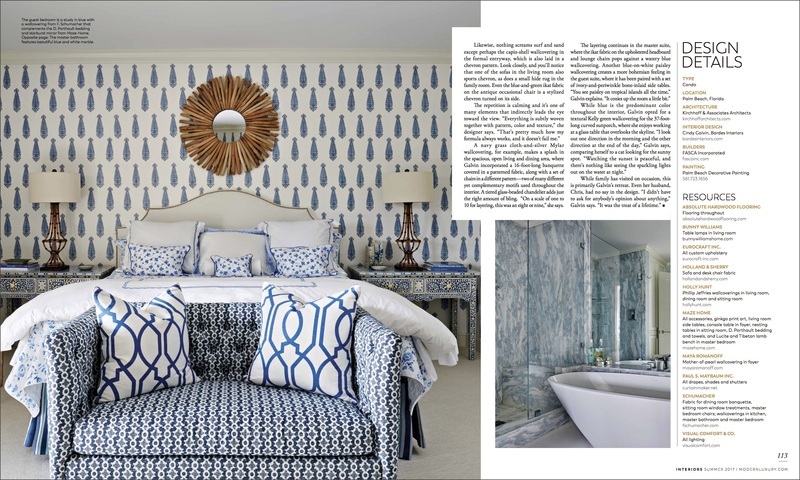 Be sure to check out this beautiful 16-page spread, written by Kimberly Olson, in the latest issue of Luxe! At Brantley Architectural Photography, we’ve got you covered! 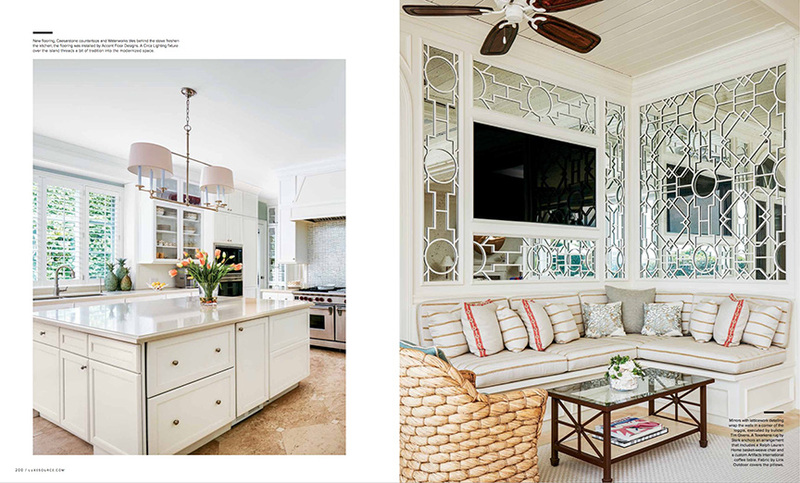 The latest from Snapshots, the Brantley Architectural Photography newsletter, features four of our magazine covers currently on the news stand – Florida Design, Seaside Style, Traditional Home and Luxe. While we have been very fortunate over the years to have our photography grace the covers of many national and local publications, this is the first time we have had four at once. We are forever grateful for our talented clients for giving us such amazing projects to photograph. And very thankful for the many editors, writers, and art directors who support our work. 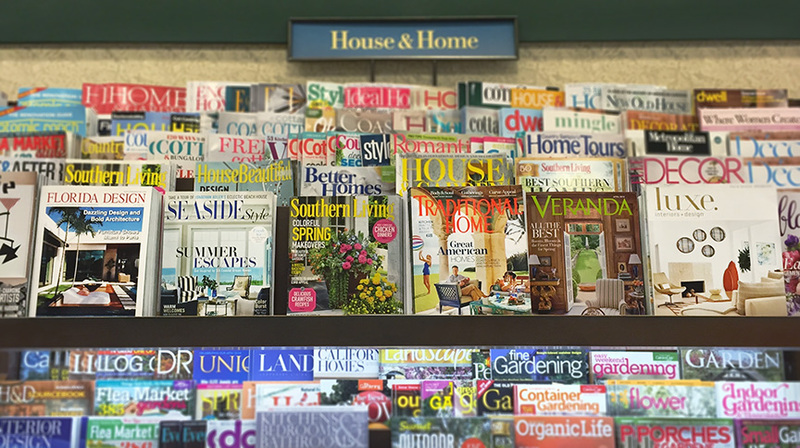 I have to admit it was fun strolling through the magazine section at Barnes and Noble! 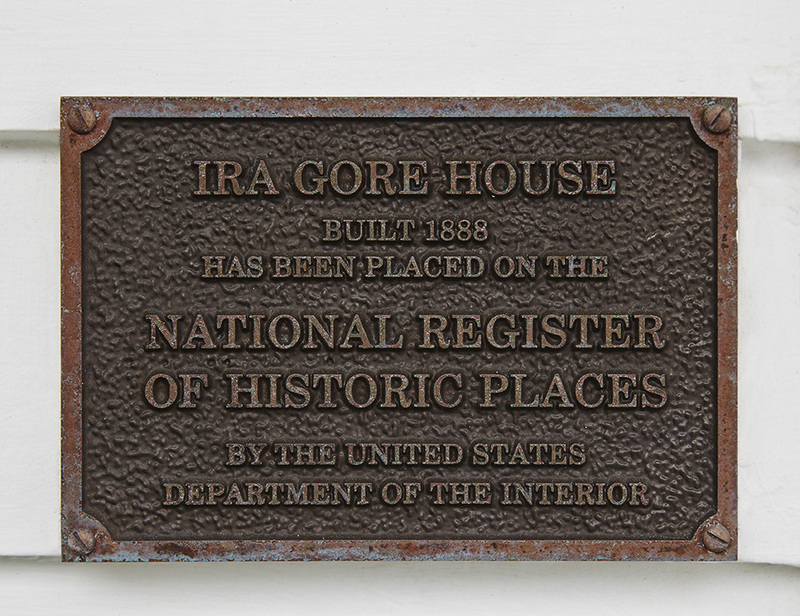 Working in the Florida architectural photography profession, we often have the opportunity to shoot historic homes. 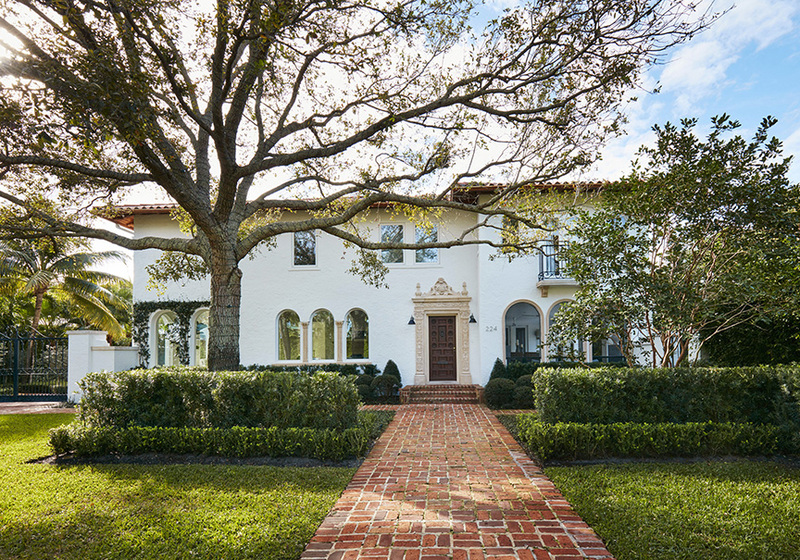 This 1930’s gem is located in West Palm Beach. A recent renovation brought the house up-to-date for a young family of four. We spent the day shooting various angles on the exterior as well as the interiors. It is always interesting to photograph an old estate that has been fully renovated to accommodate the needs of today’s modern family. Here is a sneak peek of this fabulous house. 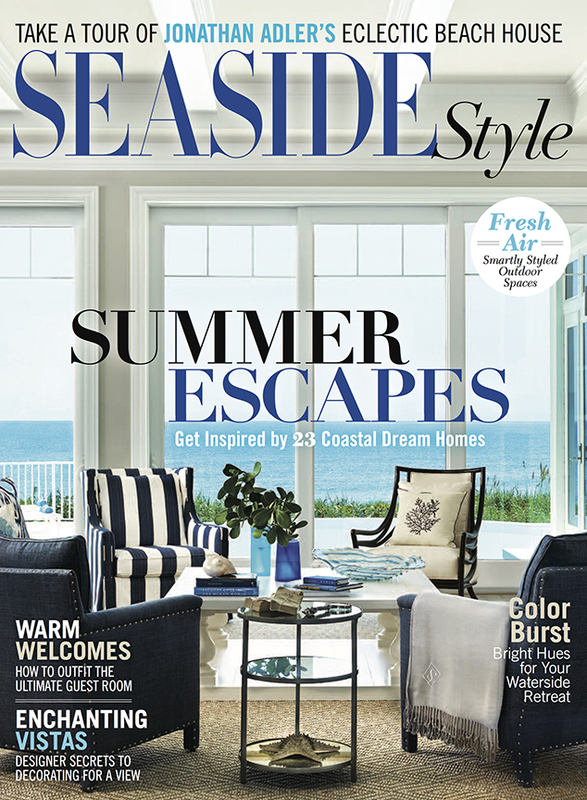 We are extremely excited to have our seaside style architecture photography featured on the cover of the Summer 2016 issue of Seaside Style! 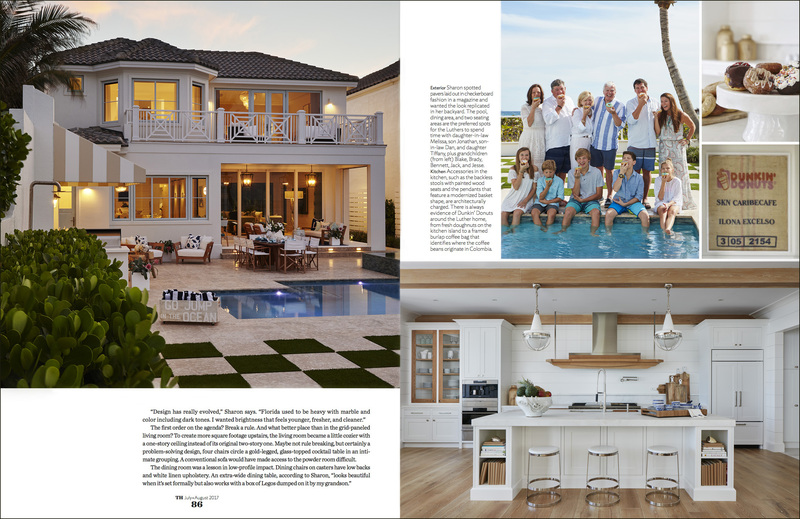 Many thanks to Seaside Style Magazine, interior designer, Jackie Armour, JMA Interiors, Stofft Architects, and Phoenix Builders, for giving us such an amazing project to photograph. 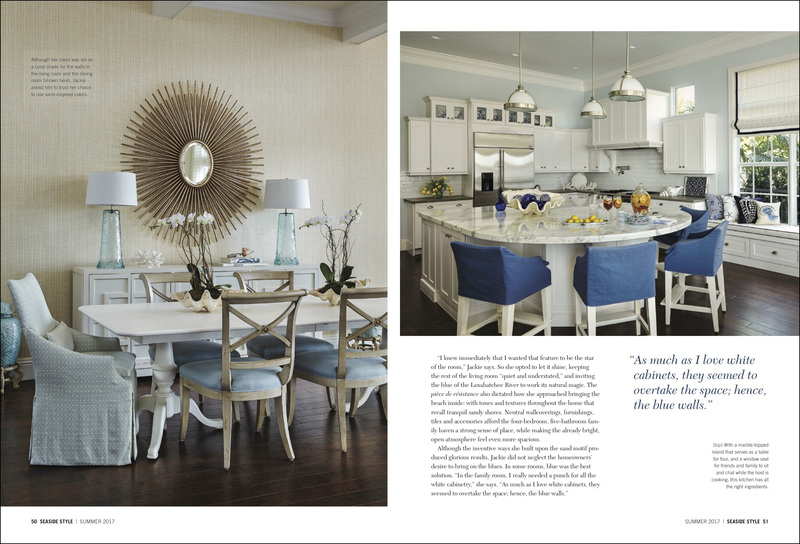 The 8-page spread highlights the coastal, casual feel of the house. The sea and sky color palette of the interiors balances nicely with the outdoor living spaces. 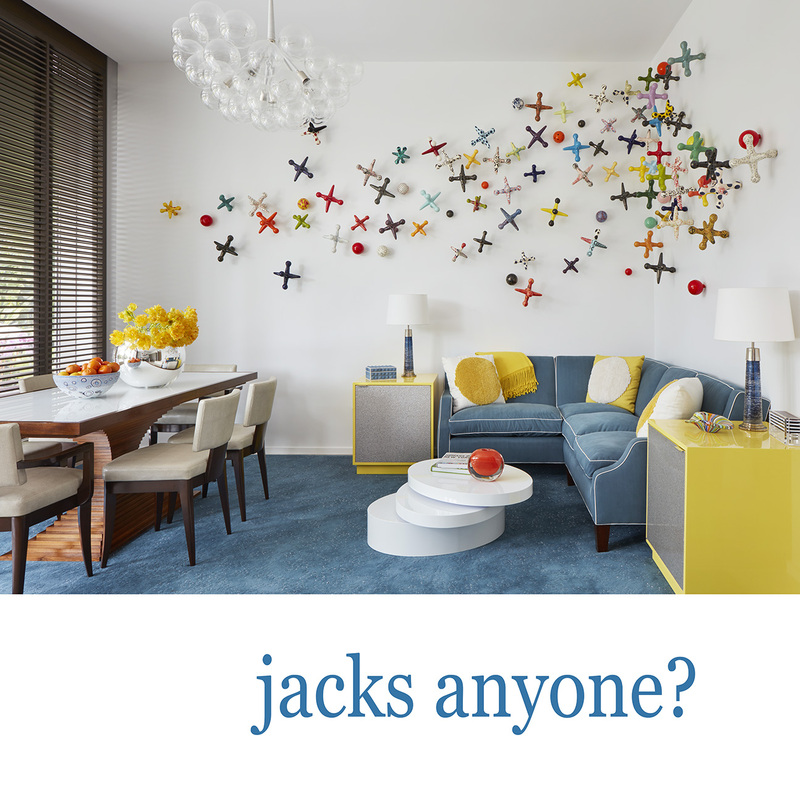 Jackie combined multiple shades of blue to keep the visual interest throughout the house. 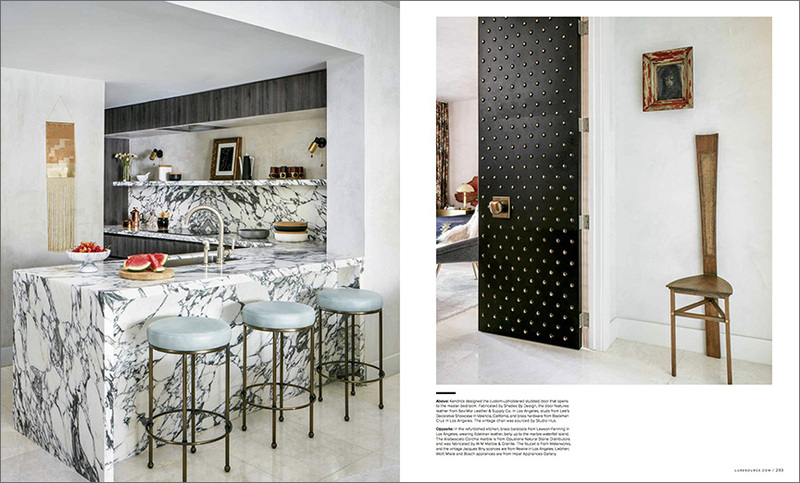 When we scouted the project with Jackie, it was decided that much propping and styling was needed to make the house “magazine ready”. We met the day before the shoot to style several of the rooms. Working with Jackie and her team is always great fun! Tables were set, bars styled, kitchen prepped, and beds were made. It was a beautiful blue sky day, so while I worked inside with Jackie, Robert wandered around outside and photographed several exterior angles. When then went back the following two days to shoot the interiors. The results of the team effort can be see in Seaside Style out today on the news stands! 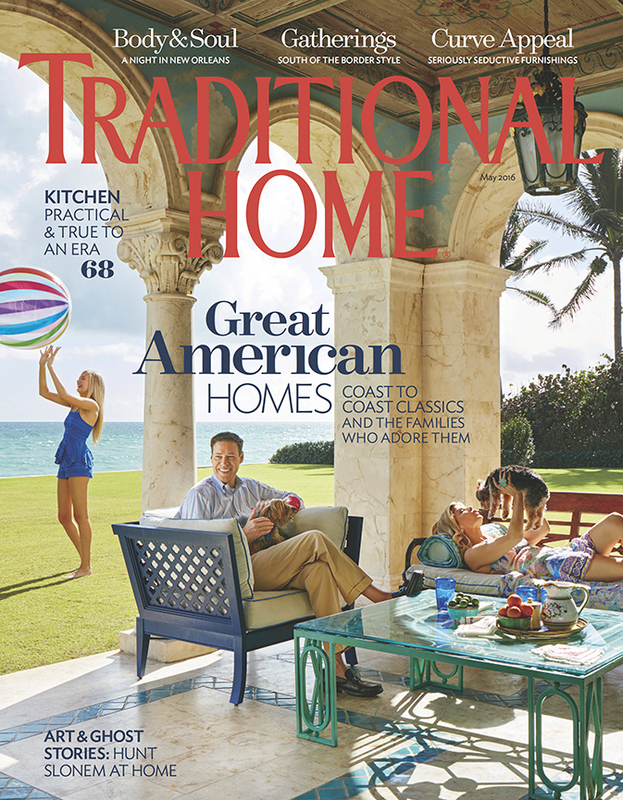 We are so very honored to have been a part of the Traditional Home photo shoot and to have our photography on the cover of the May issue of Traditional Home Magazine! Thank you to the talented staff at Traditional Home, including Ann Maine, Tori Mellot and Mick Schnepf. 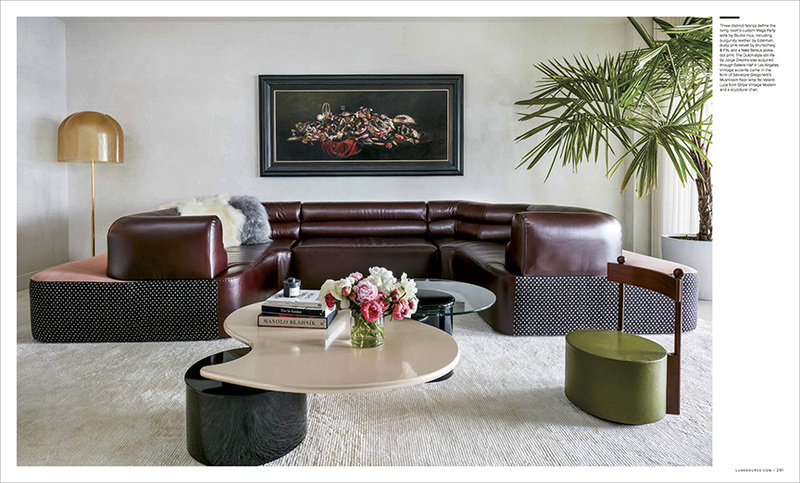 Thank you to interior designer Frank DeBiasi. We owe the beach ball prop to Frank! And thank you to the Matthews family for being so cooperative and photogenic! 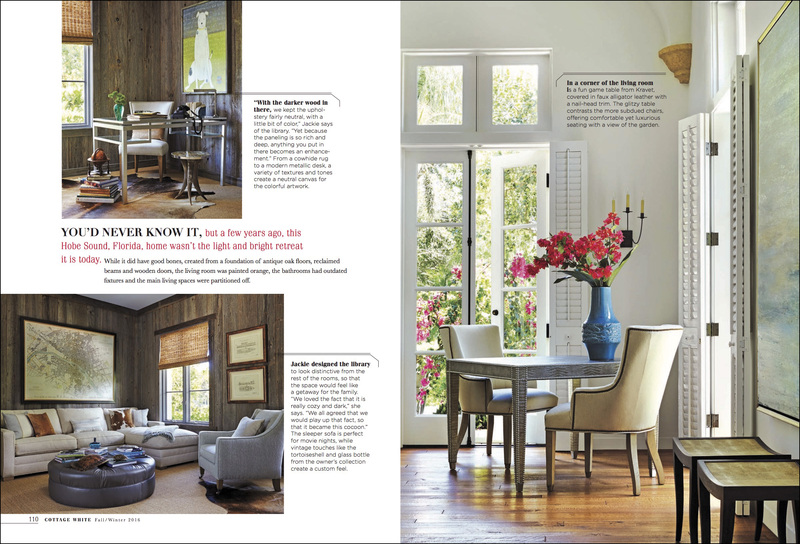 We share the photo credits with Ken Hayden, who photographed the interiors. 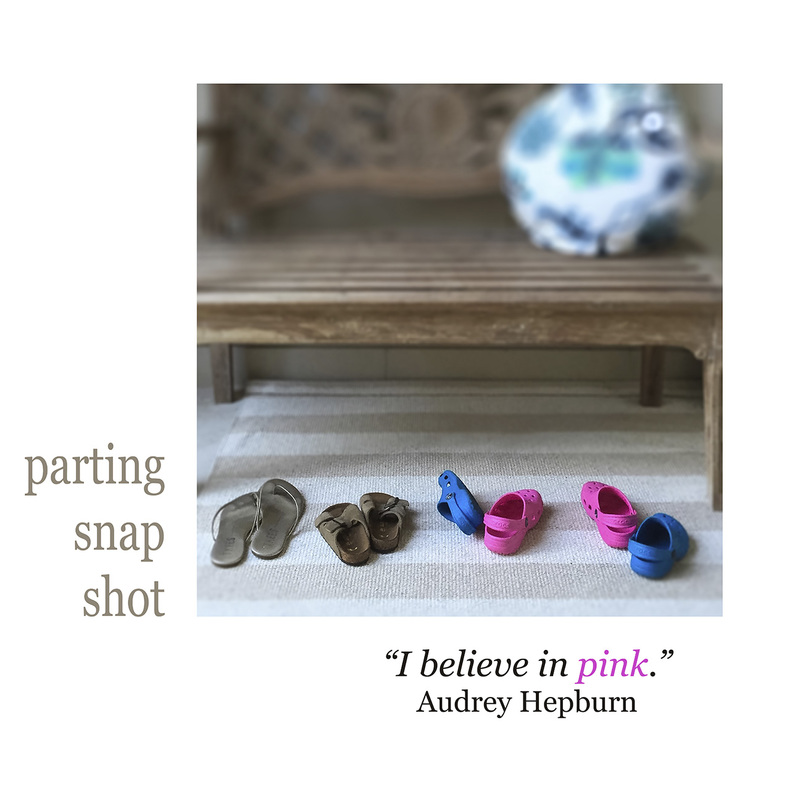 The Brantley team spent a day photographing the family. 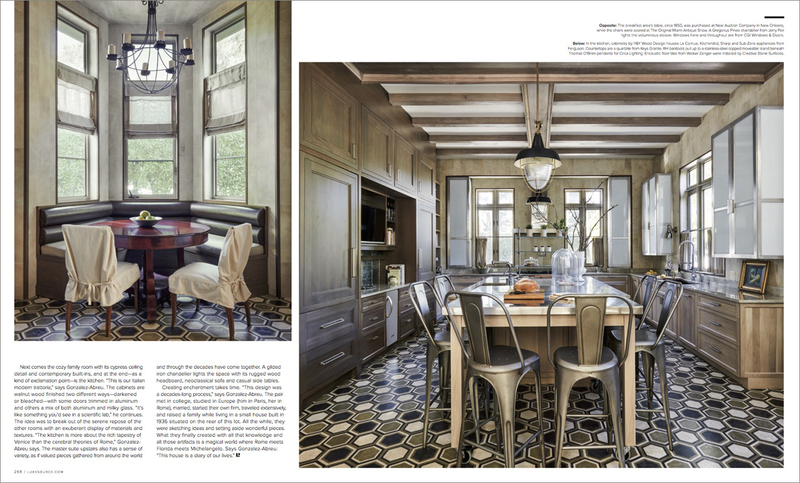 We also photographed the amazing kitchen designed by Frank DeBiasi. 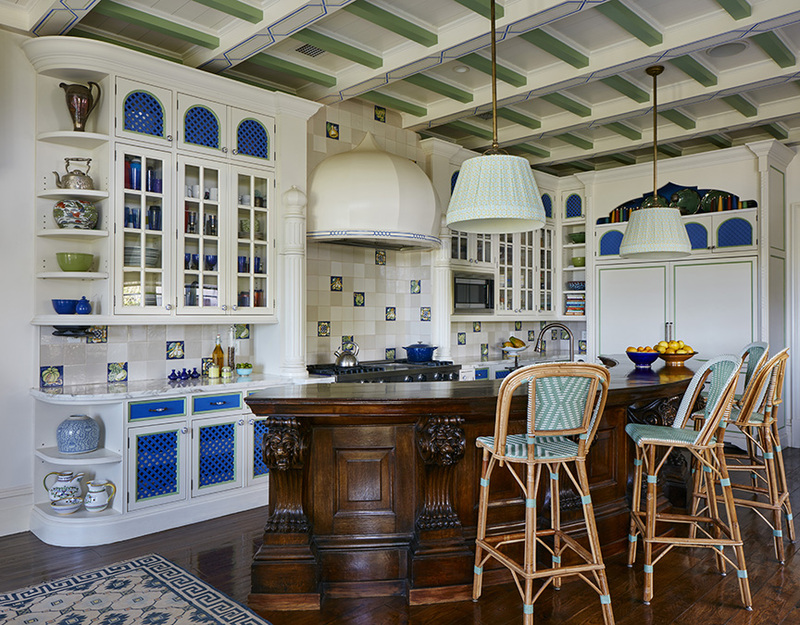 The blue and green kitchen features a 200-year-old bar from a London pub. Frank blended the old with a fresh palette for an informal cooking and eating area. The shoot was a team effort that included myself, Robert, assistant Dan, editor Tori and designer Frank. And it always helps when the family (and pets) are as photogenic as the Matthews. To view Traditional Home, click here. 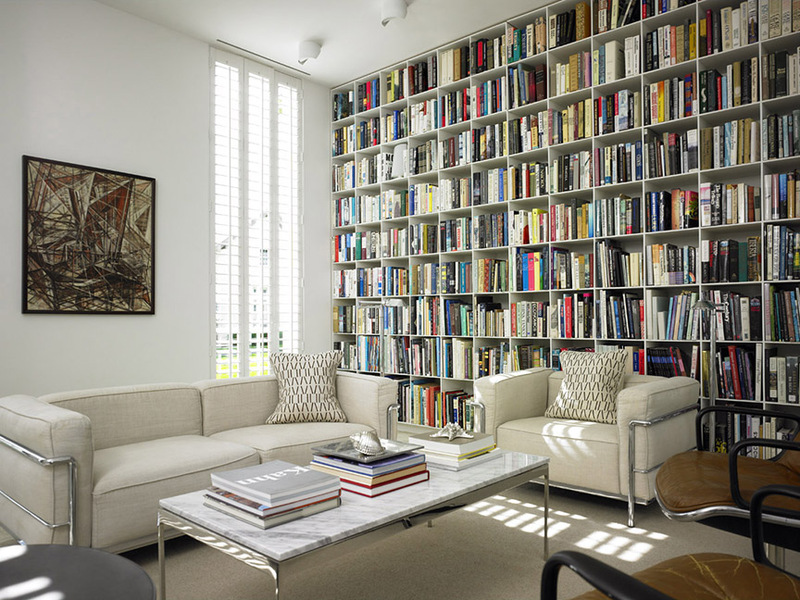 Architectural photography penthouse style – featuring the furniture of the late Vladimir Kagan. Mr. Kagan, a genius in the area of mid-century modern furniture design, passed away last week at the age of 88. We had the opportunity to photograph this two story penthouse in downtown Ft. Lauderdale which showcased vintage Kagan designed furniture. Born in Germany in 1927, Mr. Kagan came to the United States in 1938. He studied architecture at Columbia University. In 1948, he opened his first shop in New York. His clients include luminaries in the world of art, theatre, music and industry. 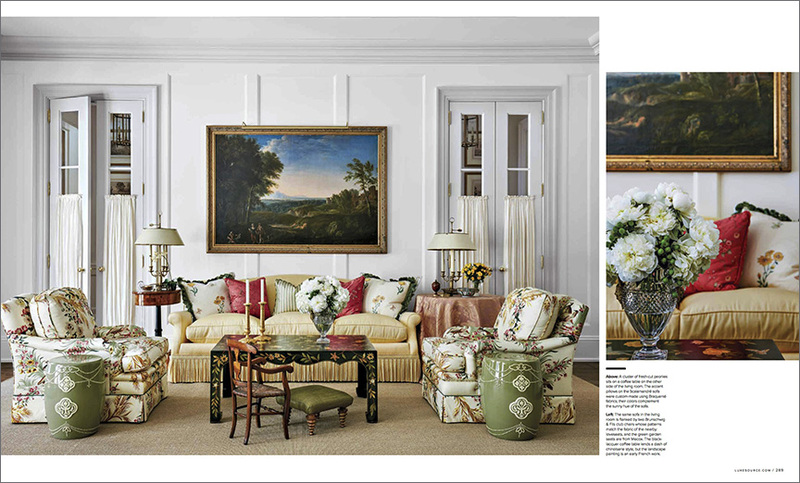 Connoisseurs and museums avidly collect his designs. 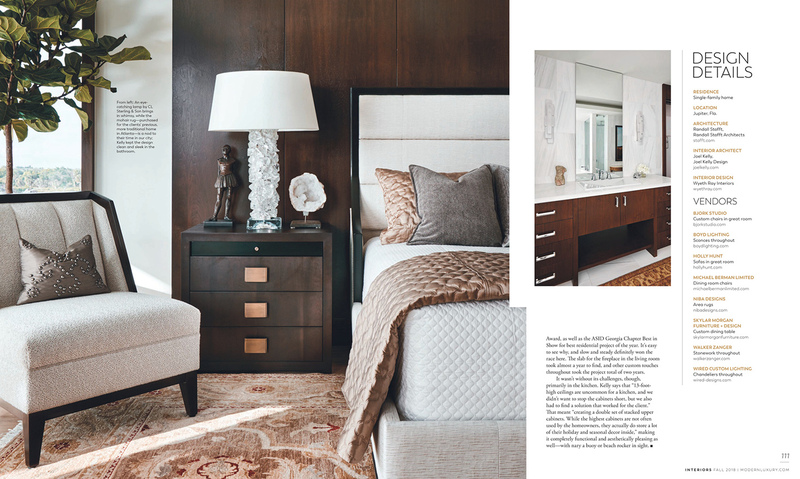 It was a pleasure to photograph this apartment which prominently spotlighted Mr. Kagan’s furniture. 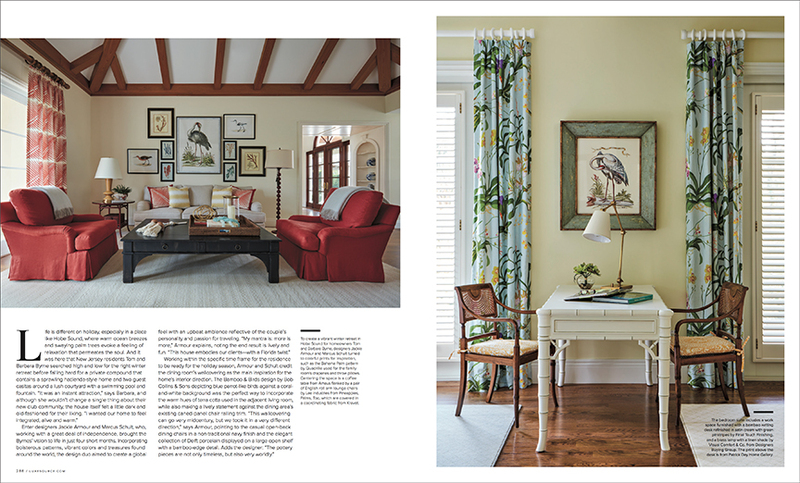 A few years back, Veranda Magazine sent us on assignment to New Orleans to photograph the beautiful home of interior designer Tara Shaw. 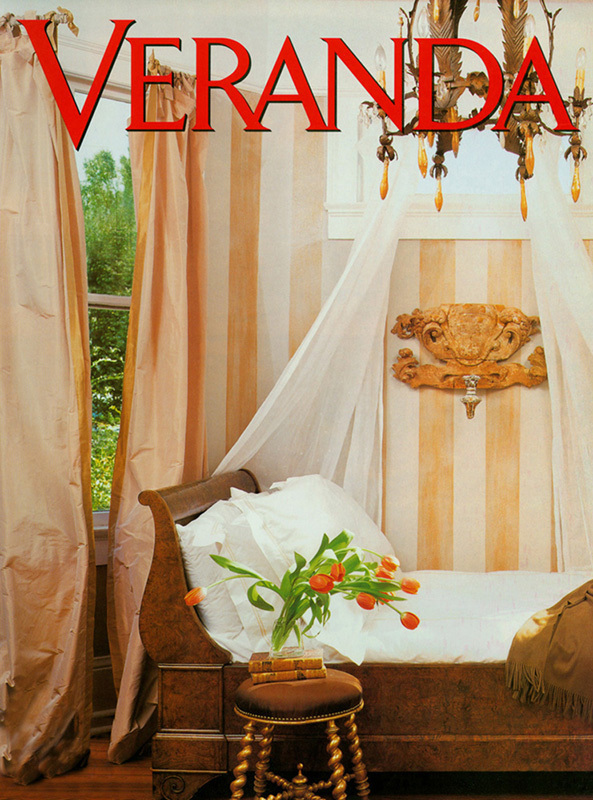 The antique-filled home gave us our first cover with Veranda and allowed us the opportunity to work with the very talented and delightful designer. 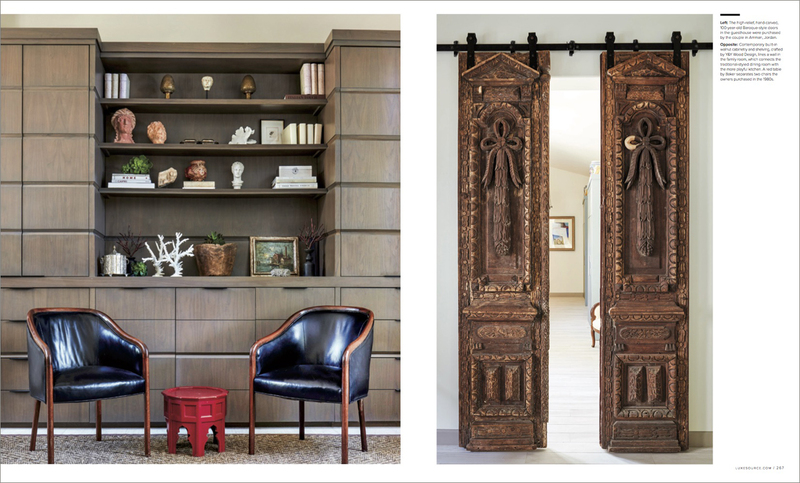 Tara, a native of Louisiana, is also the owner of Tara Shaw Antiques and Tara Shaw Maison, a reproduction line she created after realizing one-of-a-kind treasures from Europe were disappearing. Fast forward . . . . Recently, while browsing on-line for props for an upcoming photo shoot, I came across Tara’s antiques and reproduction furnishings on One Kings Lane. 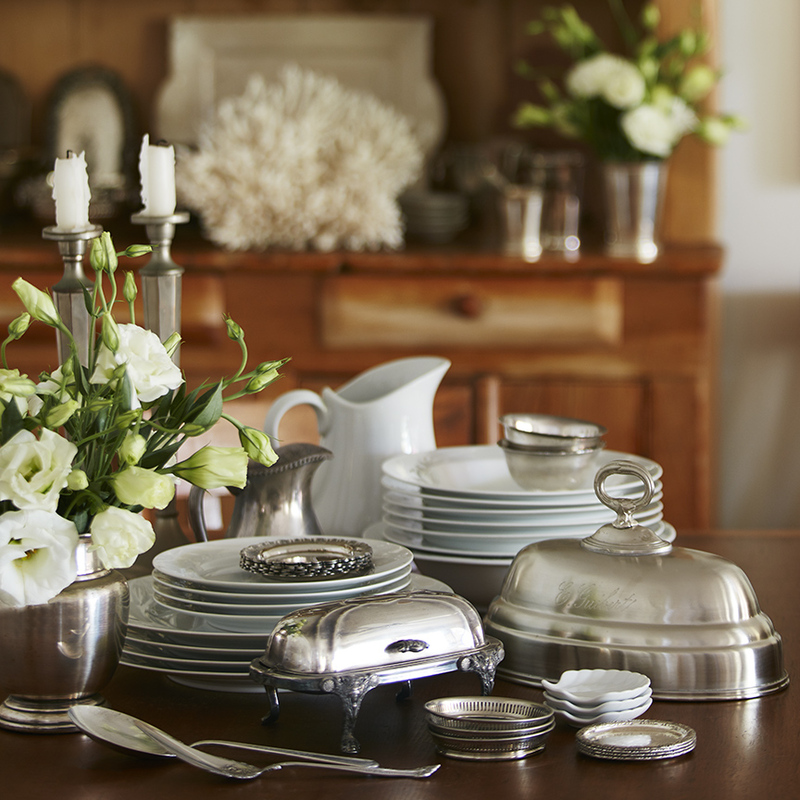 It was there I found a beautiful French Petit Cloche – a perfect fit for the tablescape we were photographing, which included antique silver and classic white china, set in front of an antique wood hutch. The monogrammed cloche, from Tara Shaw Maison, is a reproduction of an antique design using new materials. Old and new sharing the same table. 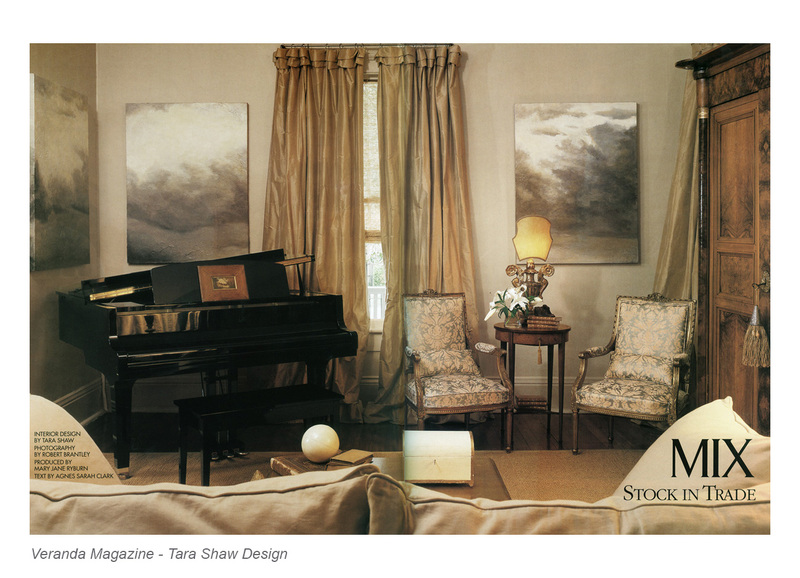 For more of the Tara Shaw Collection on One Kings Lane, click here. 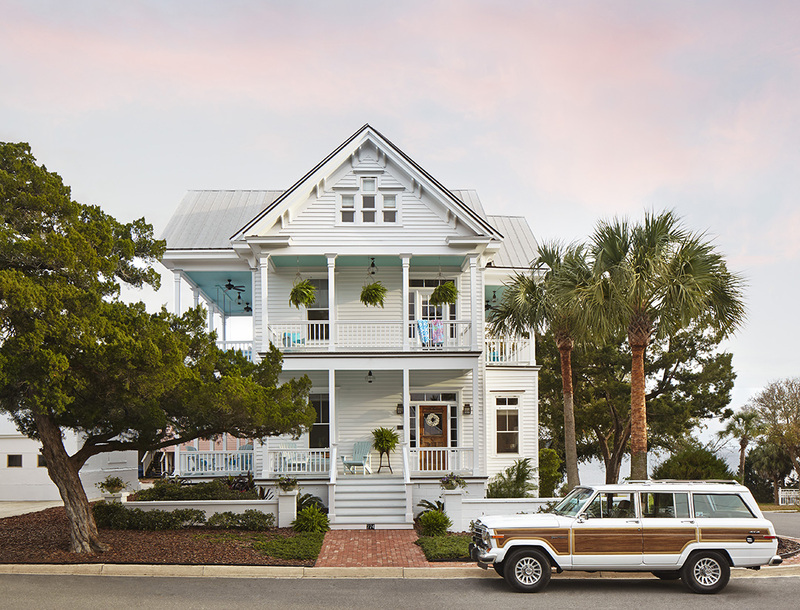 A recent architectural photography assignment for Coastal Living Magazine took us to Cedar Key on the west coast of Florida. It was a wonderful opportunity to photography a historic home in Old Florida. 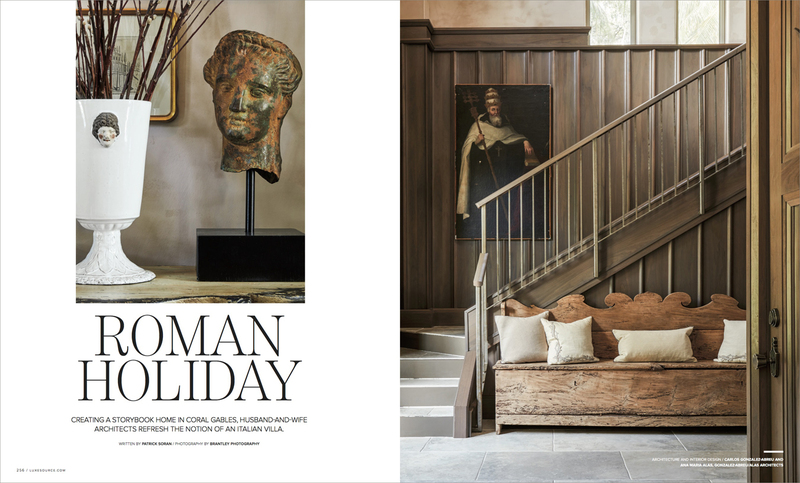 Working with New York stylist Erin Swift and Houston interior designer Melissa Rosenberg, we worked together to capture the character and history of the house, built in 1888. At the end of the two day shoot, the gracious homeowners treated the crew to a homemade dinner of never-ending fresh Gulf shrimp coupled with a pot of fresh potatoes and sweet corn. And – here is the best part -it was all served on a newspaper-covered dining room table for easy clean-up. Great house, great people, great food, great conversation – what more could you ask for on a photo shoot! 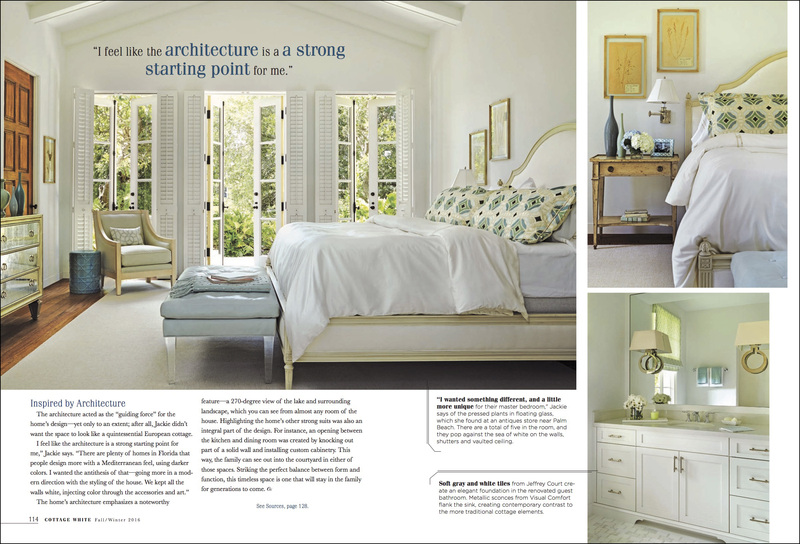 To see the entire Coastal Living article, click here. As an architectural photographer, it is important to understand the “wow” factor. When it comes to magic hour shots, whether at dawn or dusk, the “wow” factor seems easy. The drama, the lights, the reflections, the saturated colors – they are all part of the mix. It may appear easy at a glance, but as the saying goes, “timing is everything” and when it comes to photographing at twilight, this couldn’t be more true. To catch the right balance between the daylight and the inside lighting is critical. 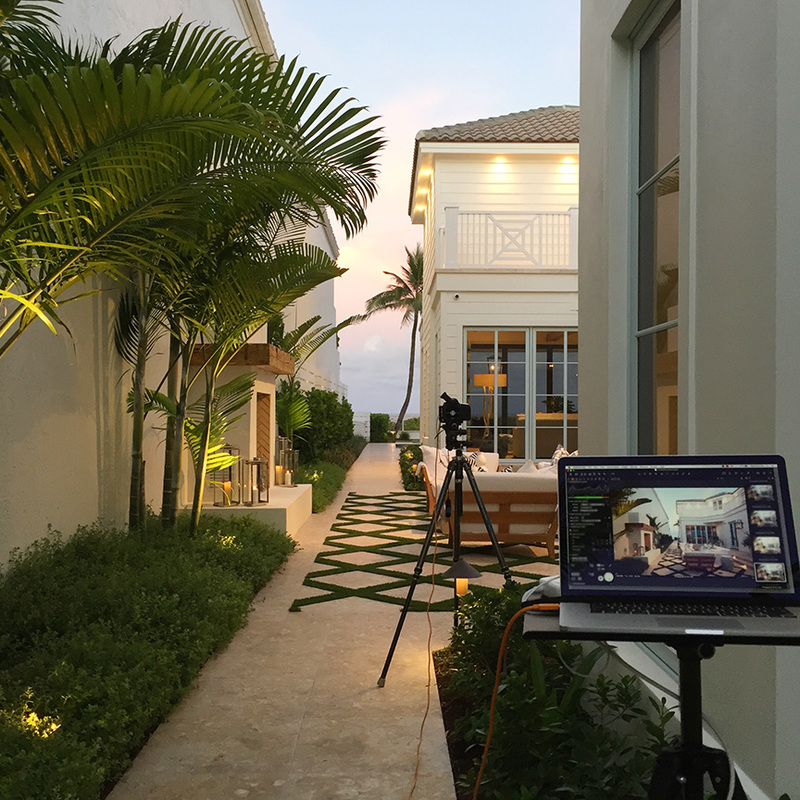 As every architectural photographer knows, stunning dusk/dawn shots make for happy clients, and we all want happy clients! 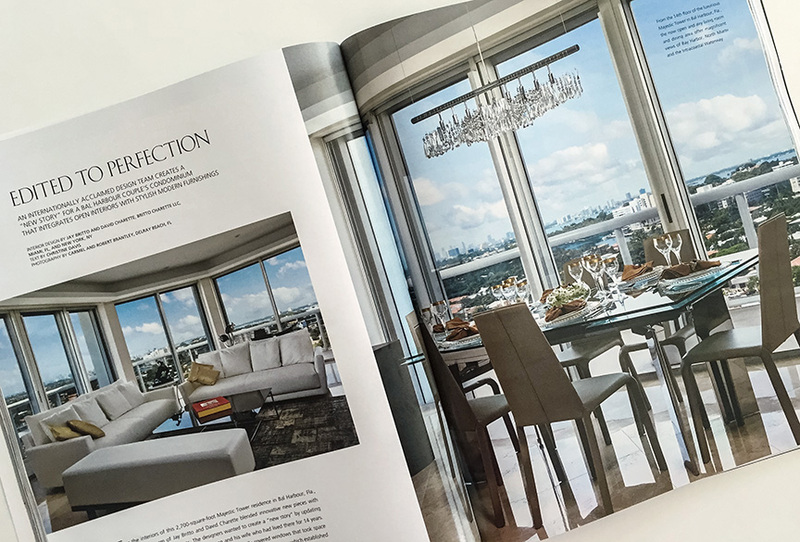 To continue the conversation from a previous blog regarding the need for “staying visible” in today’s marketplace, here is a published project that showcases our Miami interior design photography. 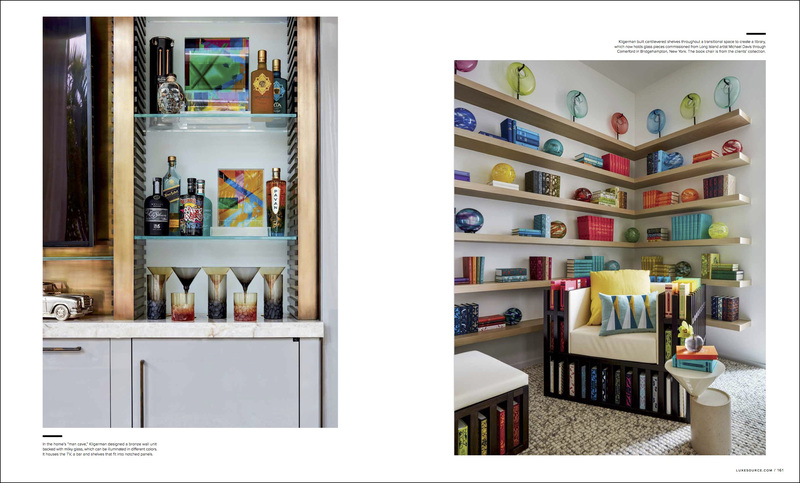 The current issue of Miami Home and Decor Magazine features this Bal Harbour condominium, designed by the internationally acclaimed design team Britto Charette Design. 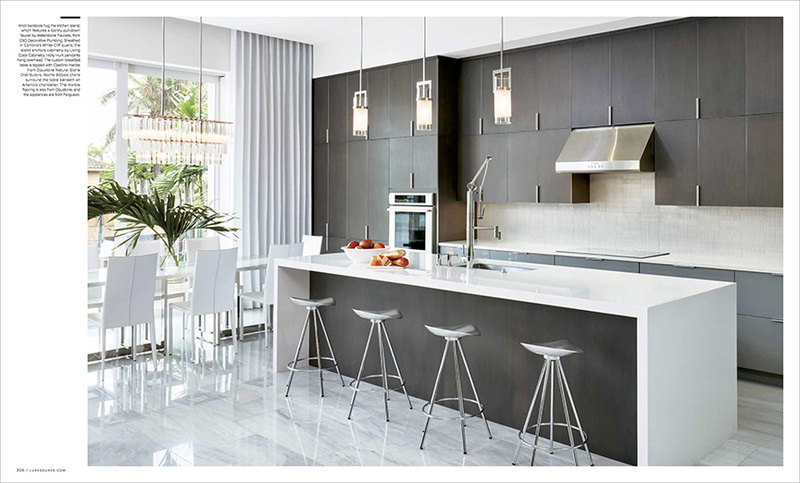 The 2,700-square-foot apartment integrates an open floor plan and modern furnishings. 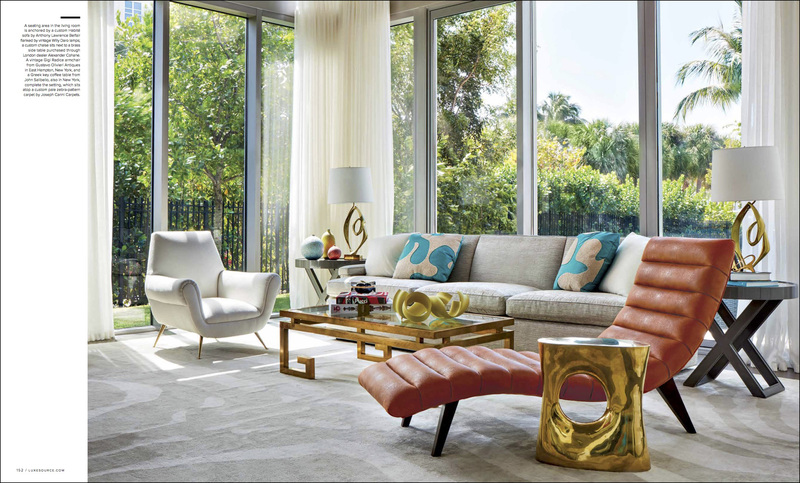 Water views and cityscapes fill the floor to ceiling windows. Located on the 14th floor of the Majestic Towers, the surroundings made for an enjoyable day of photographing interiors with designers Jay Britto and David Charette. 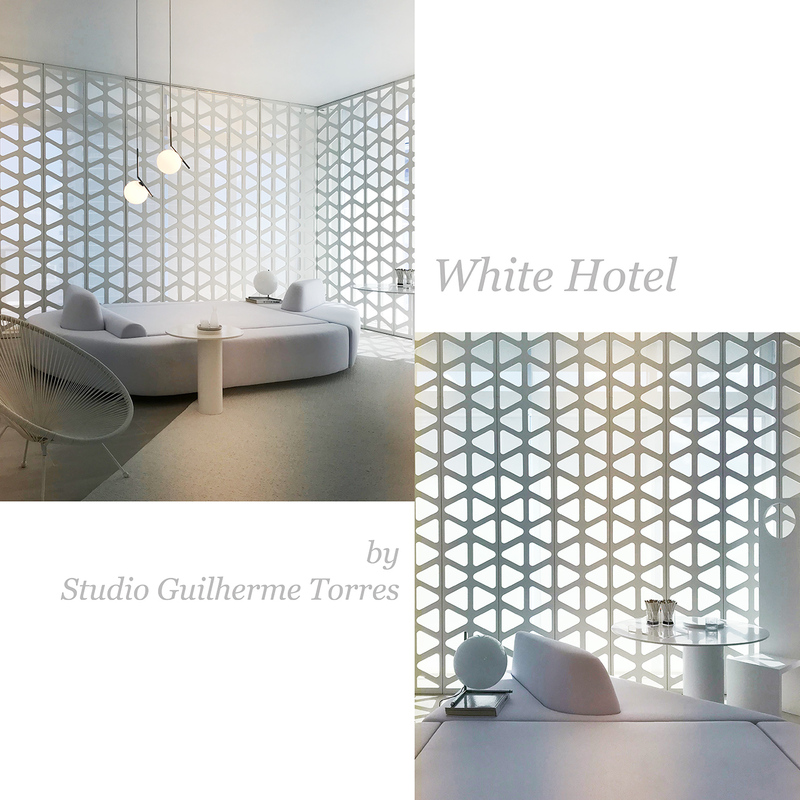 Marketing architectural and interior design projects in this complex, ever-changing, visually-driven marketplace, is more important than ever. Keeping your name and work visible through magazines, books and social media outlets is a priority. We are extremely lucky to work with talented professionals in the architectural and interior design fields who give us exciting projects to photograph. Our relationships with the industry’s top editors writers, and bloggers, allows us the opportunity to help our client’s keep their projects in front of potential buyers. In today’s fast-paced world, it’s all about staying visible. 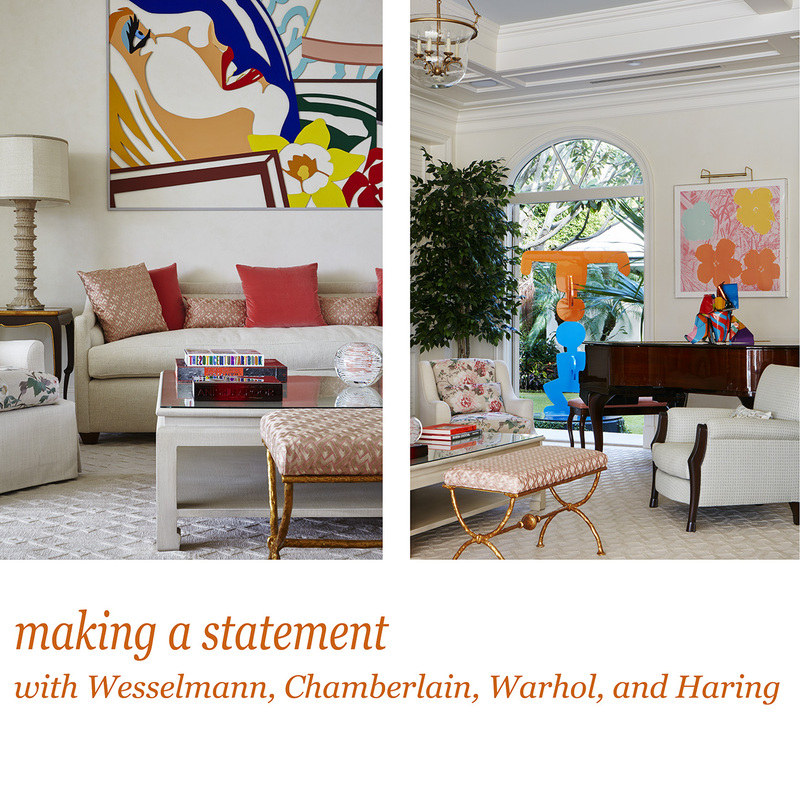 When One Kings Lane asked me to participate in their “Head Over Heels For Chaises” campaign, I was thrilled! 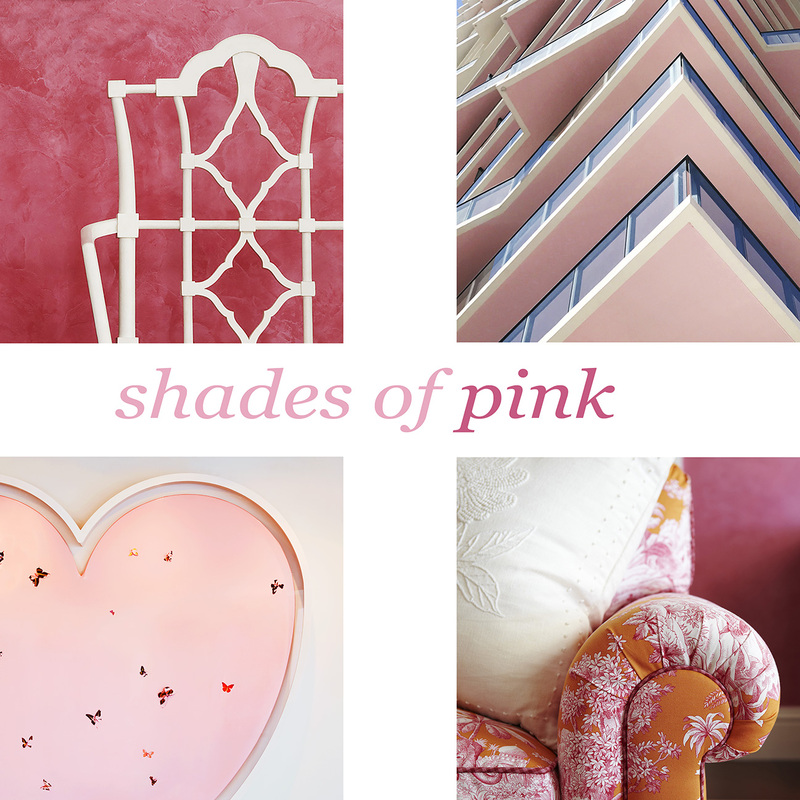 In honor of Fashion Week, OKL asked a few bloggers to pair their favorite shoes with a favorite chaise. 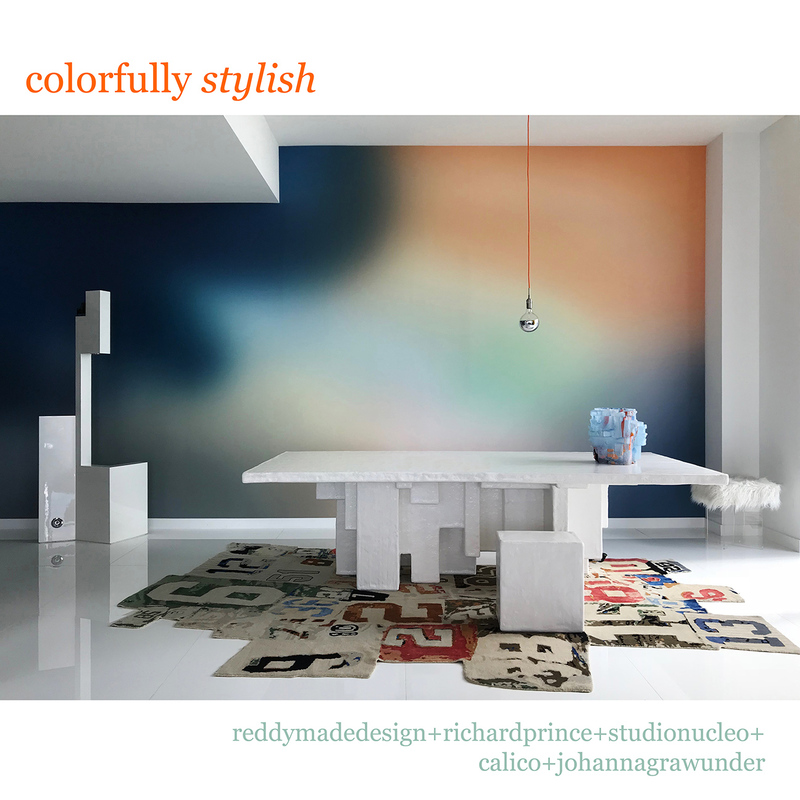 Fashion + Interior Design – count me in! For me, it’s all about casual comfort. Living in South Florida, my Jack Rogers Palm Beach Sandals are my go-to shoes. Made famous by style icon Jackie O in the early 1960’s, these are a Palm Beach fashion staple for most women. 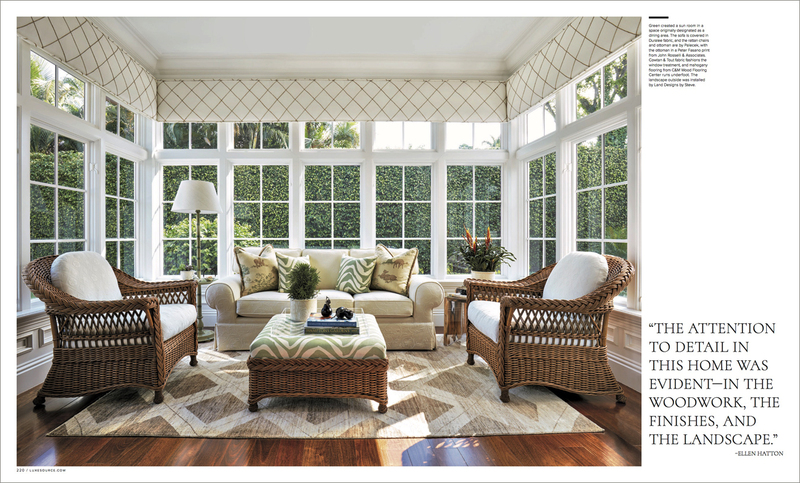 For a favorite chaise, how could you not love an over-sized, white linen chaise? The perfect spot for reading, relaxing, napping . . . after a long day, nothing is better than to kick off those heels, and sink into your favorite chaise. 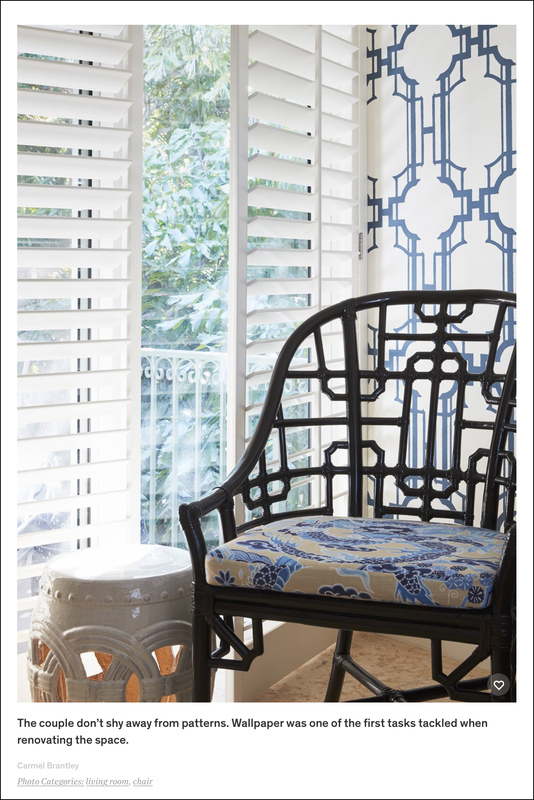 For a great selection of chaises, visit One Kings Lane. 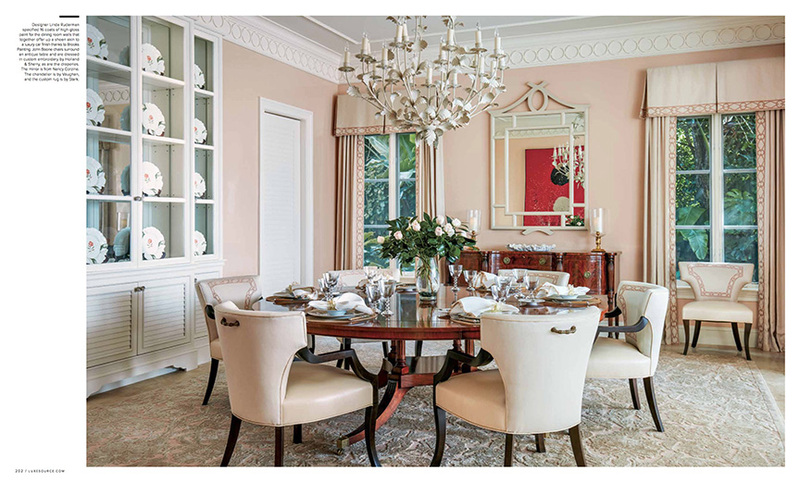 Thank you to William Bainbridge Steele Design and the Palm Beach Red Cross Show House for giving us this beautiful setting for the photo shoot. Thank you to my hubby Robert for his patience in photographing me. A girl has to get her hair and make-up just right! We are so proud to be a part of these recent interior design books! 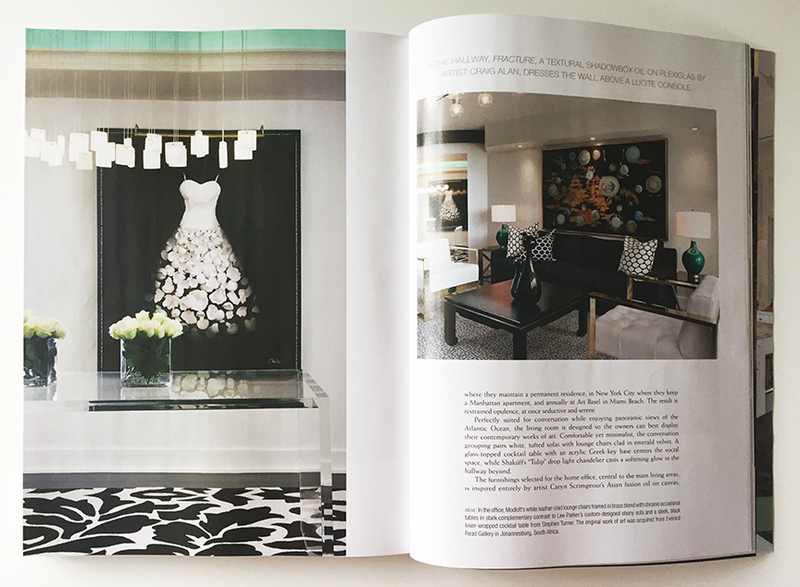 A stunning project we photographed for Carrier & Company graces the cover of their book, Positively Chic Interiors. 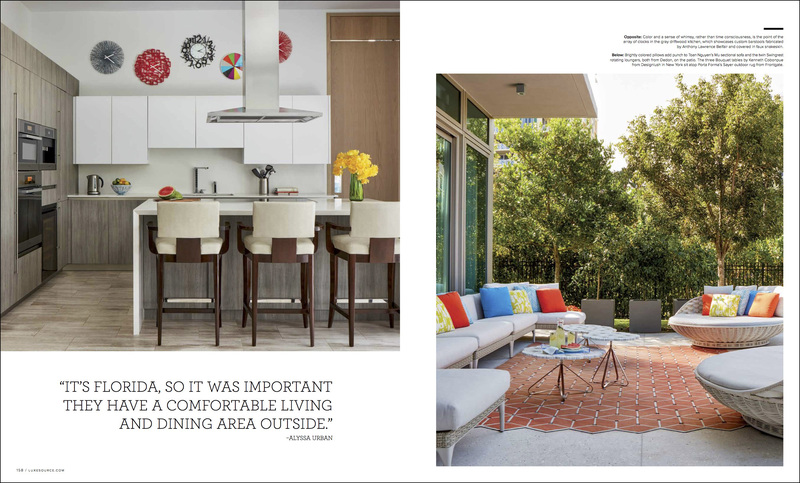 The amazing book by John Barman includes two projects we photographed for John – a beautiful contemporary Miami apartment and a colorful house in Boca Raton. 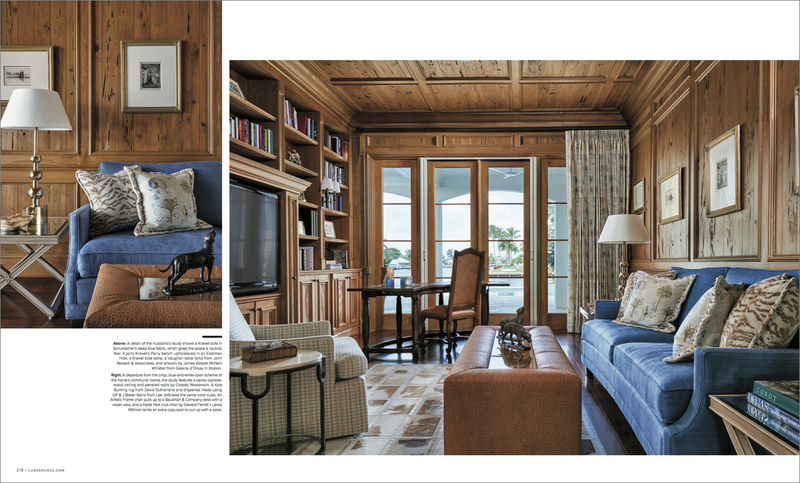 For Geoffrey Bradfield’s Artistic License, we photographed a magnificent yacht that sleeps 12 and has a crew of 14. 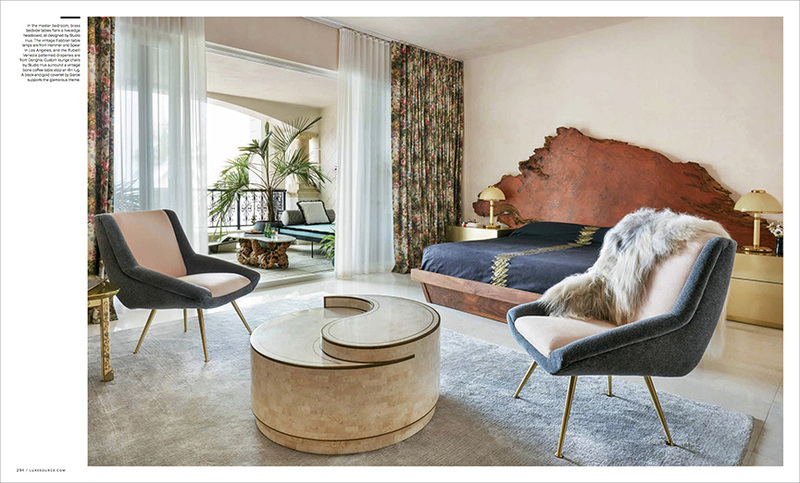 The interiors Geoffrey designed were reminiscent of 1940’s Hollywood glamour. And Decorating with Carpets by Stark Carpets features several design projects we photographed. 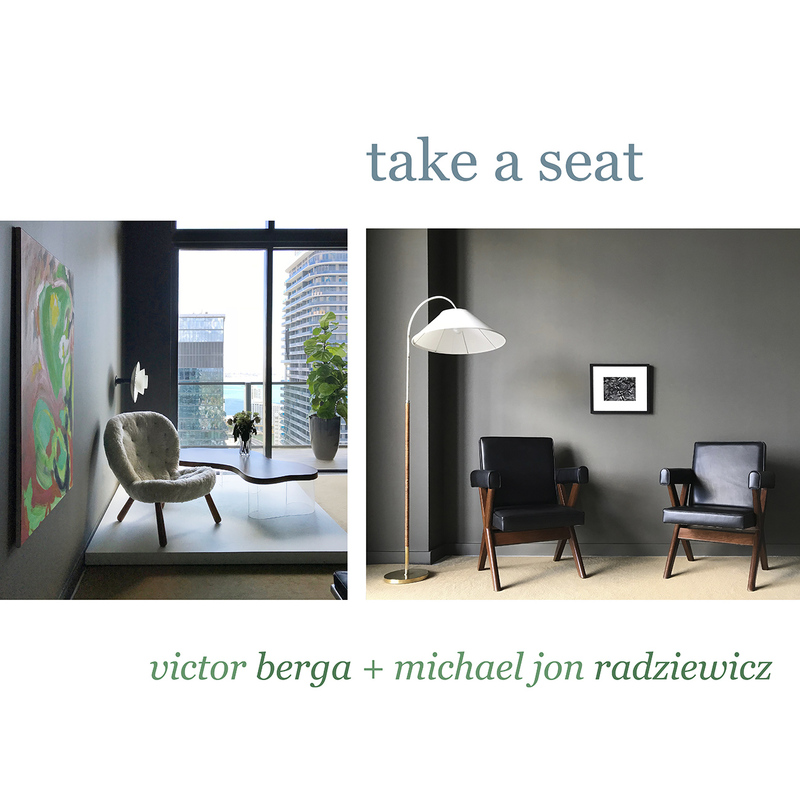 If you love design books like I do, be sure to include these in your library! 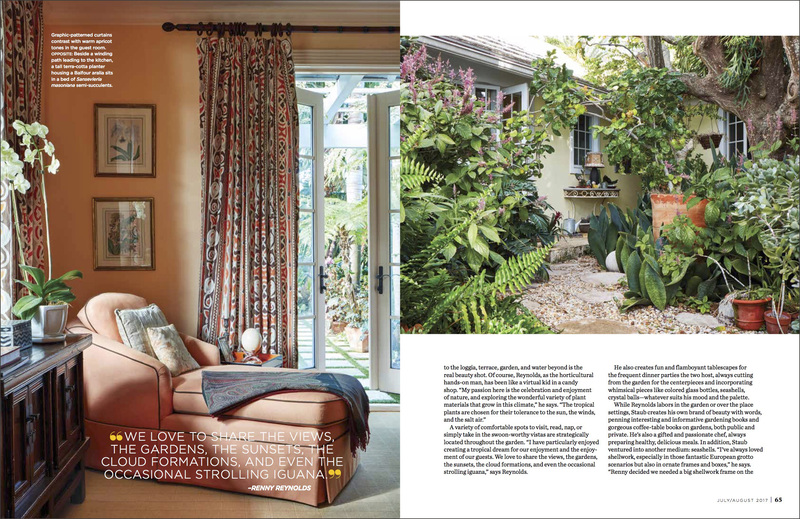 As an interior design photographer, it is always a thrill to see a national shelter publication feature one of your images on social media. 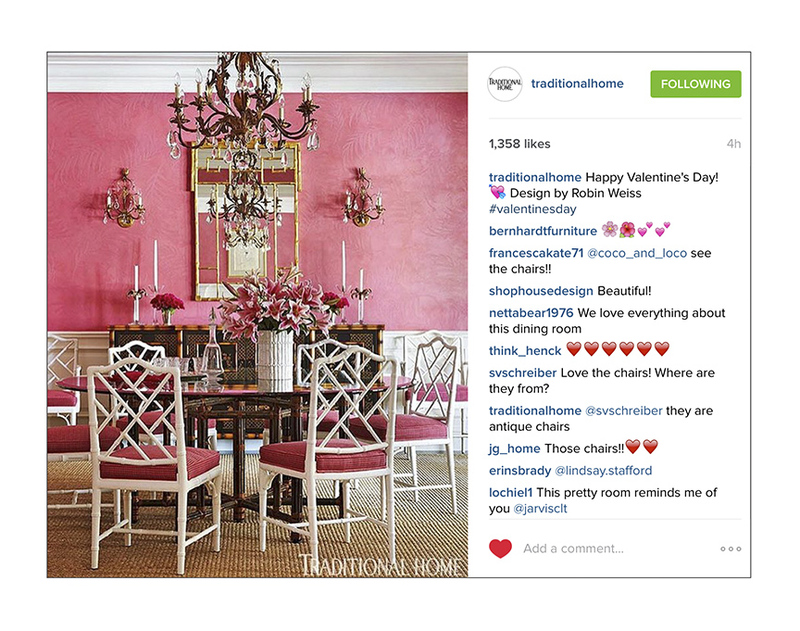 In this case, Traditional Home featured our work on Instagram. The image is from a photo shoot we did for the magazine a couple of years ago and was featured on their cover. 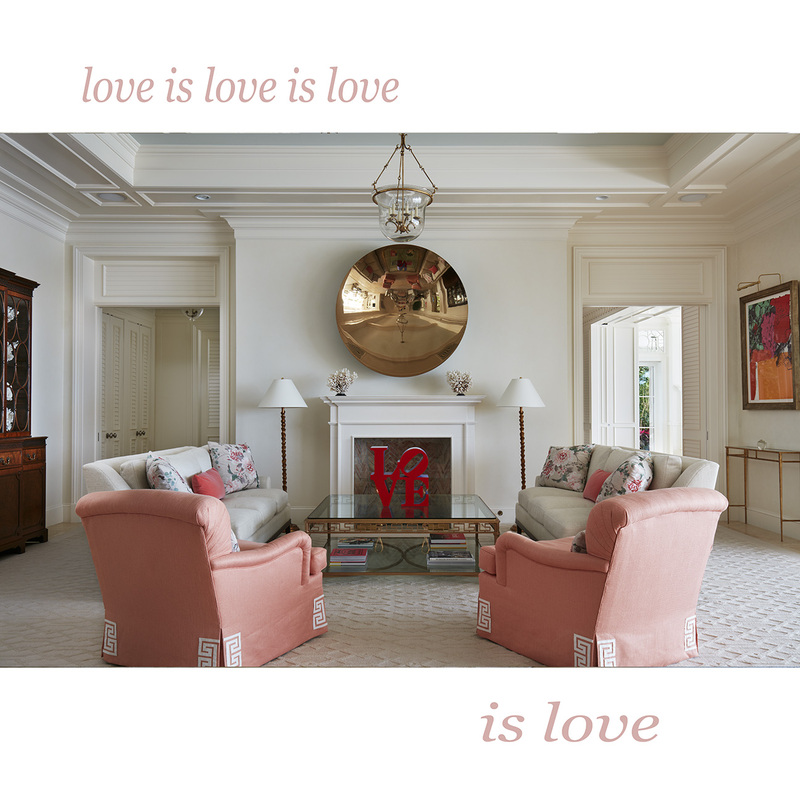 It was a fitting image to post since it was, after all Valentine’s Day and this particular dining room had beautiful pink walls, pink flowers and pink chair cushions. 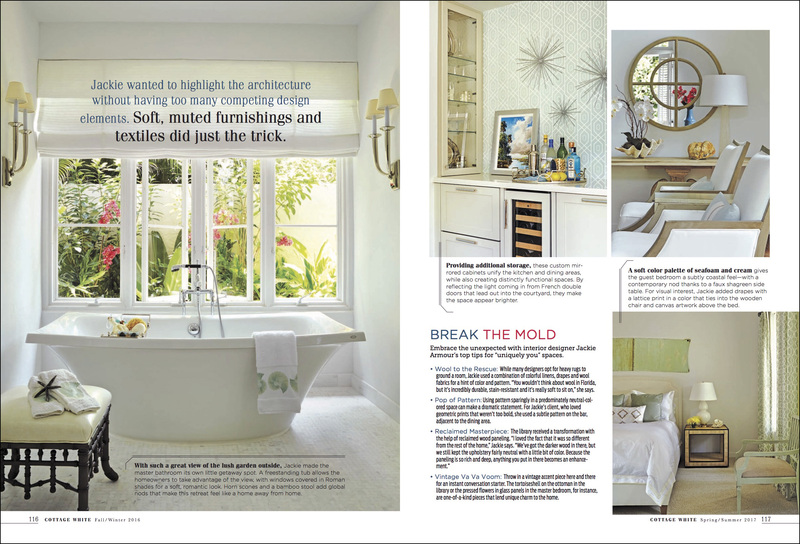 It was a fun project for us as we not only photographed it for the magazine but we also did all of the styling. The house was designed and built by architect William Wiestsma and the interiors were designed by Robin Weiss. 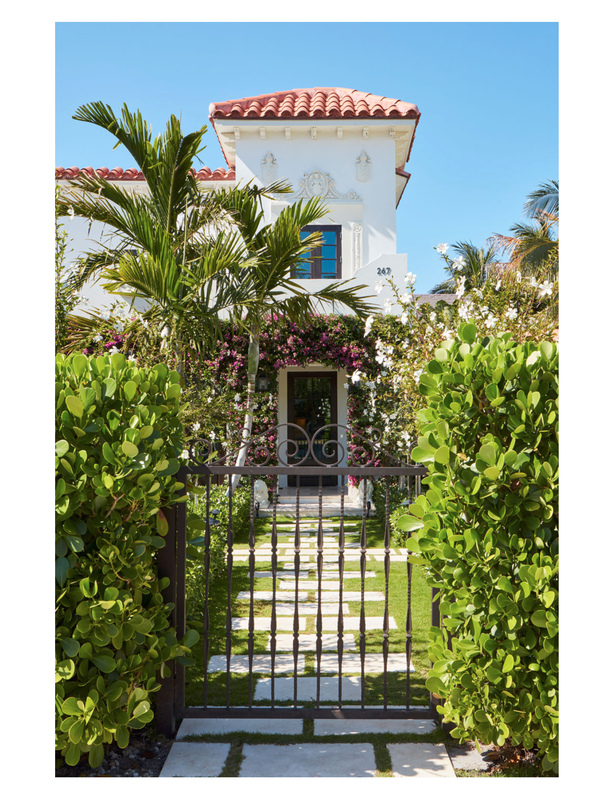 This stunning 1924 estate was the focus of a recent Palm Beach architectural photography shoot by Brantley Photography for designer William R. Eubanks Interior Design. 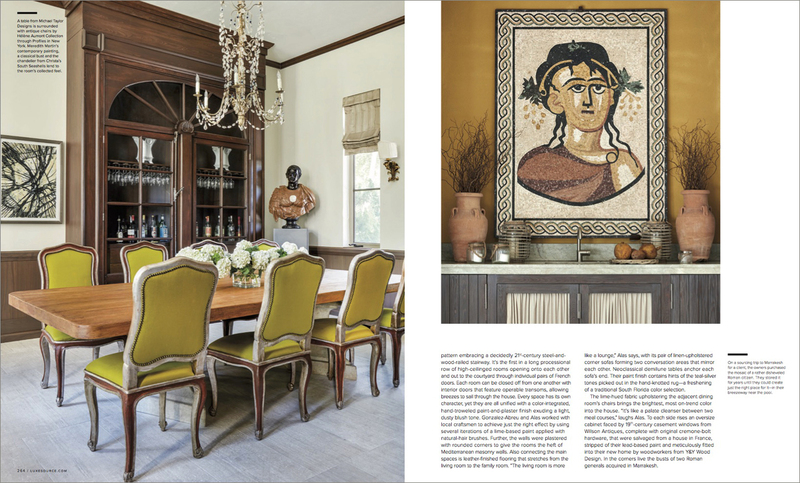 Working with designers William Eubanks and Mitch Brown, we were able to capture the charm and history of Tre Fontane, a landmarked Italian style villa. 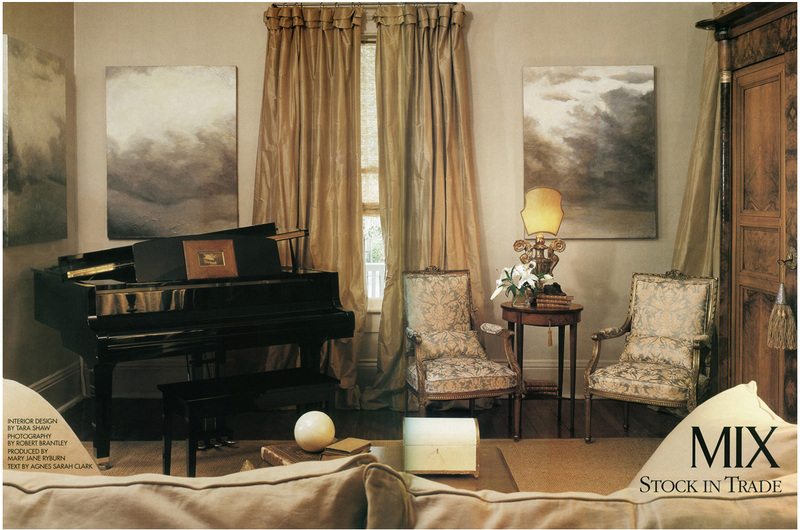 Originally designed by society architect Marion Sims Wyeth, Tre Fontane served as the Wyeth family home for 15 years. Wood-beamed ceilings, Cuban-tile floors, pecky cypress doors – architectural details that are a delight to photograph for every architectural photographer. 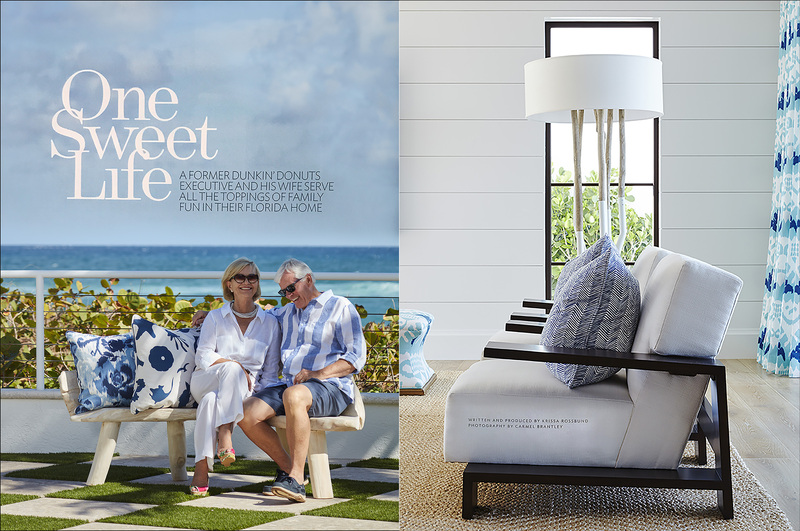 The house is the cover feature for the Spring 2016 issue of Palm Beach Life Magazine. Resort photography is always an exciting adventure for us. From setting up the photo shoot with ad agencies and hotel staff, to not disturbing the guests, to waiting sometimes hours for the perfect light, it is hectic and rewarding all at the same time! 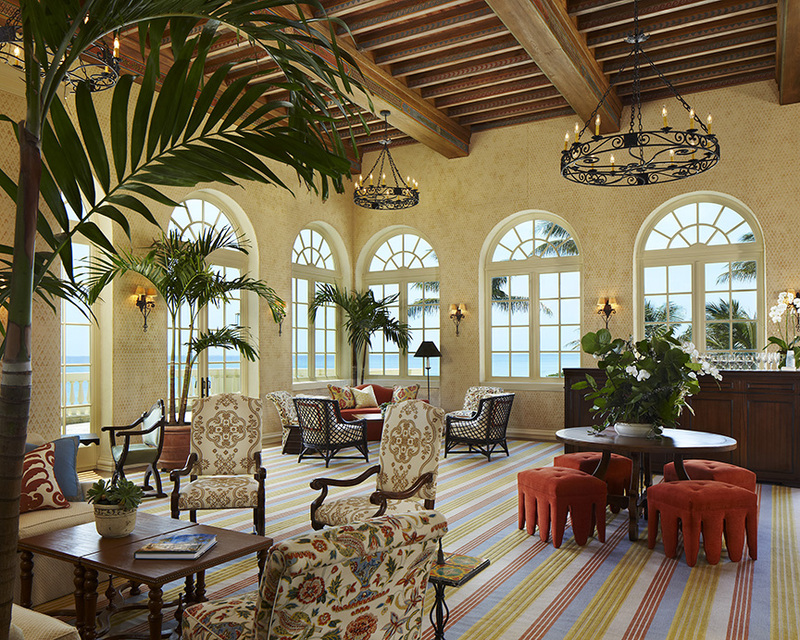 We had the pleasure of photographing interiors and exteriors at The Ritz Carlton Hotel in Ft. Lauderdale. 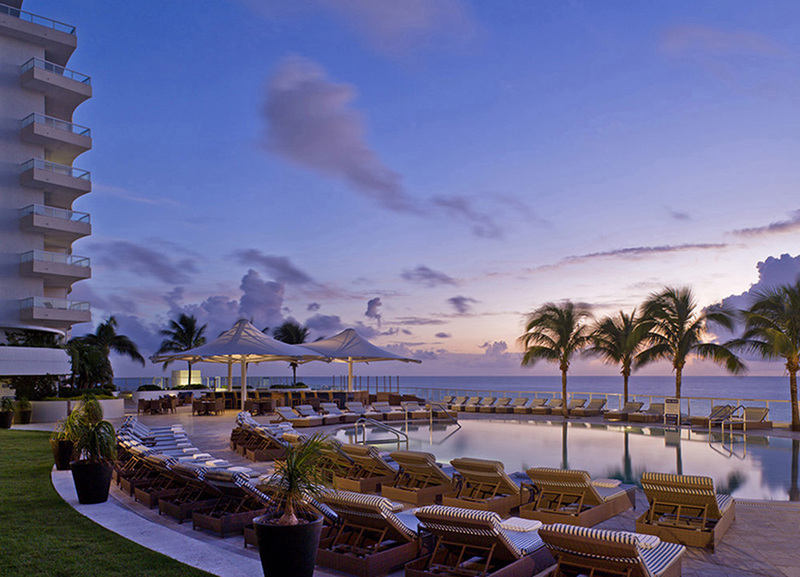 We know The Ritz Carlton brand well, having photographed three of their other Florida resorts. Our goal was to make the most of the early morning light. Arriving at the hotel at 3:00am, we went to work setting up two cameras. Robert positioned one camera near the pool looking to the northeast (Photo A). With the help of our assistant Matt, we arranged chairs, tables and umbrellas. We added a touch of light underneath the umbrellas to create a warm glow. The hotel gave us an ocean view room on the fourth floor which allowed us to set up a second camera on the balcony in order to capture the architecture, pool, landscaping and ocean from a higher perspective (Photo B). With a little help from Photoshop, I was able to remove the camera and photographer from each image as Robert and I were in each other’s shot. Mother Nature did not disappoint that morning, giving us a sky of soft blues and rosy pinks. To create quality hotel photography for a brand such as The Ritz Carlton, it takes a team and Mother Nature is often the star! While on a recent architectural photography assignment in Boston, we decided to extend the trip to spend some time enjoying the city. Our hotel was a block from the Boston Public Library in downtown Boston on Boylston Street. Built in 1895, the library was designed by architect Charles Follen McKim. Bates Hall (shown above) is acknowledged by many to be architecturally one of the most important rooms in the world. With a majestic barrel-arched ceiling, English oak bookcases, and carved limestone, Bates Hall is stunning in every aspect. We scouted the library one day to determine our best vantage points for shooting Bates Hall and The Chavannes Gallery. We wanted to draw as little attention to ourselves as possible. And, we wanted the least amount of people and activity in the areas we were shooting. Not easy as you can imagine this is a very busy place! The following day we arrived just as the doors opened in the morning to get the shots we wanted. With cameras in hand, Robert and I photographed as much as possible before the tours started and the book hounds descended. A dream situation for an architectural photographer! 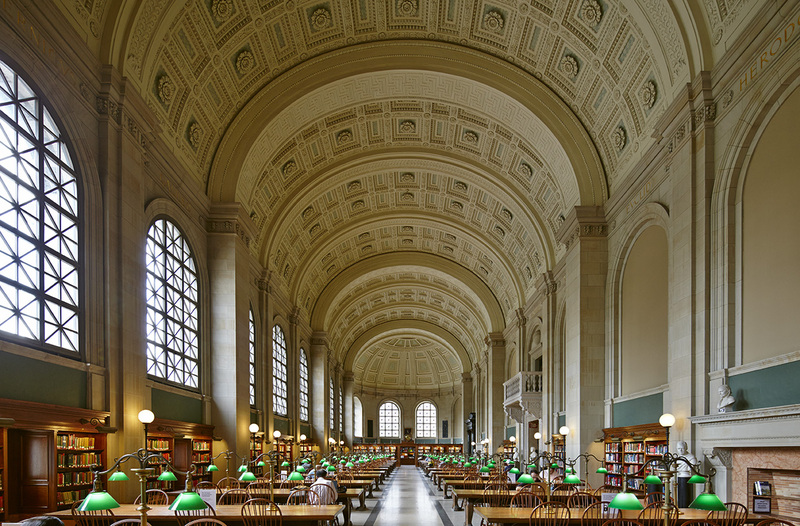 If you are in Boston and have some extra time and you enjoy architectural photography, take the time to visit the library. Bring your camera – you won’t be disappointed! 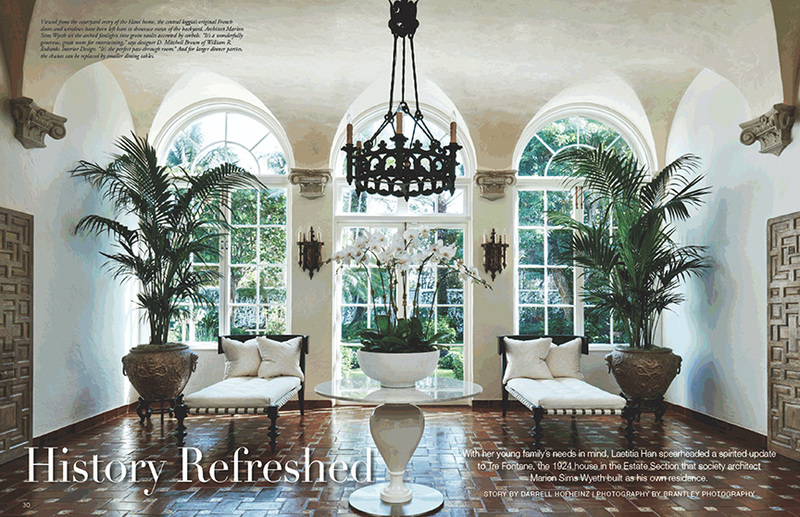 This stunning Palm Beach estate is featured in the new issue of Florida Design Magazine on news stands now. 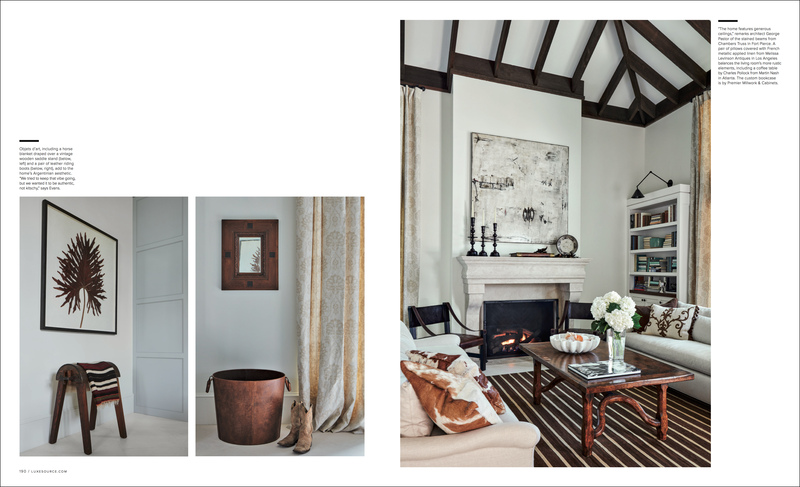 We enjoyed a great interior design photography shoot with our friends at Kemble Interiors. 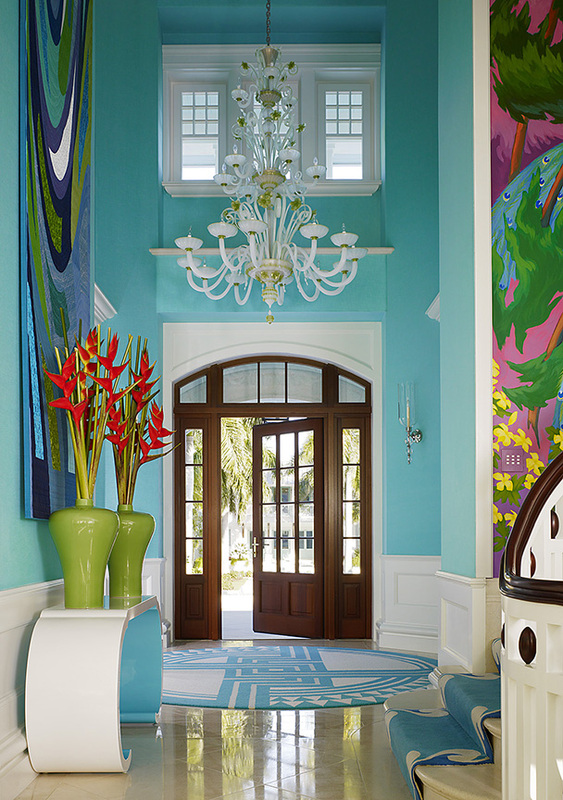 This tropical home is whimsical, colorful and fun, yet has the right amount of Palm Beach sophistication. 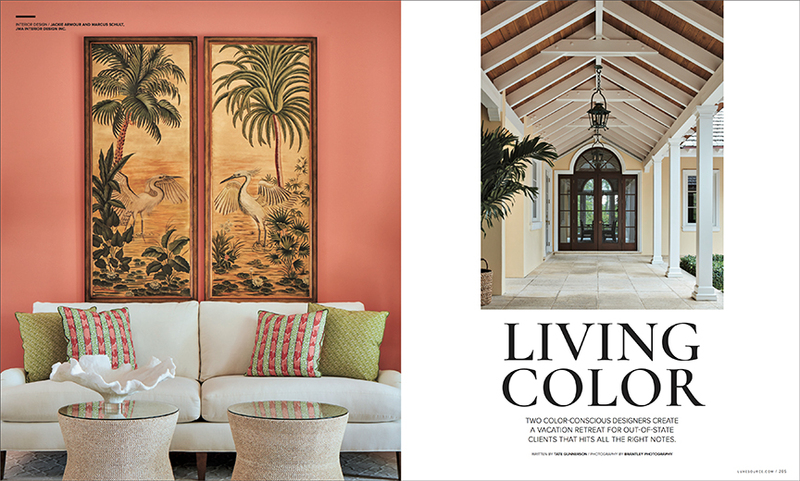 From orange walls in the living room to hand painted murals in the dining room, designers Mimi McMakin and Ashley Sharpe gave this house has a wonderful Carribbean feel. 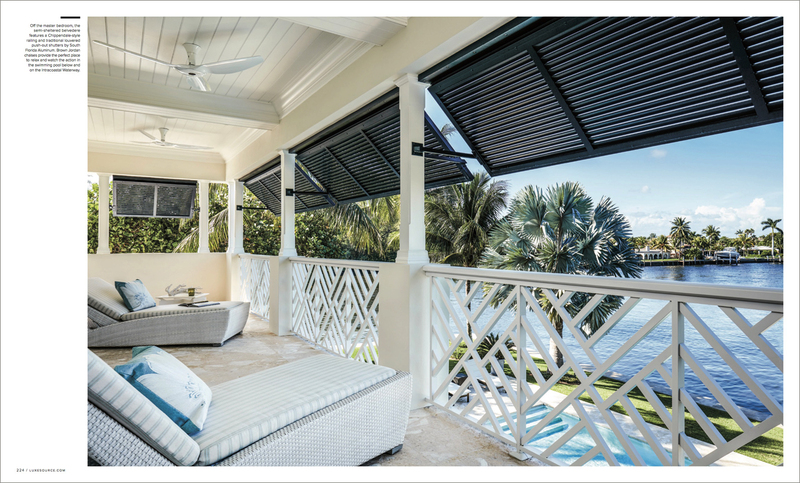 The property also has a beautiful pool and gazebo and an amazing loggia, complete with hand-painted tiles. The design team included architect Peter Papadopoulos of Smith and Moore Architects, Worth Builders, and Keith Williams of Nievera Williams Landscaping. 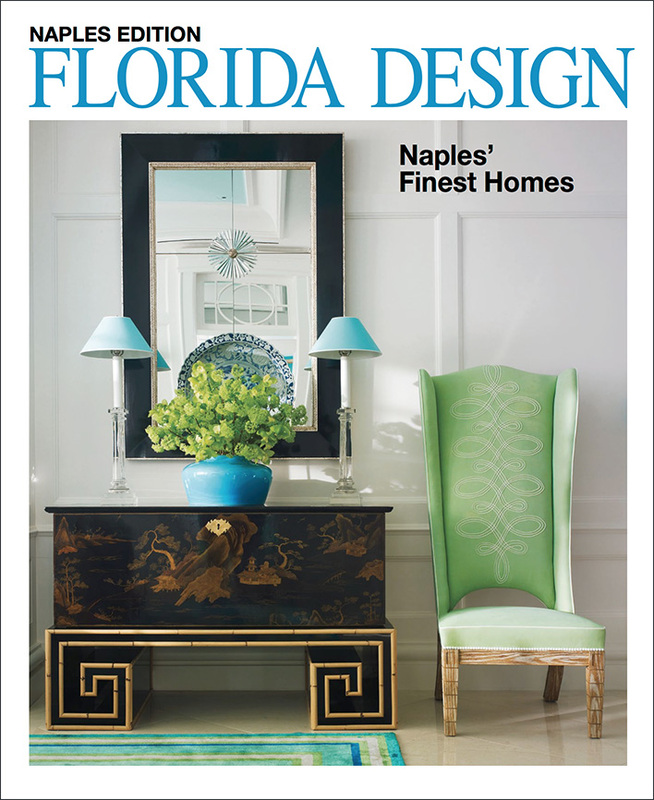 Pick up a copy of Florida Design to view the 12 page spread! 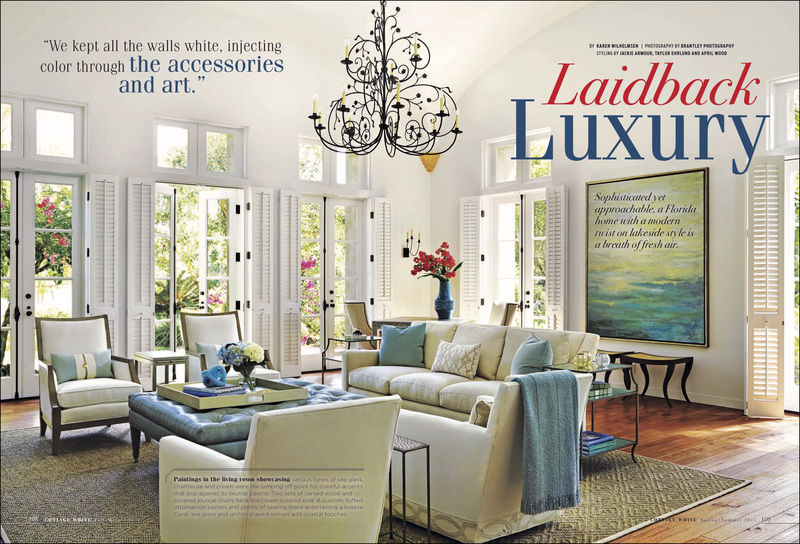 Editorial photography assignment featured in a recent issue of Luxe Magazine. 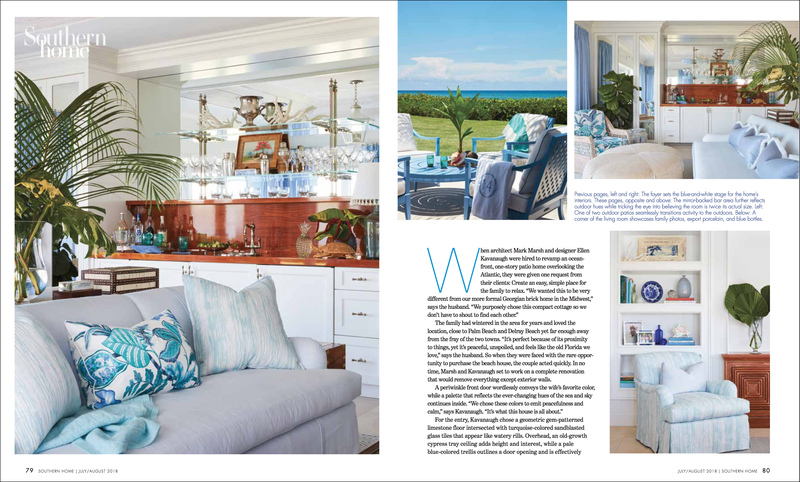 A beautiful “seaside chic” home located on the water in Delray Beach, was designed by Terri Pakravan of Decor Dose in Washington DC. 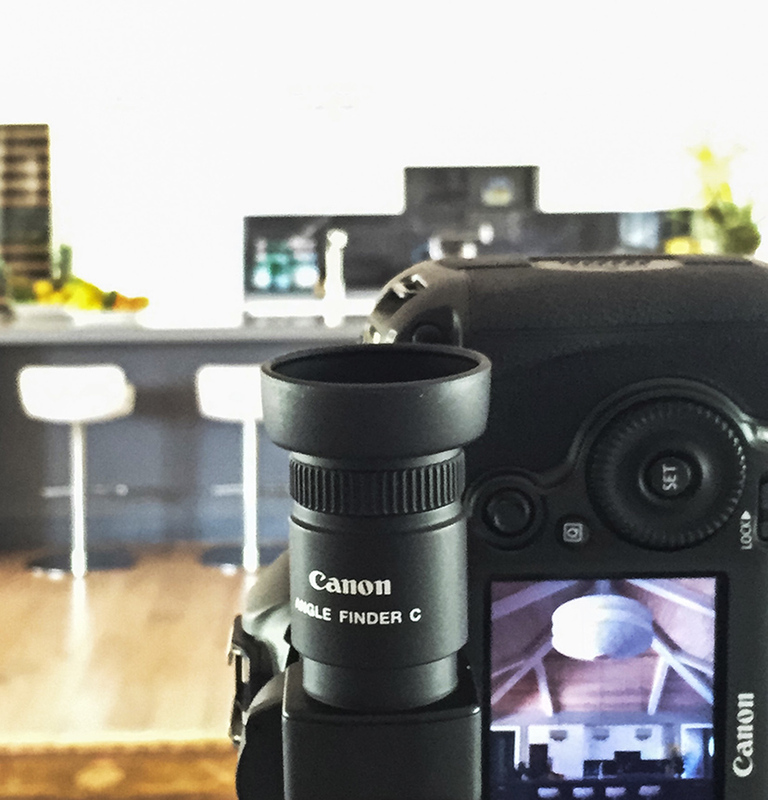 We spent two days shooting both interiors and exteriors on this home owned by a young couple with two children. 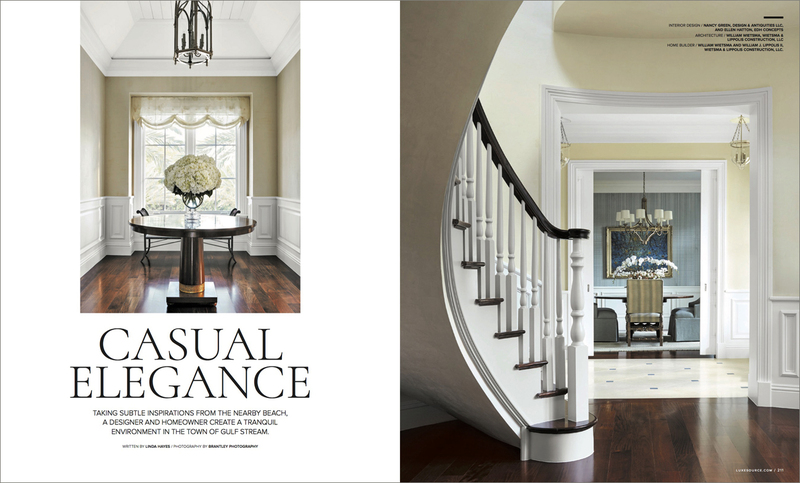 Elegant yet casual – the perfect combination for a waterfront home. Bold patterns dominate much of the interior spaces. We used a great deal of existing light and supplemented with strobe light. This gives the interiors a natural look and feel. Built by Seaside Builders with architecture by Richard Jones Architect. Thank you Luxe for this wonderful editorial photography assignment! Welcome to the new and improved blog for Brantley Photography – Architecture + Interiors Photography! Excited to start blogging again after taking some time off to update the website. 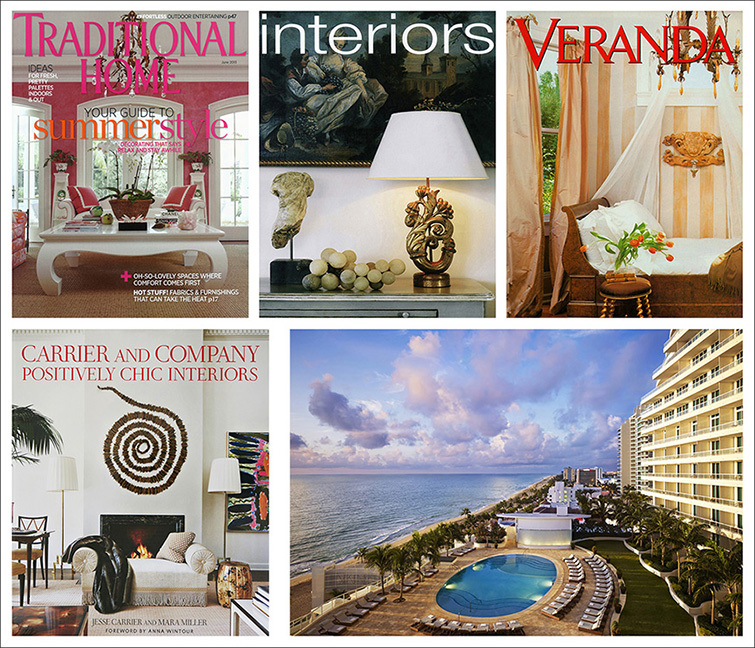 We are thrilled to be working with some of the best talents in the interior design and architecture industries. And we are so very fortunate to work with many of the amazing shelter publications and blogs. 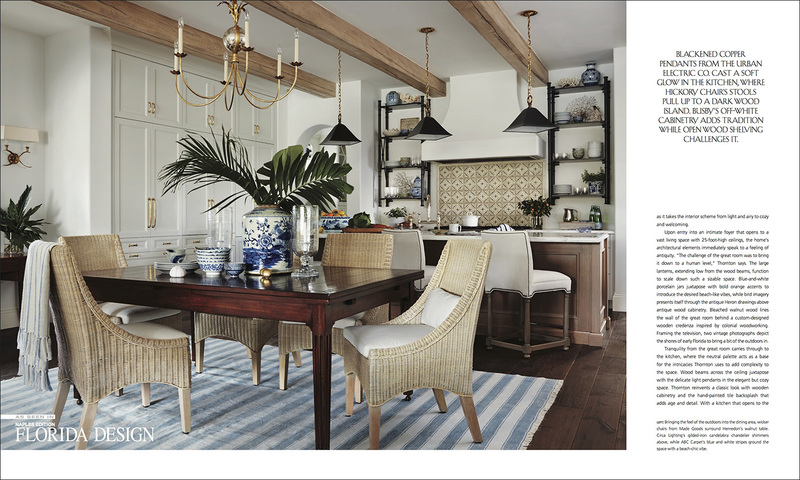 In the past year, we shot on assignment for Traditional Home, Coastal Living and Luxe magazines. 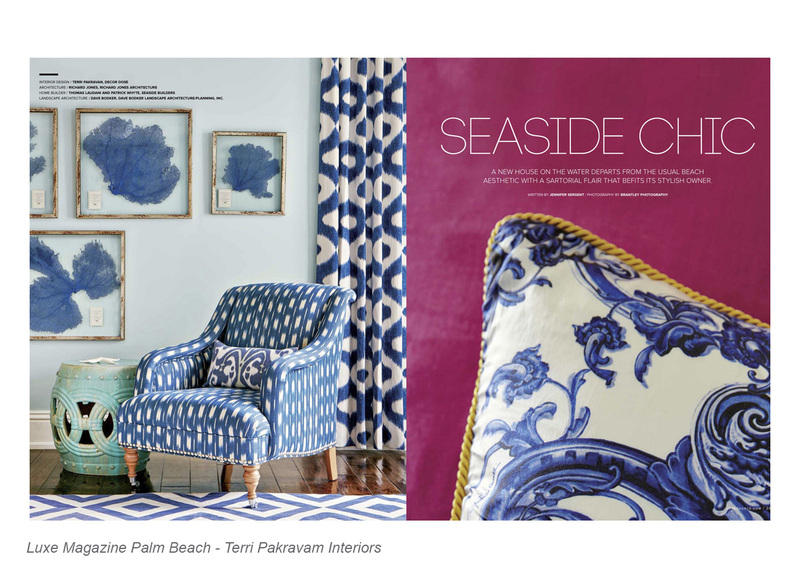 Photography of our client’s work also appeared in Florida Design, City & Shore, Miami Home & Decor, Palm Beach Illustrated, House of Turquoise Blog, Domino Blog, and AD Daily. 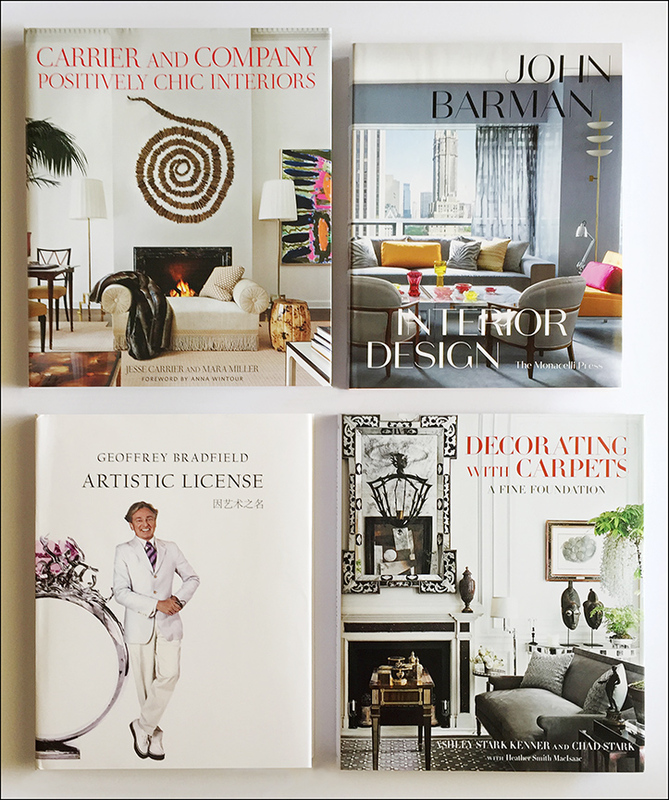 We are part of three design books to hit the shelves recently – Positively Chic Carrier & Company, Decorating with Carpets Stark Carpets, and John Barman Interior Design. So here is to a new year of blogging!